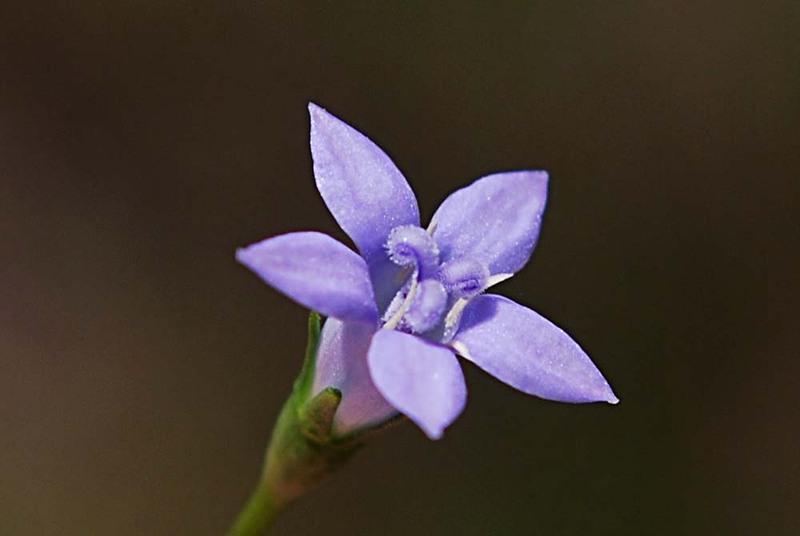 We found a large patch of marsh gentian on the west side of the entrance to the lock. 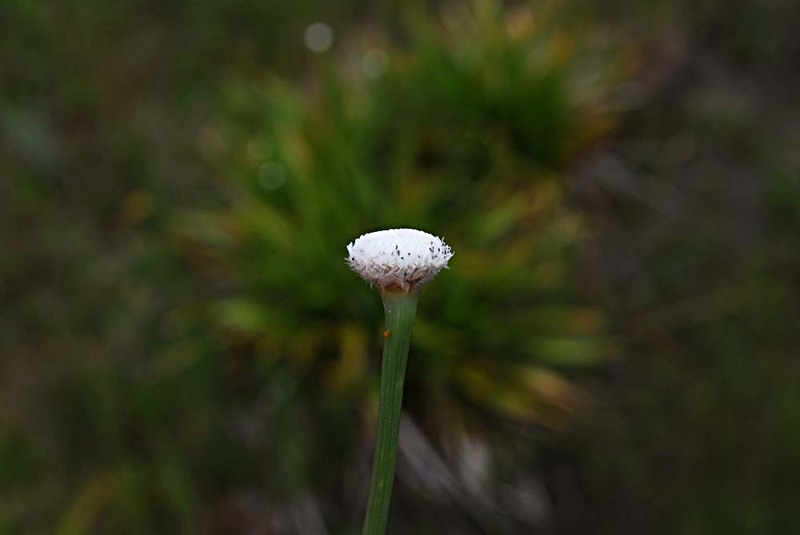 They were much taller than any I had ever seen before. 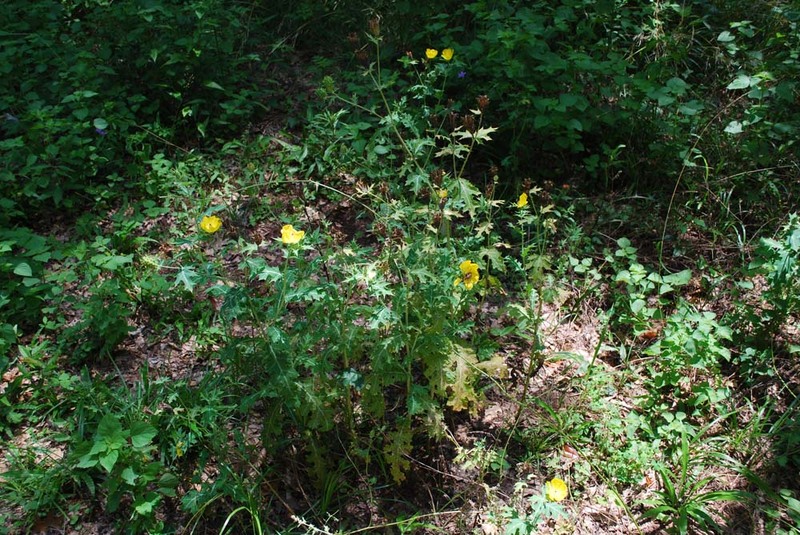 This may have been because they were surrounded by tall ragweed and other weeds. 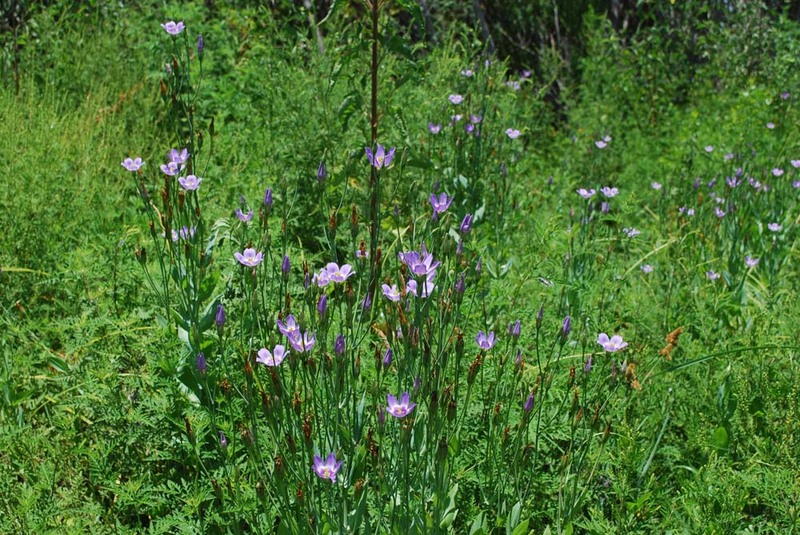 This was the largest group of marsh gentians I had ever seen. 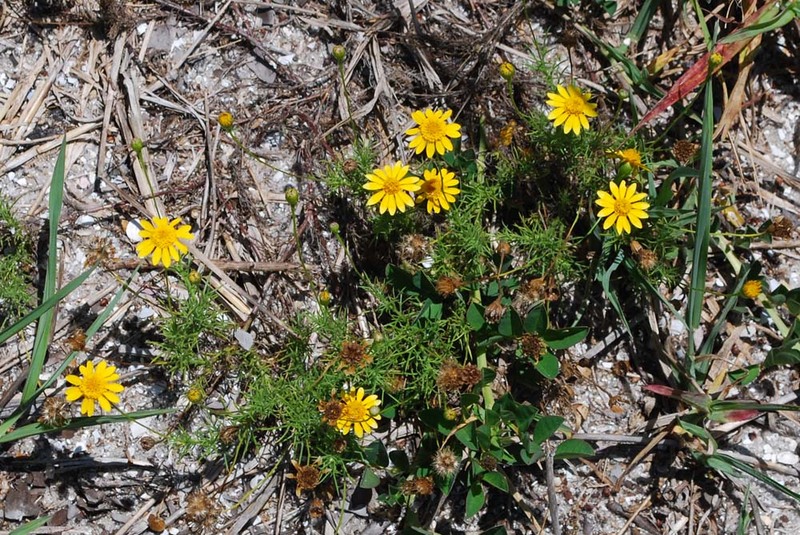 They can usually be found in small numbers along Blackpoint Drive in the Merritt Island NWR. 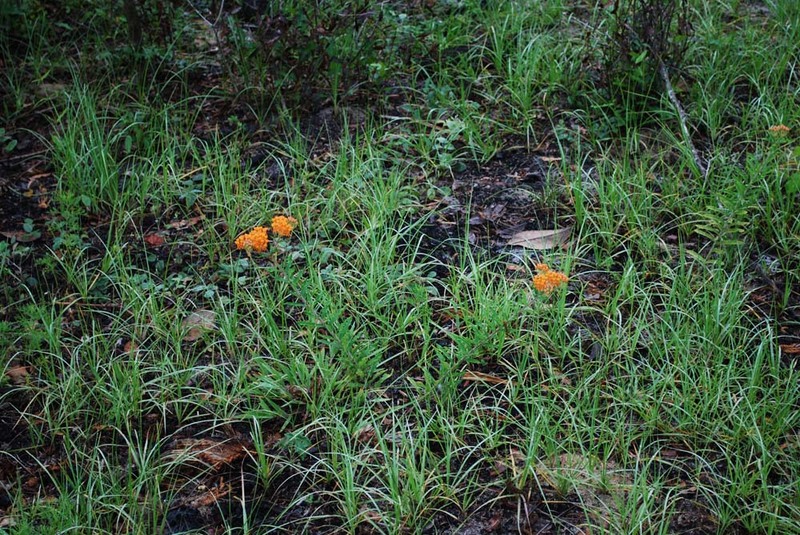 The ones there are only a foot, or so, tall. 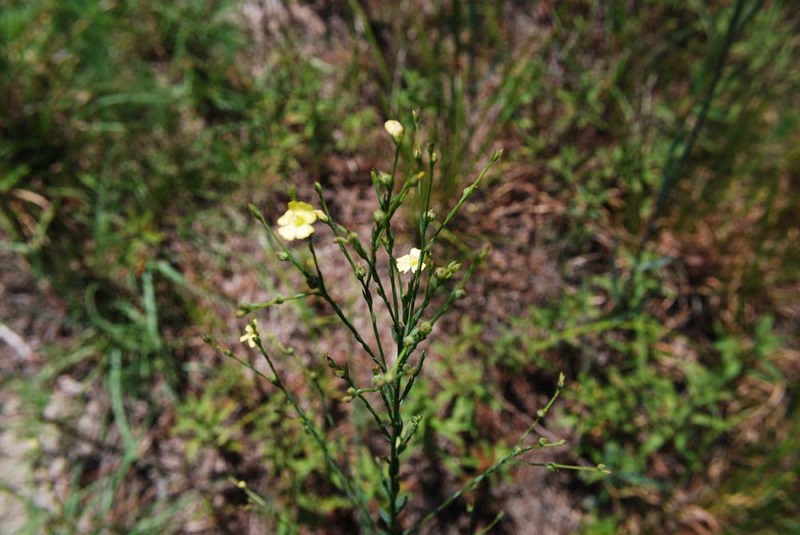 Also in the lock area was this low-growing plant. 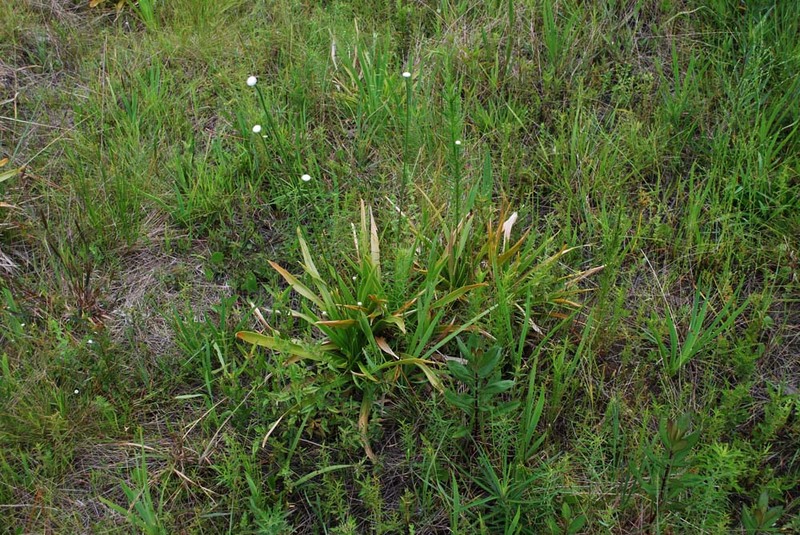 Perhaps the low growth was the result of repeated mowing. 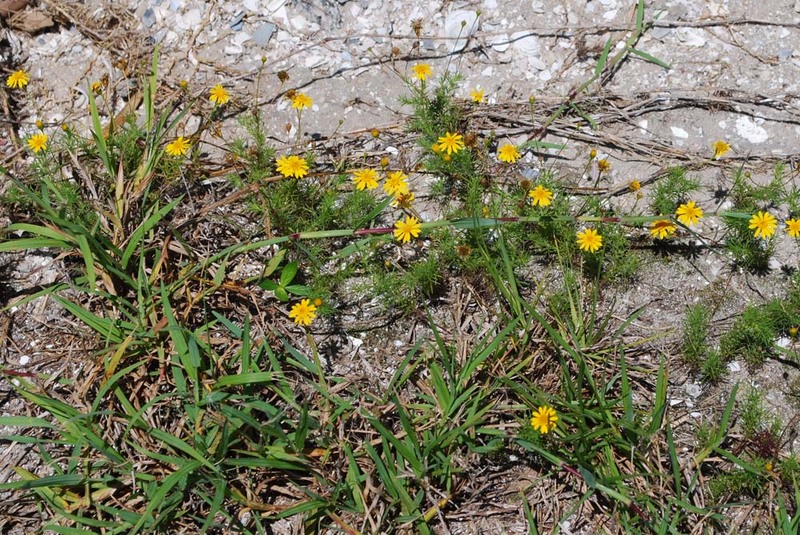 There were a large number of the plants, mostly along the edge of the roadway to the lock and along the chainlink fence, but also scattered about the grassy areas. 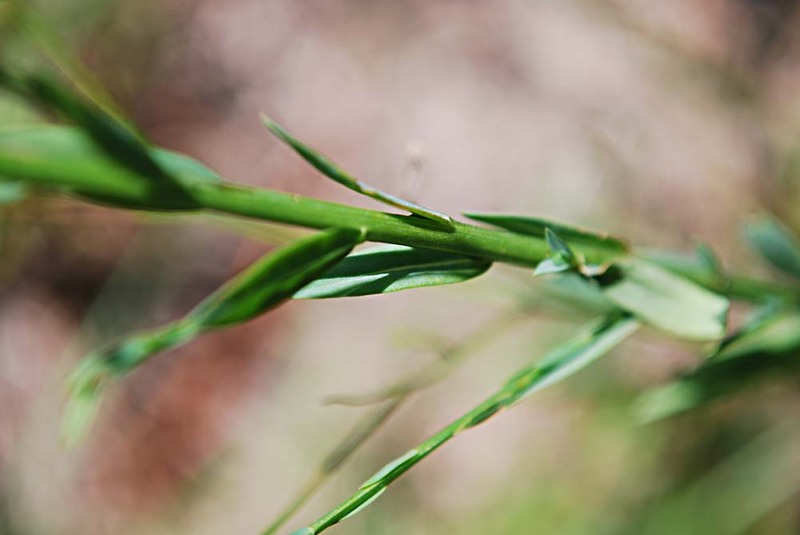 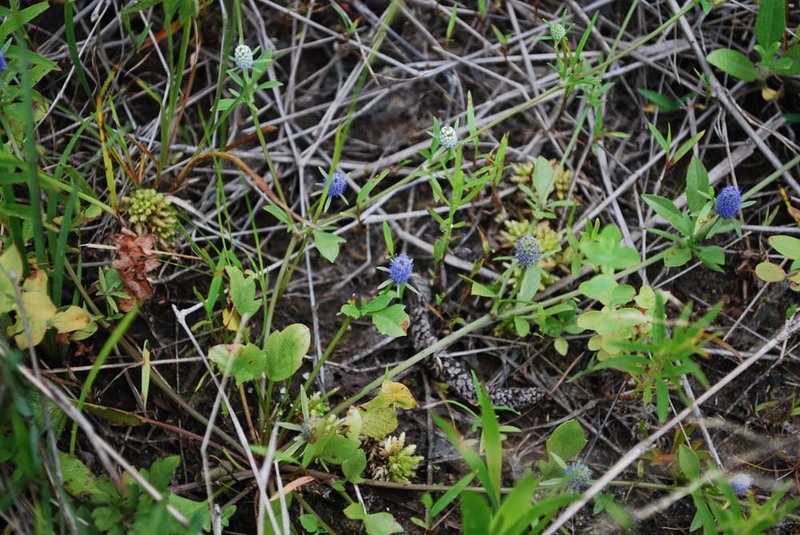 The thread-like leaves should help identify it; however, I could not find a match in any of my wildflower guides. 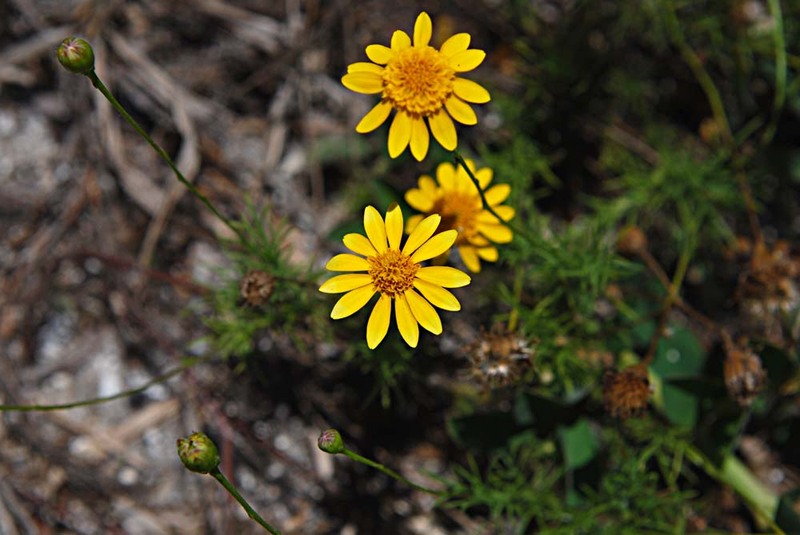 This is another posting of wildflower photos from outside the Space Coast, which I do from time to time. 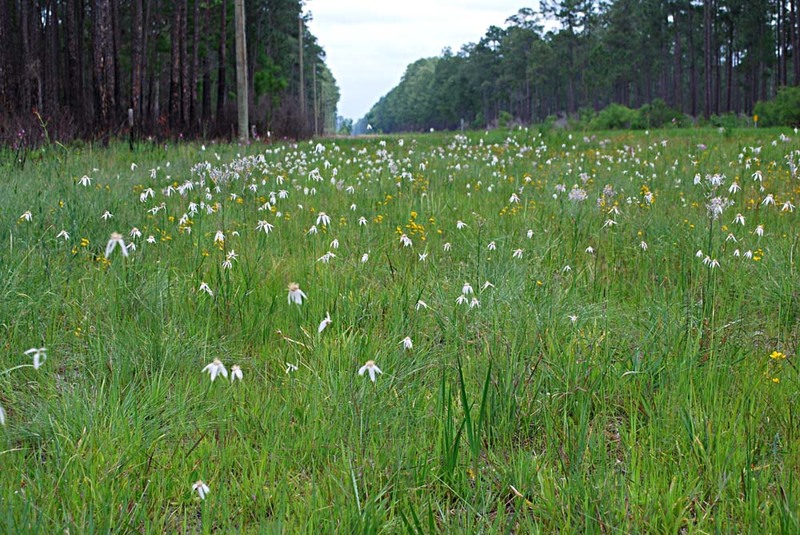 On Mother's Day weekend, my wife and I took a trip up to the Florida panhandle to see and photograph roadside wildflowers there, in particular along SR 65 south of Hosford in the Apalachicola National Forest. 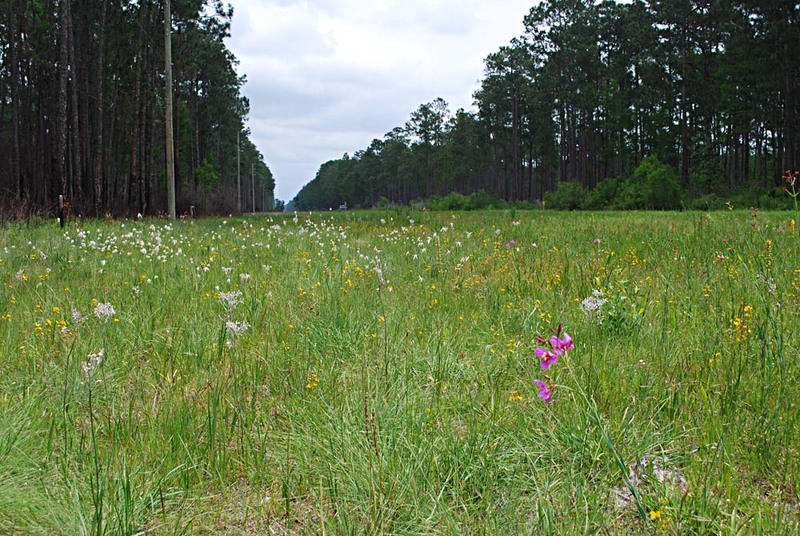 This area is considered the premiere location in Florida to view native wildflowers and grasses. 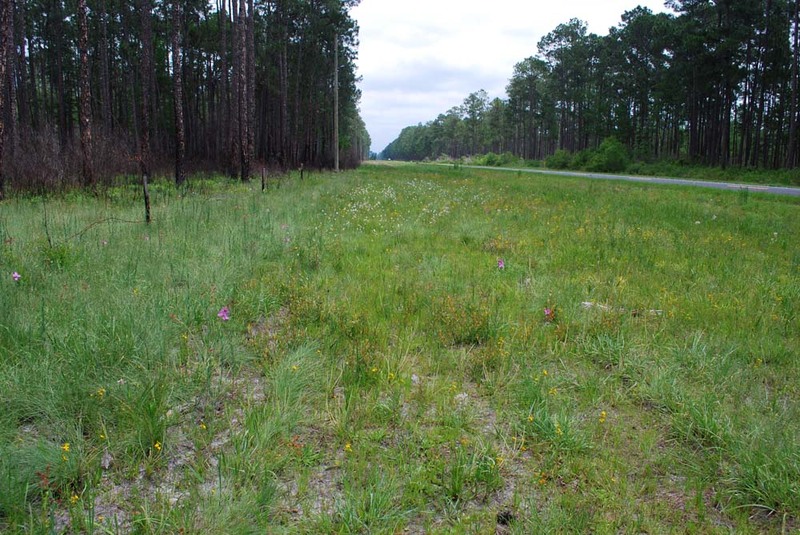 It is even considered by some experts to be the best native wildflower road in the lower South. 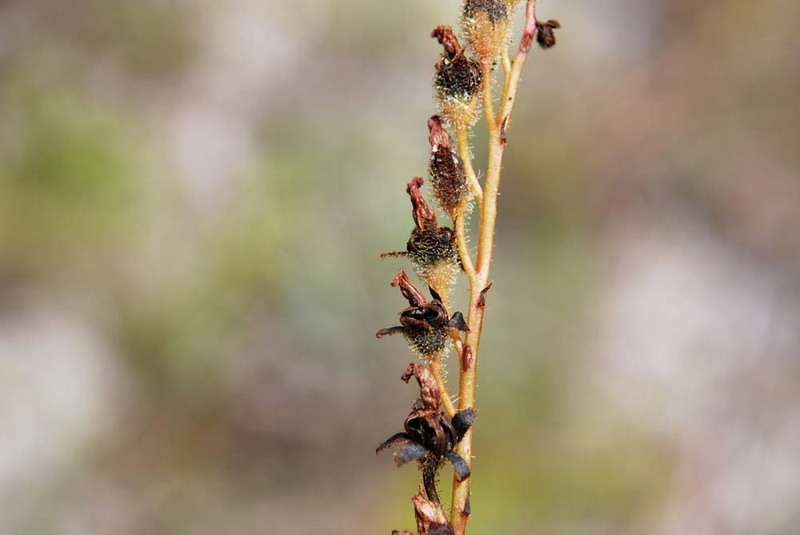 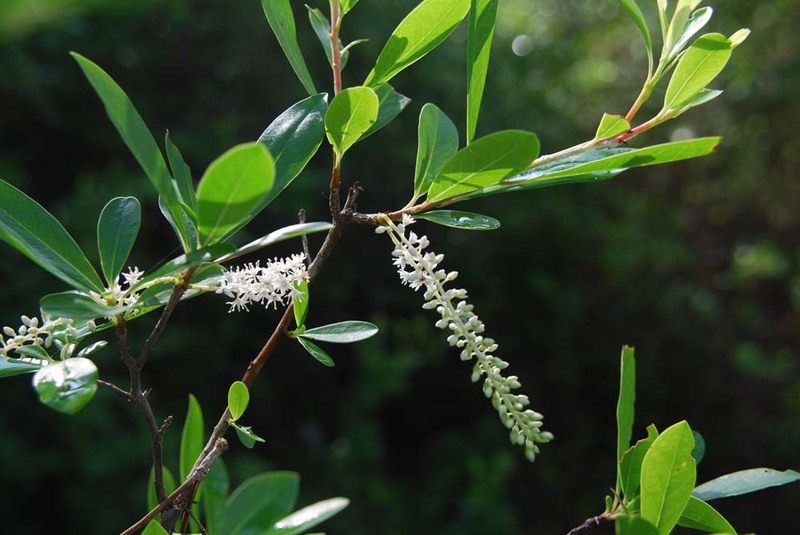 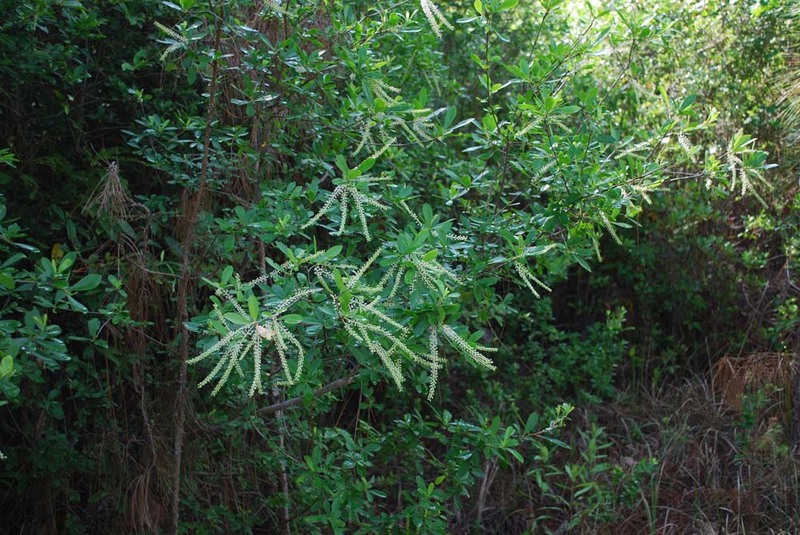 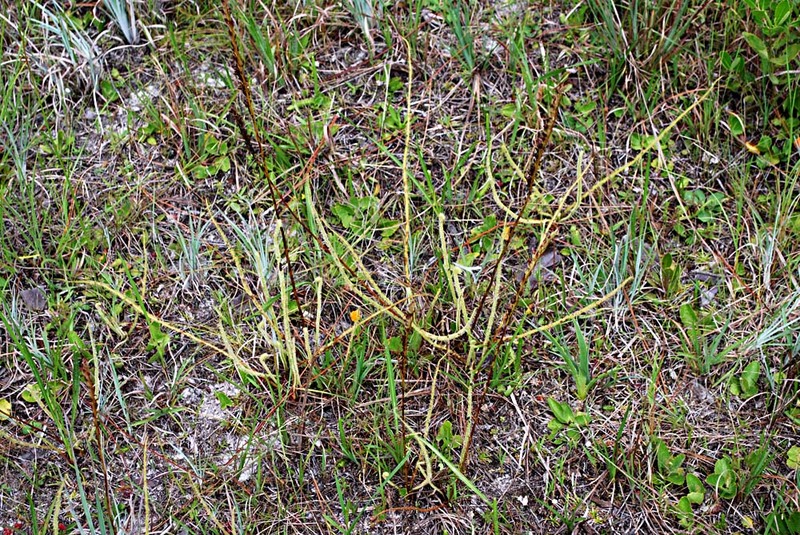 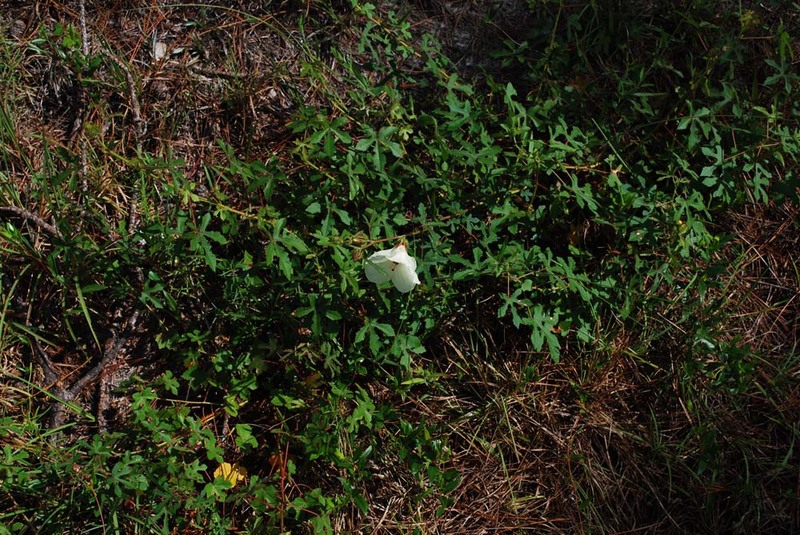 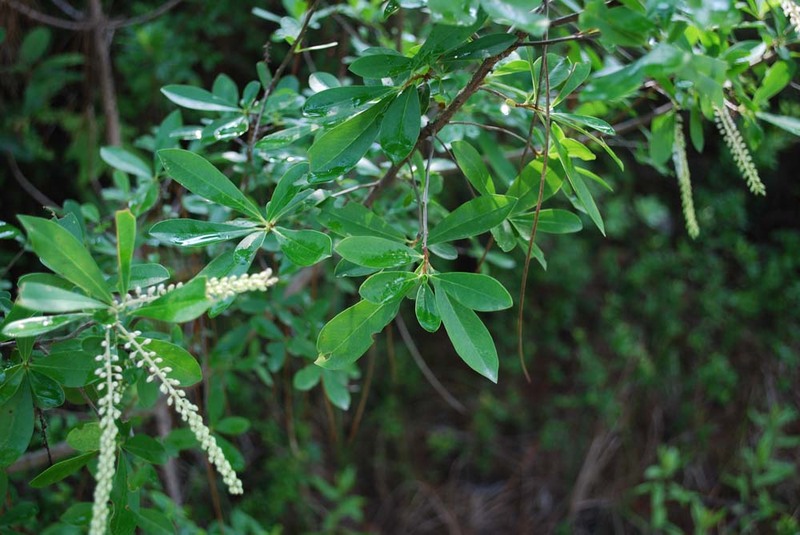 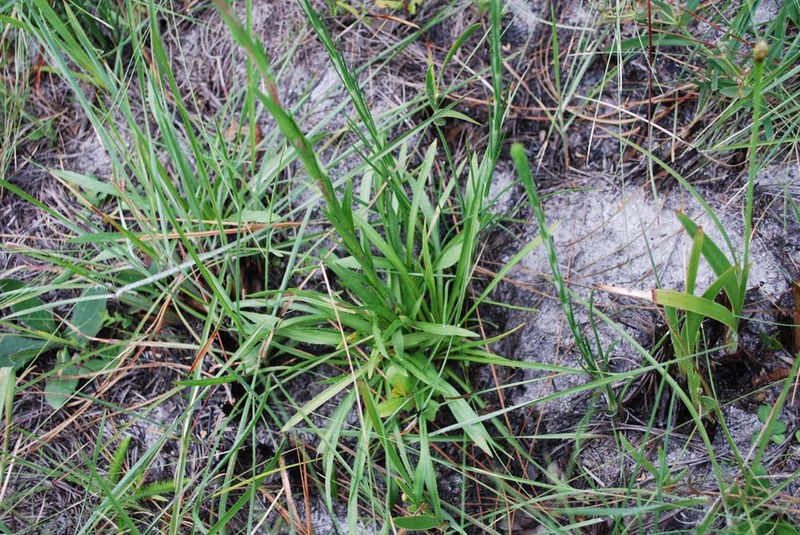 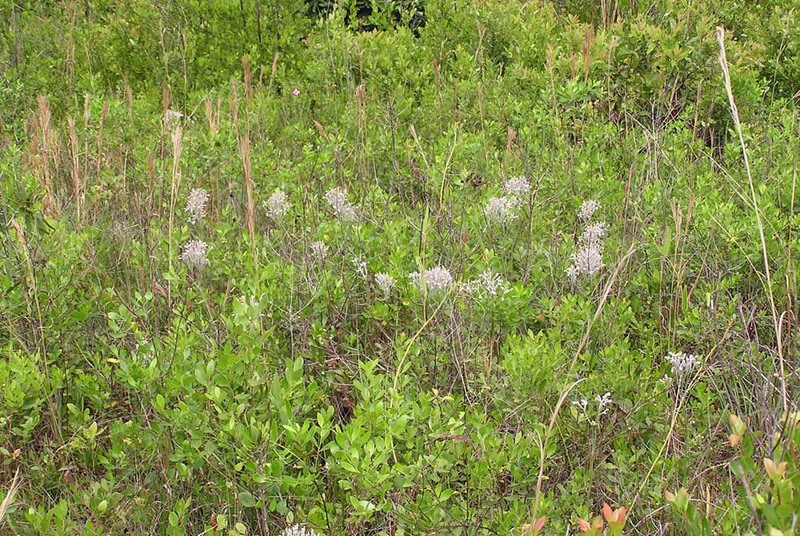 Many of the plants shown in this posting are found, in Florida, only in the panhandle. 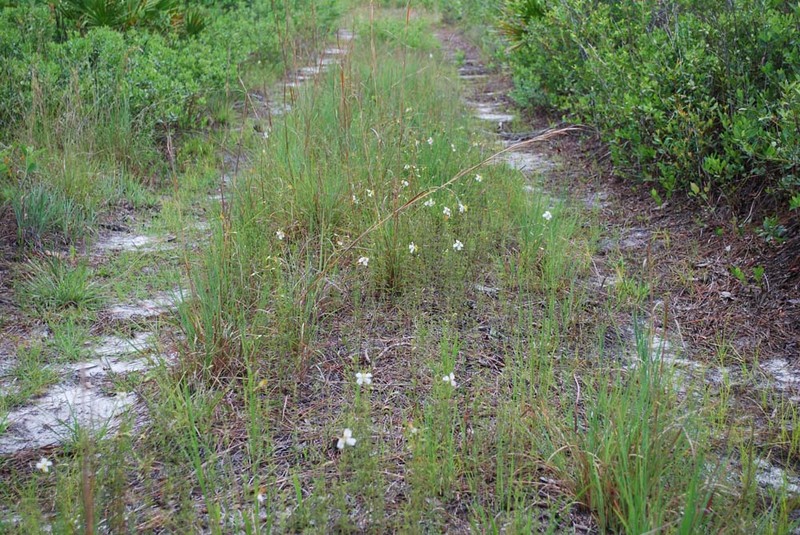 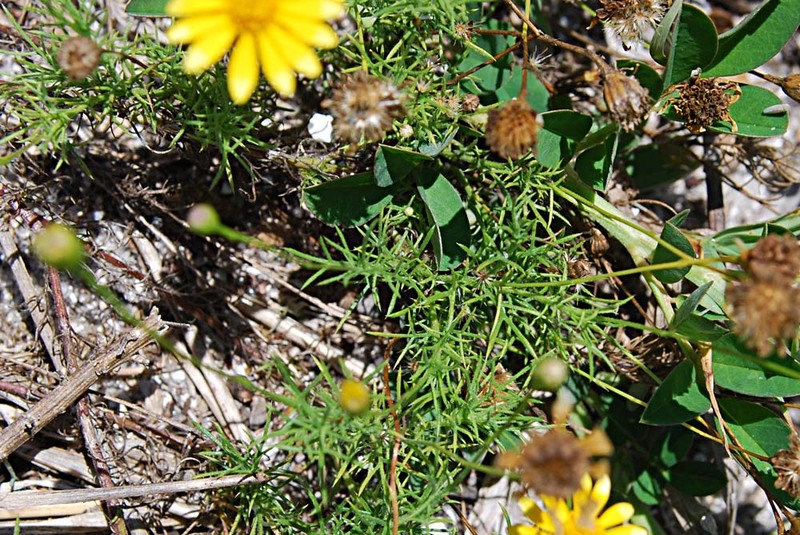 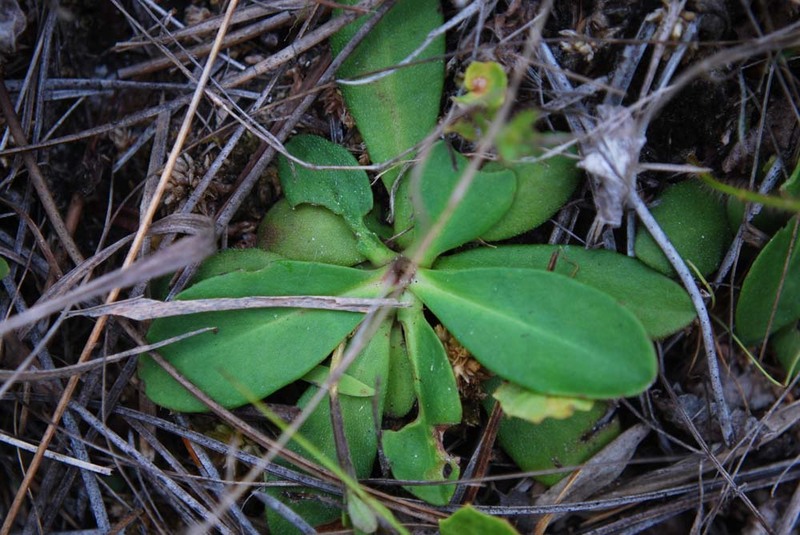 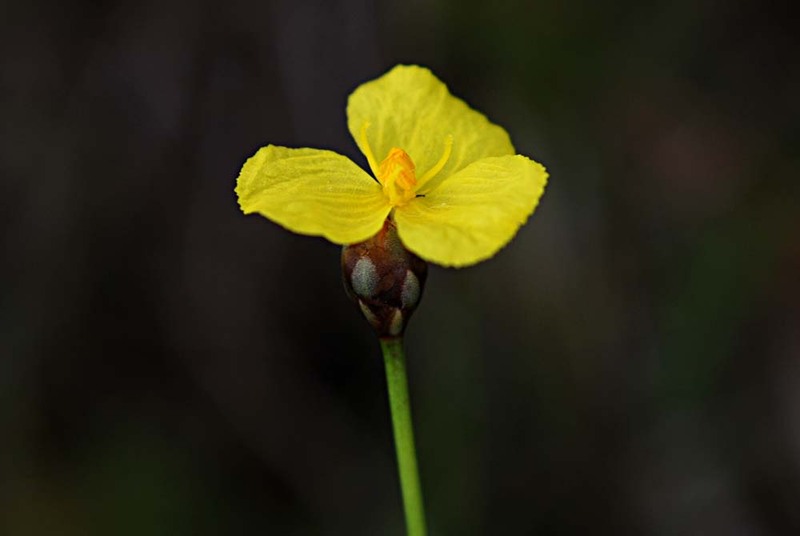 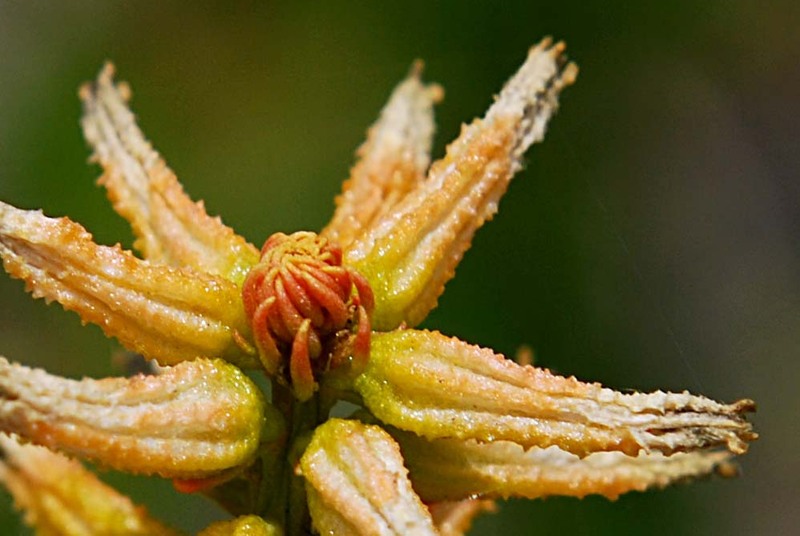 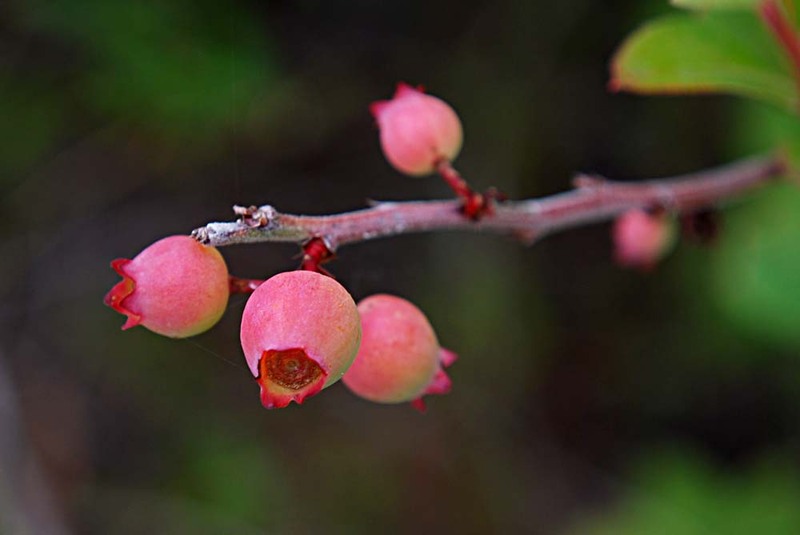 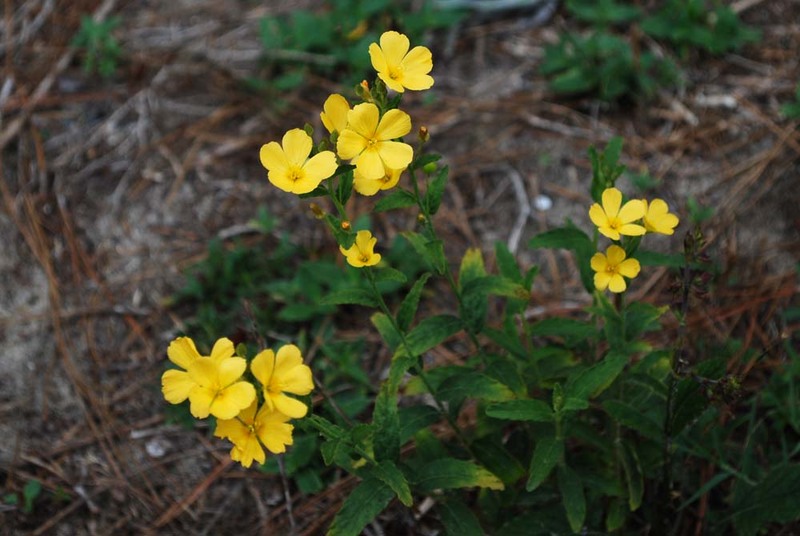 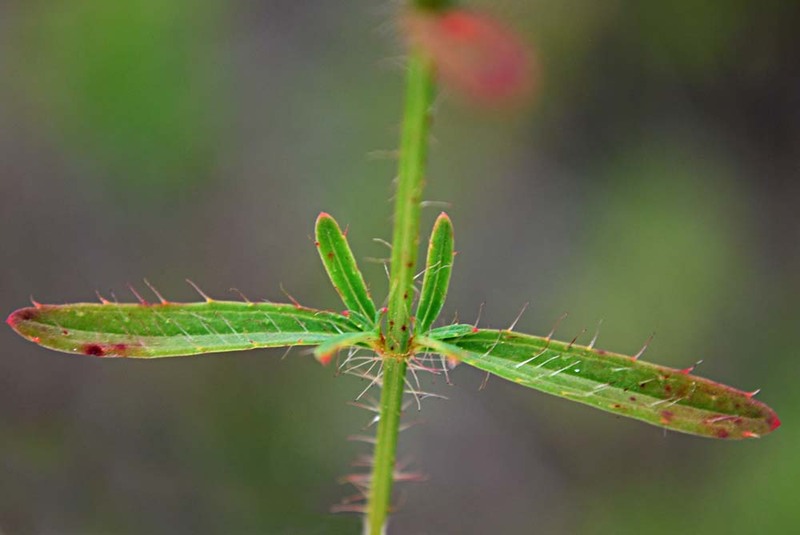 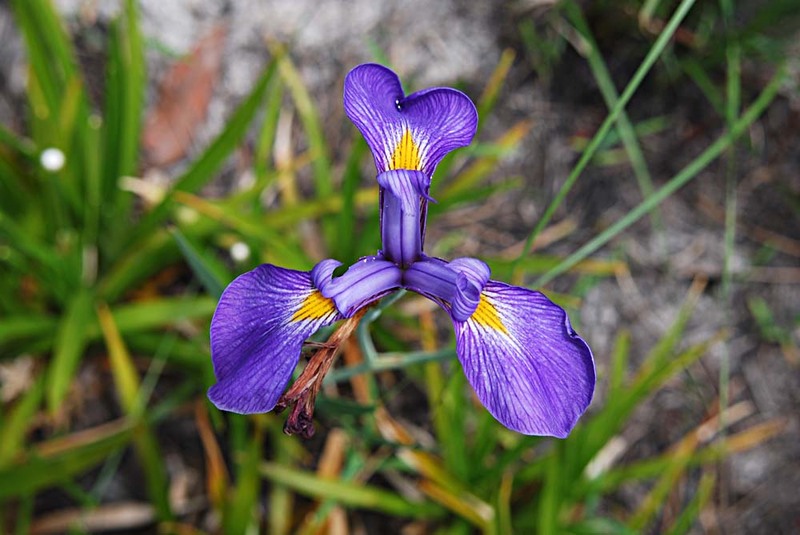 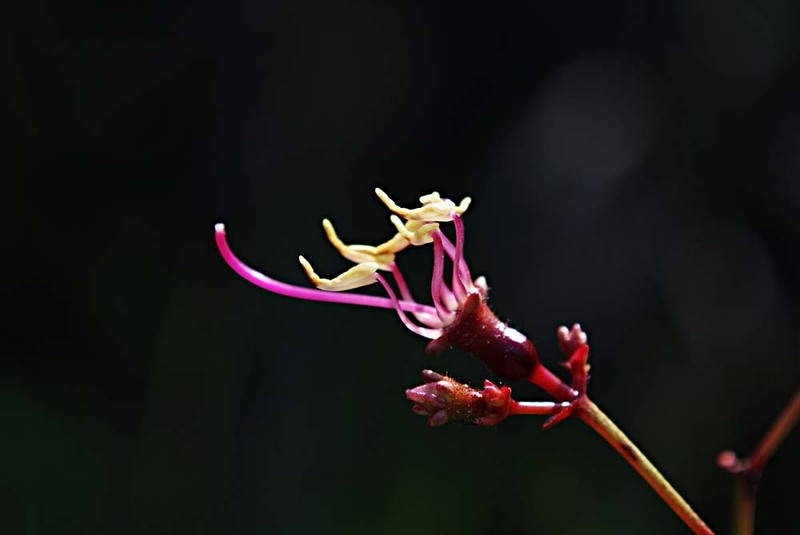 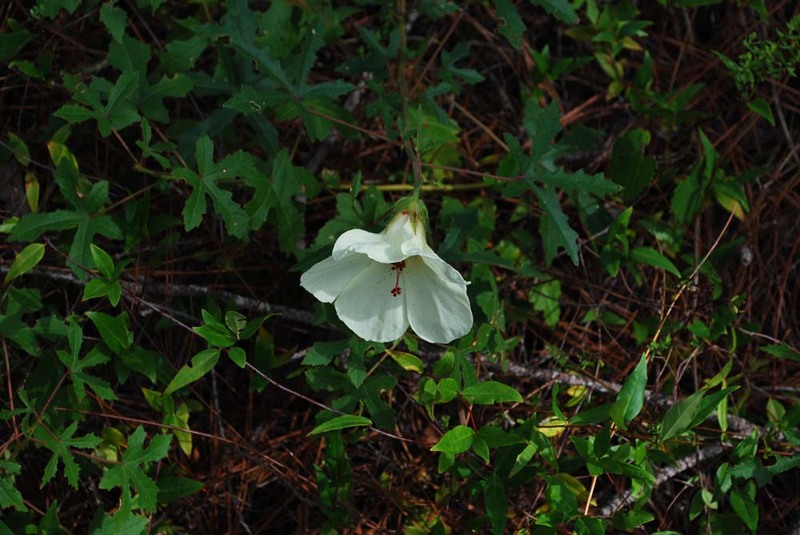 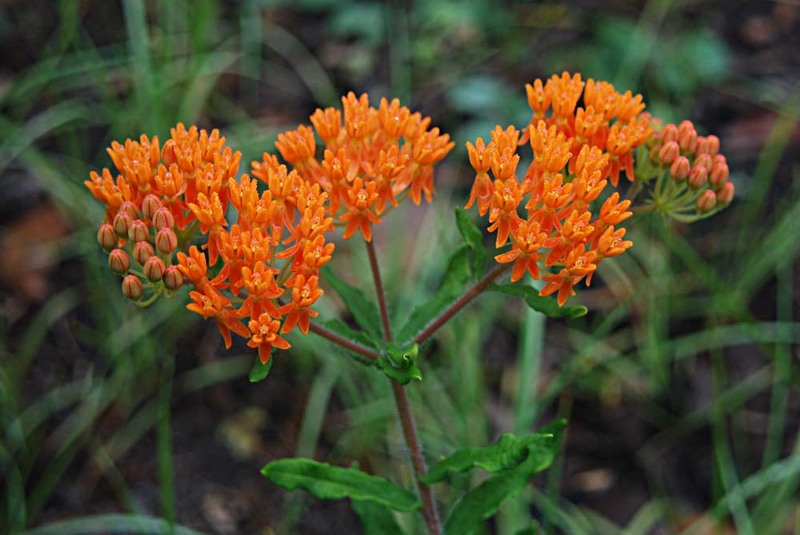 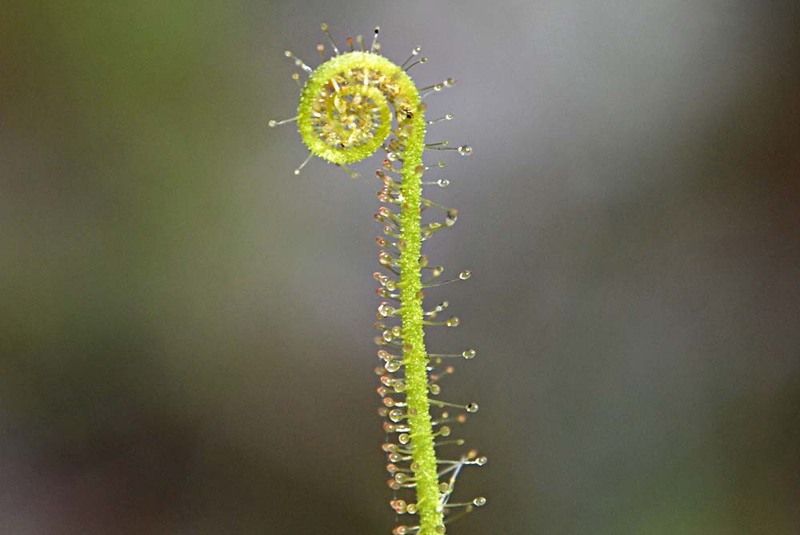 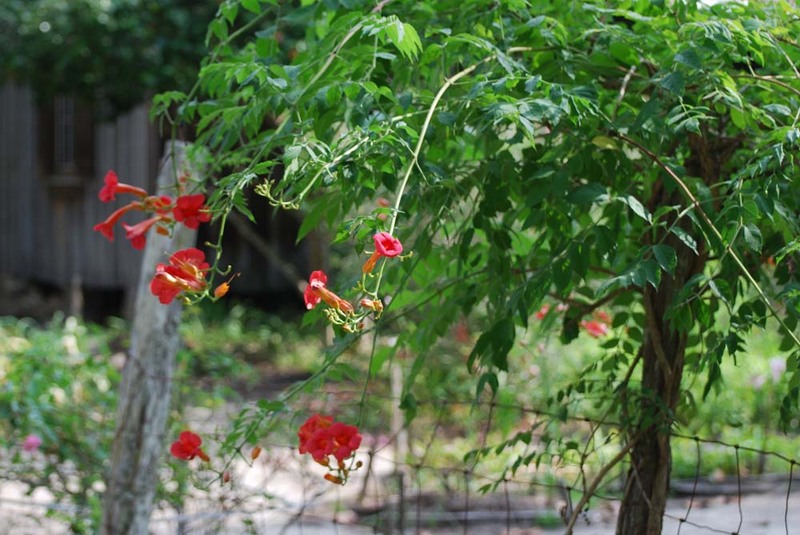 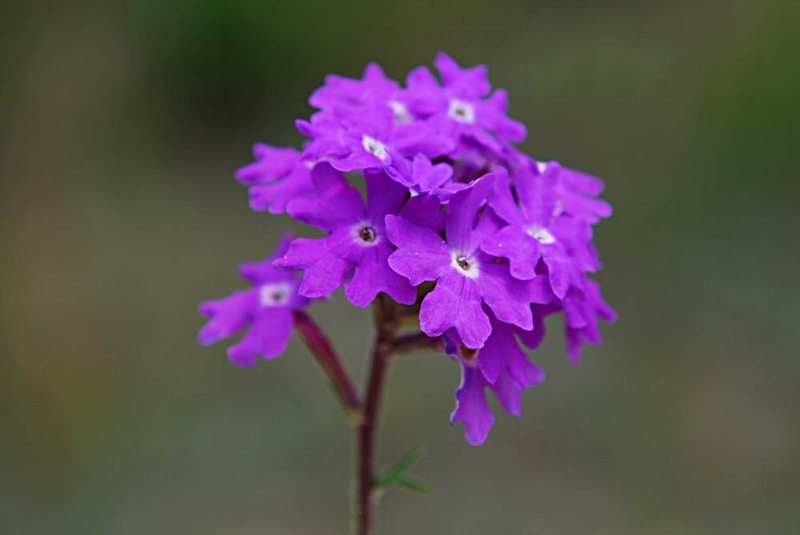 Beginning in 2009, researchers sponsored by the Florida Wildflower Foundation, began mapping Florida's wildflower populations through road- and trail-side surveys. 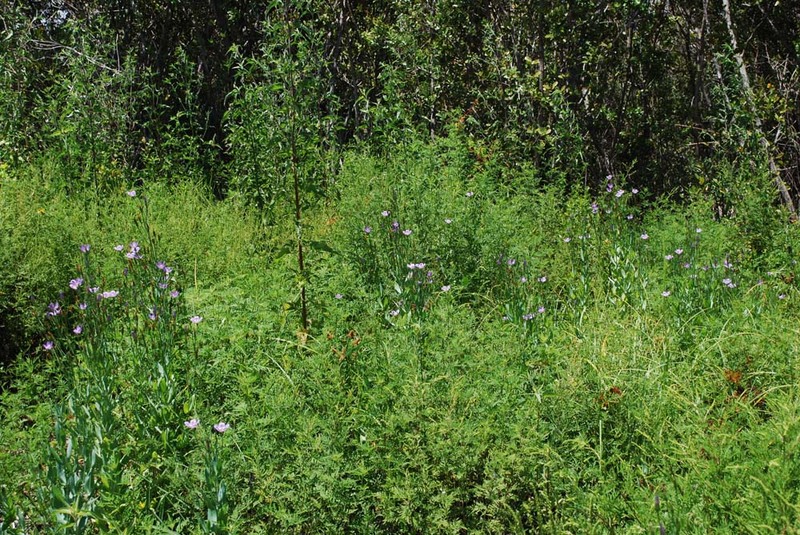 The goal of this research, conducted by Drs. 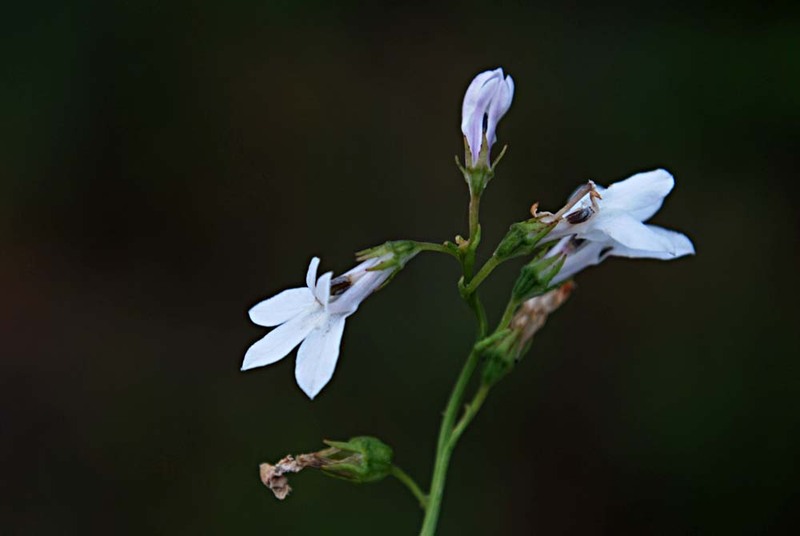 Jeff Norcini and Gil Nelson, is to document natural and planted populations, while defining routes where motorists, cyclists and hikers can view showy stands of native wildflowers typical of a region. 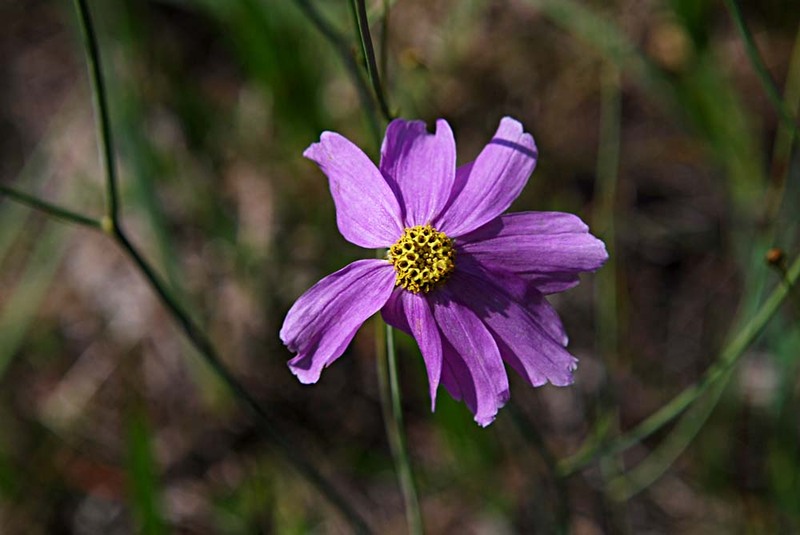 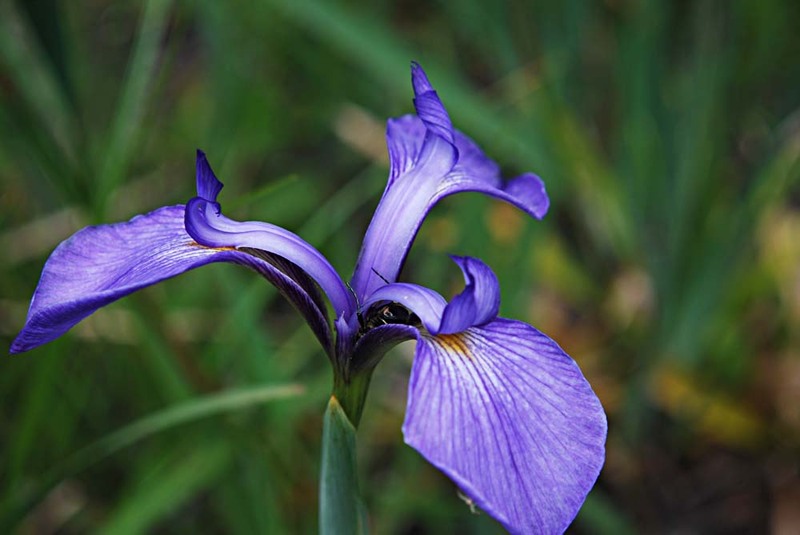 The work is helping to establish wildflower tourism as an ecotourism opportunity. 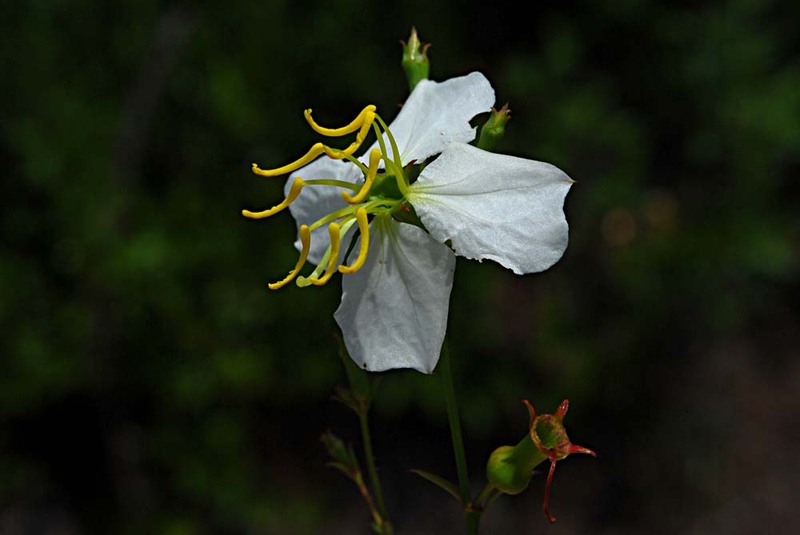 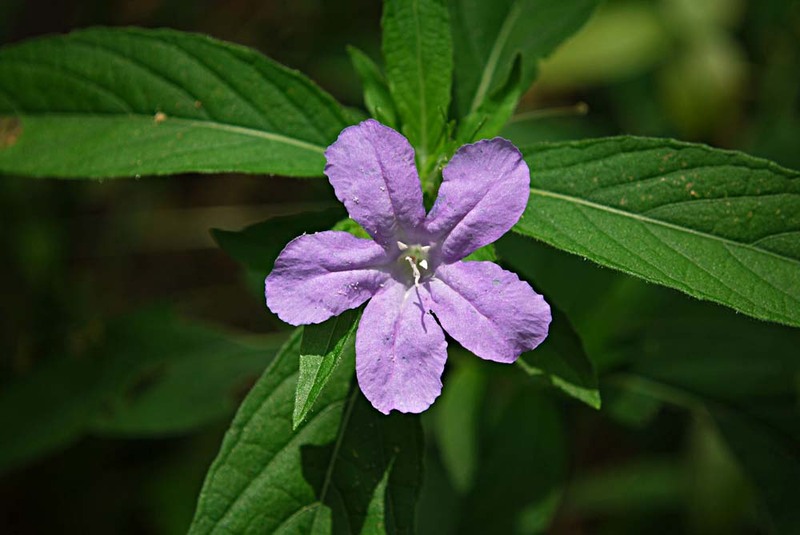 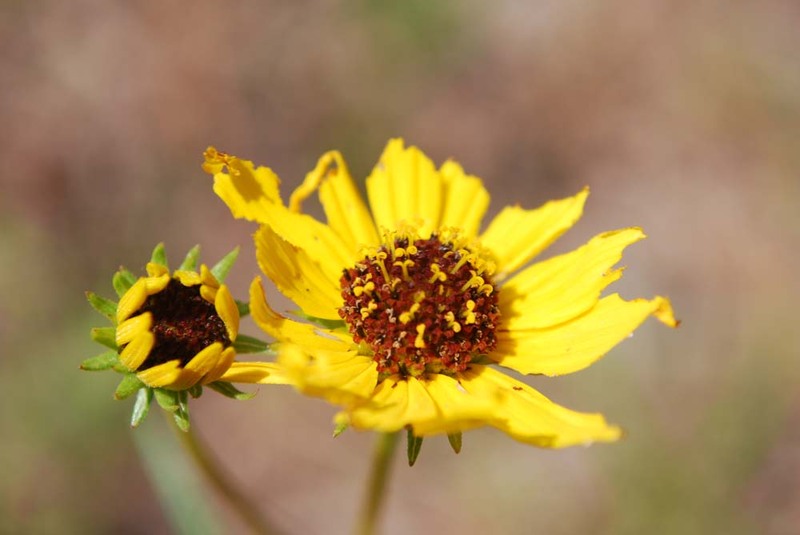 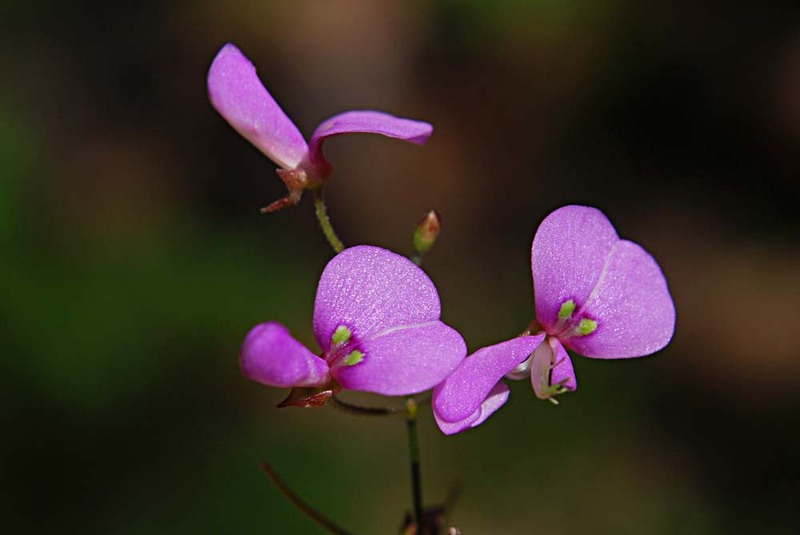 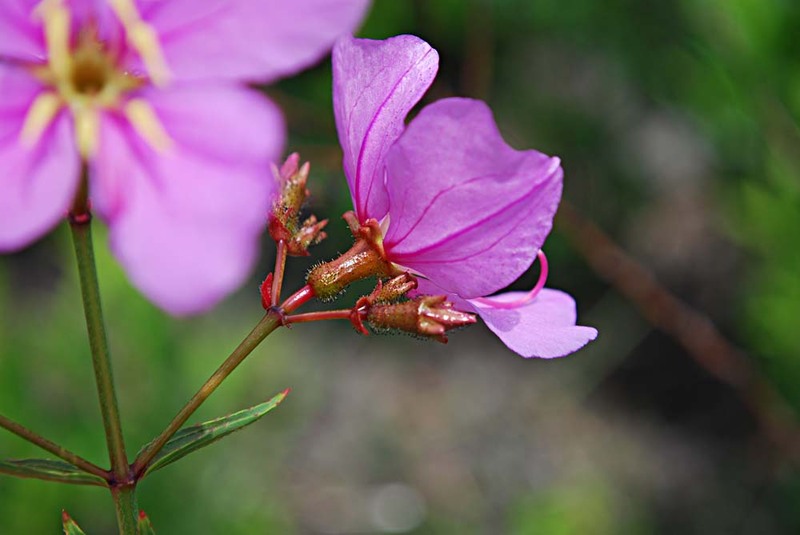 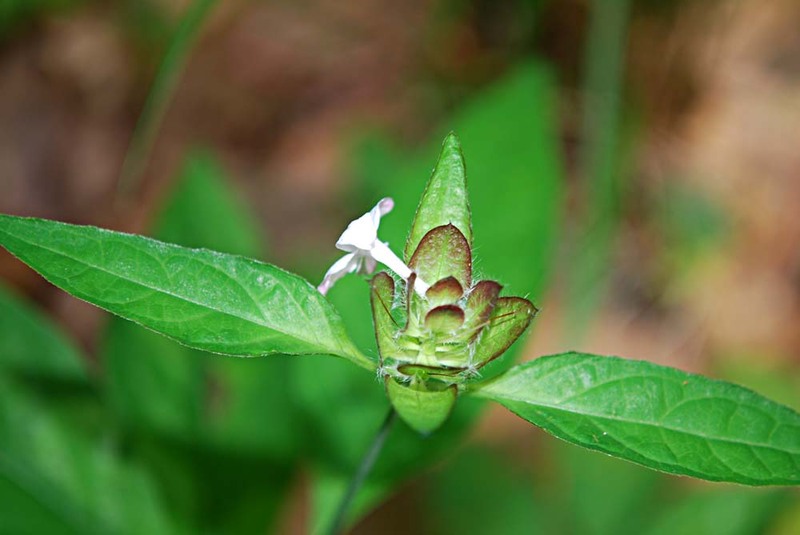 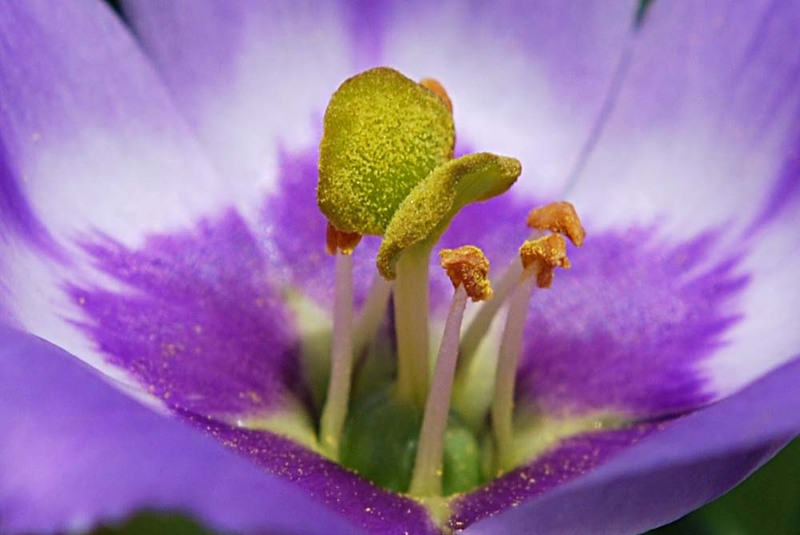 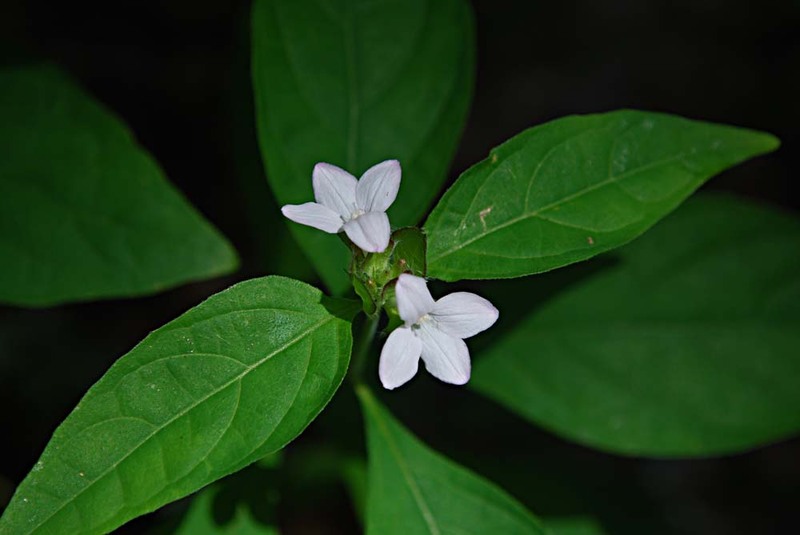 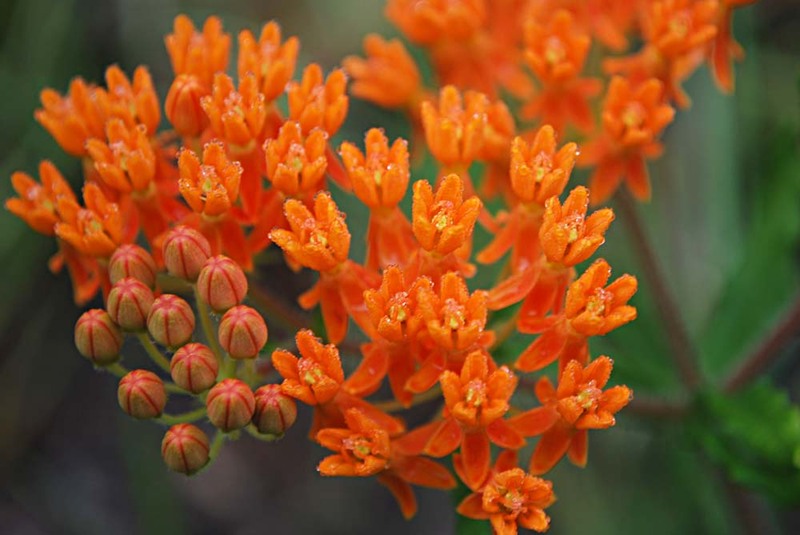 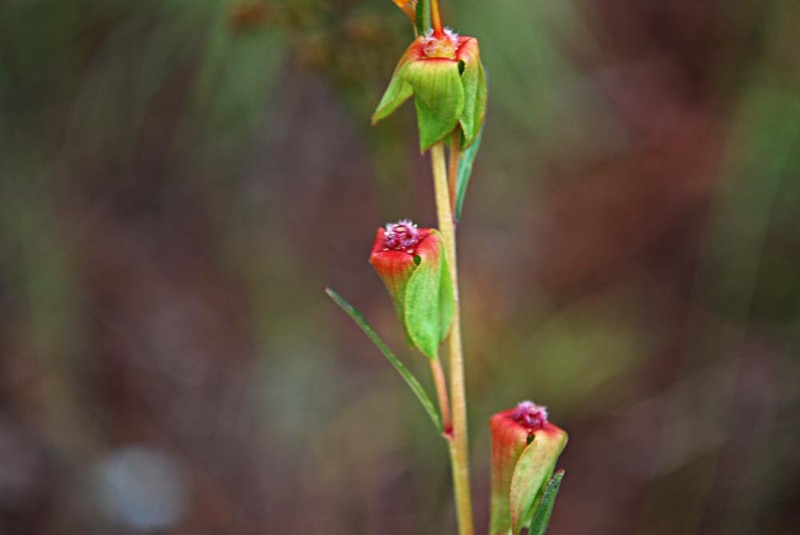 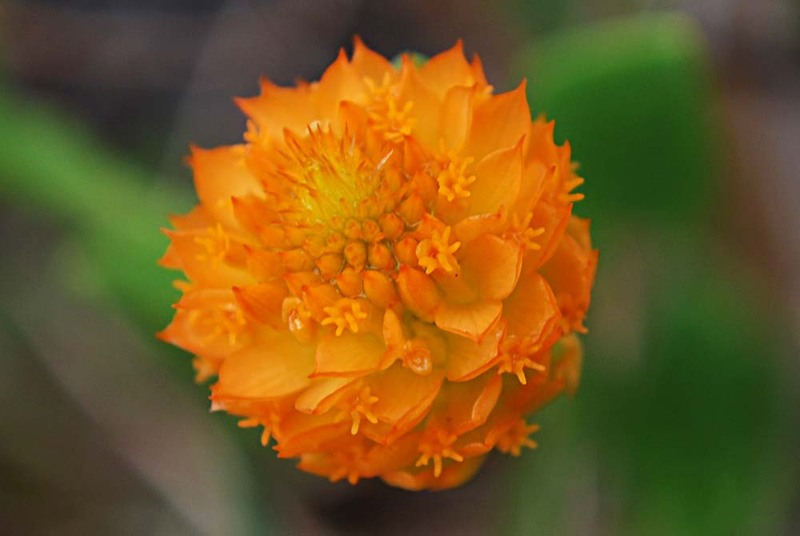 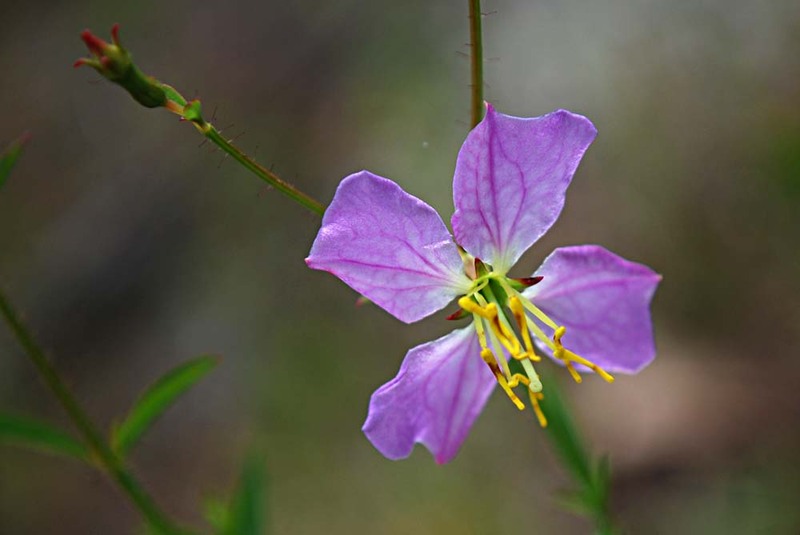 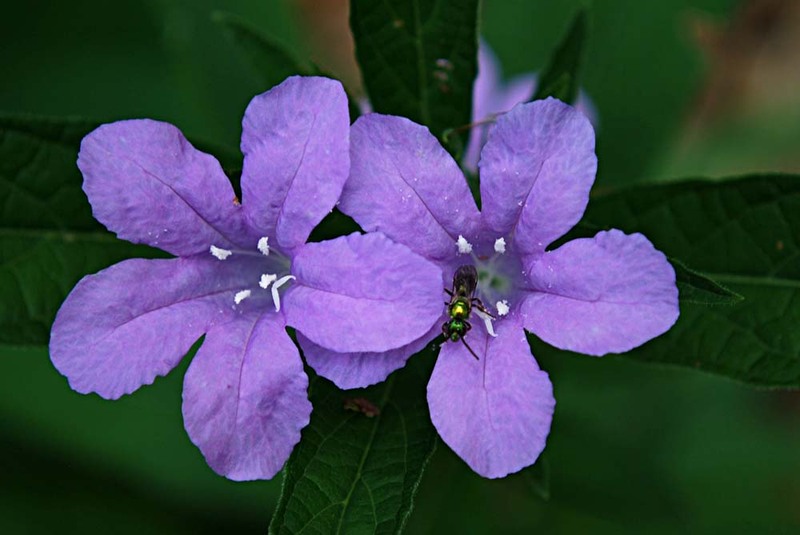 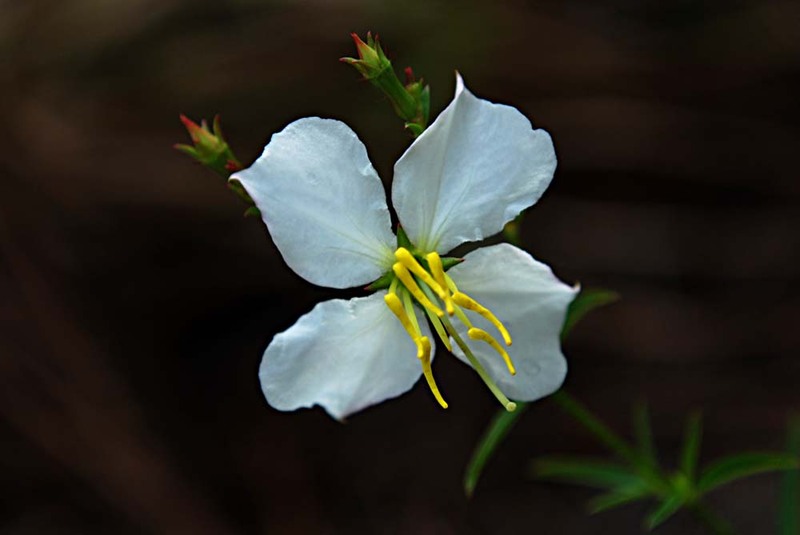 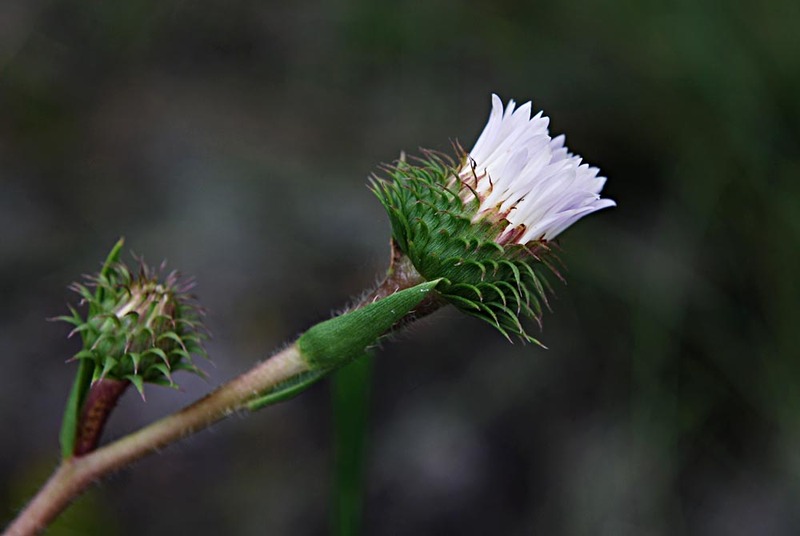 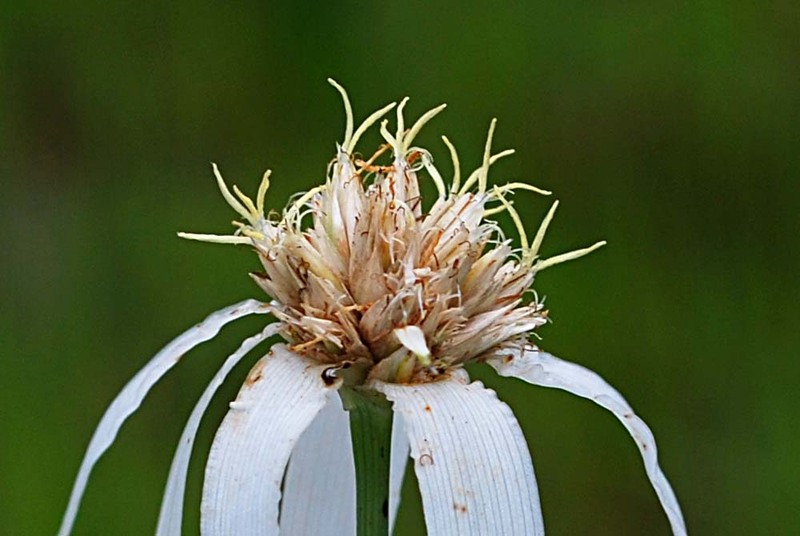 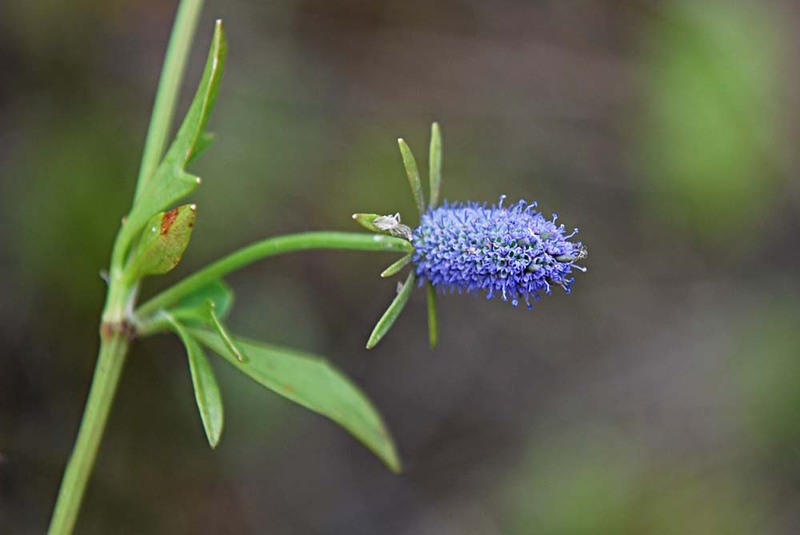 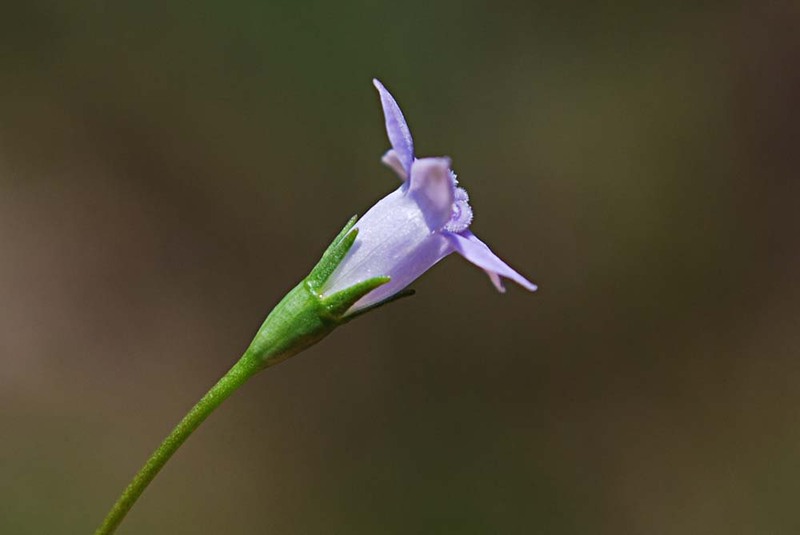 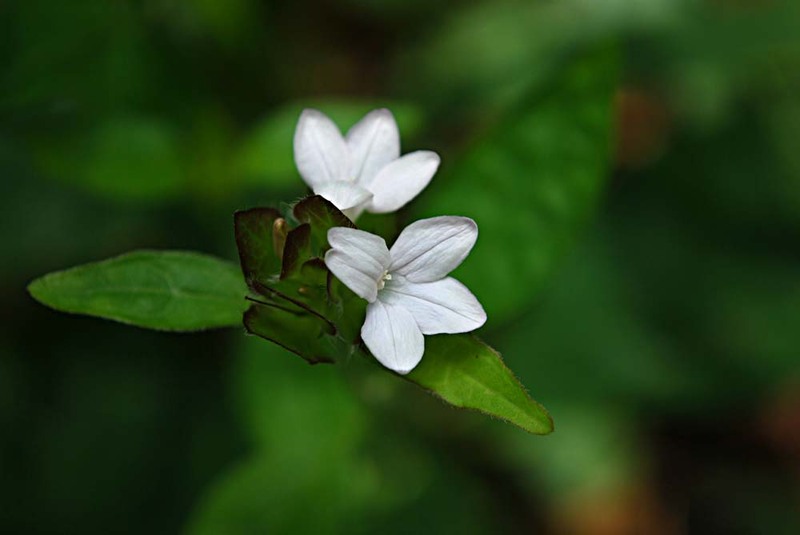 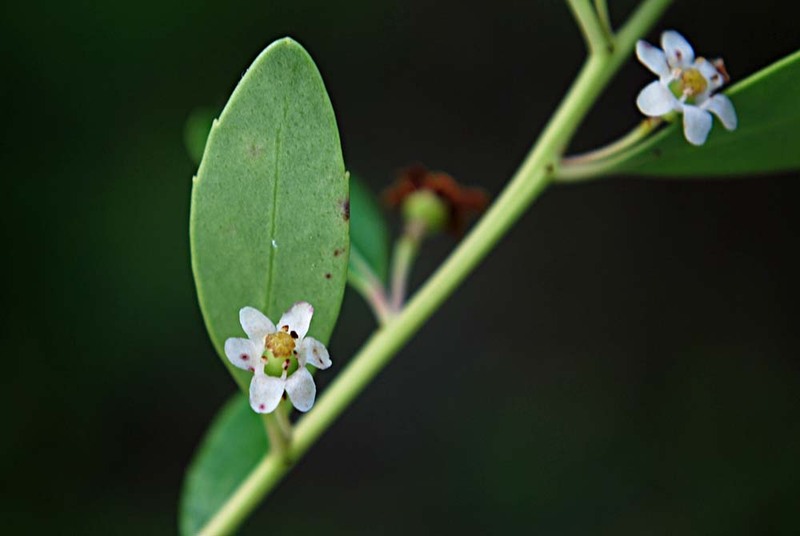 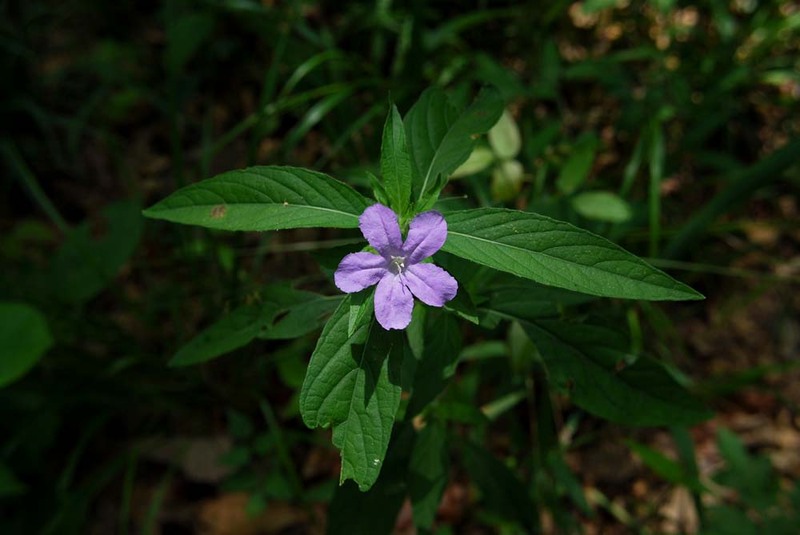 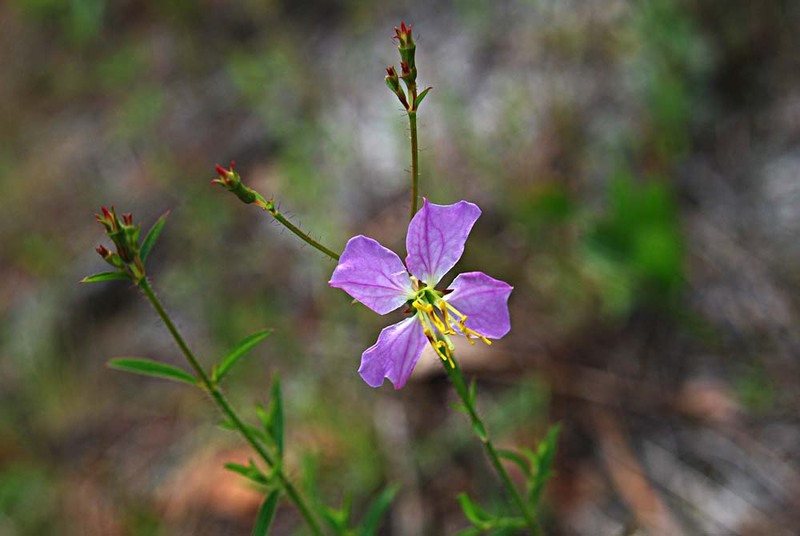 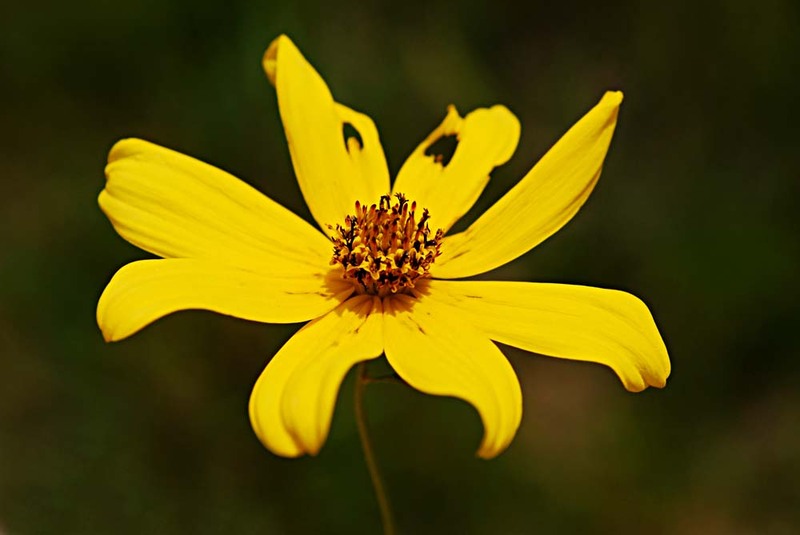 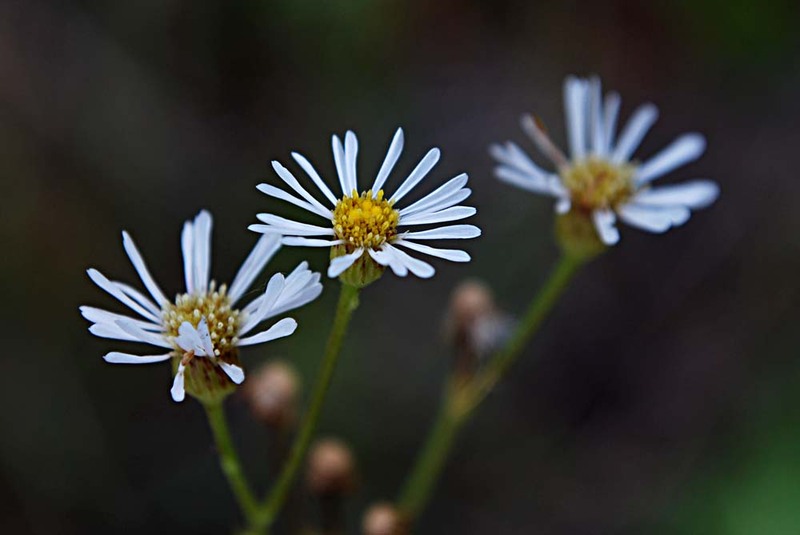 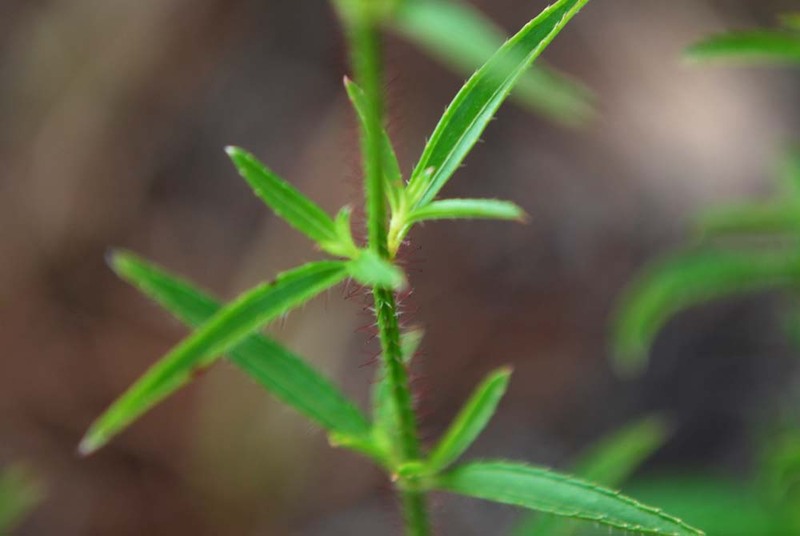 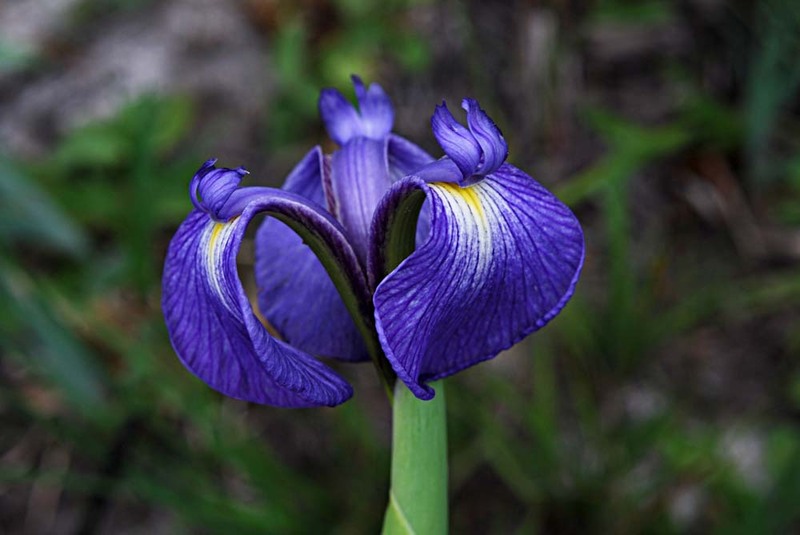 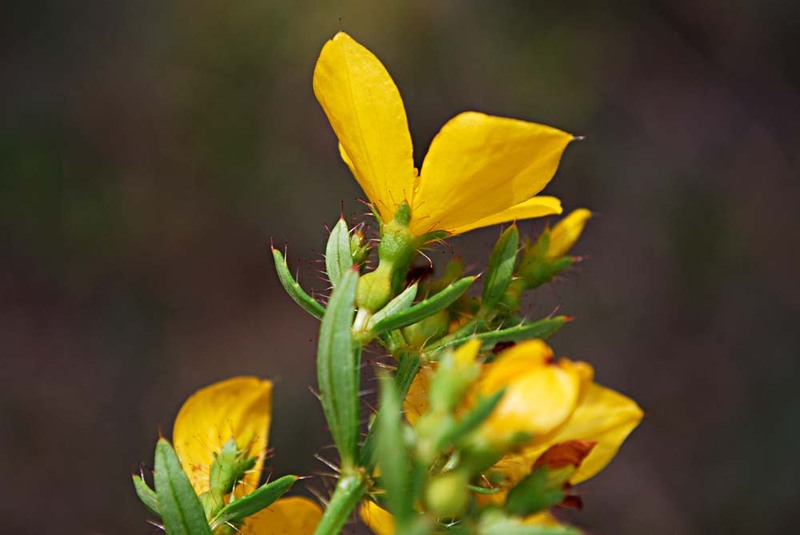 Maps of sightings will help residents and visitors look for and learn about Florida's native wildflowers, while helping to promote their planting, preservation and enjoyment. 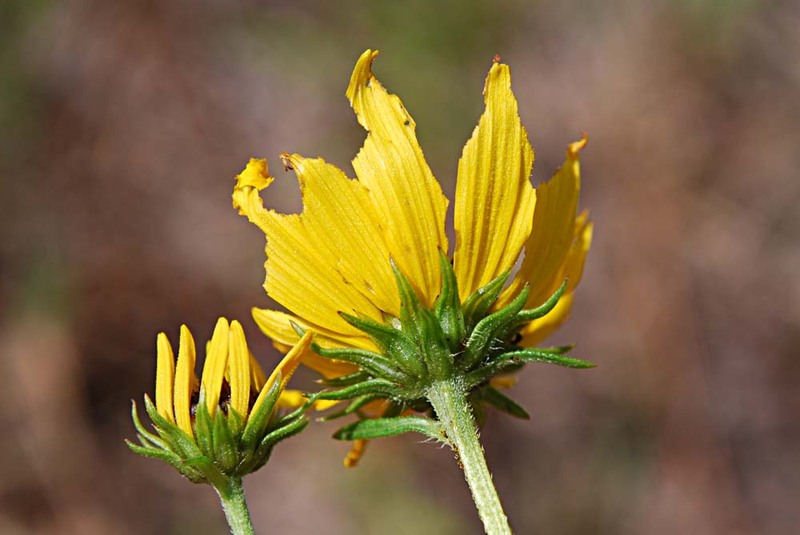 To learn more about the roadside wildflowers of the panhandle, see the 2010 Wildflower Survey, which includes a detailed map (shown below) and a listing of roadside species. 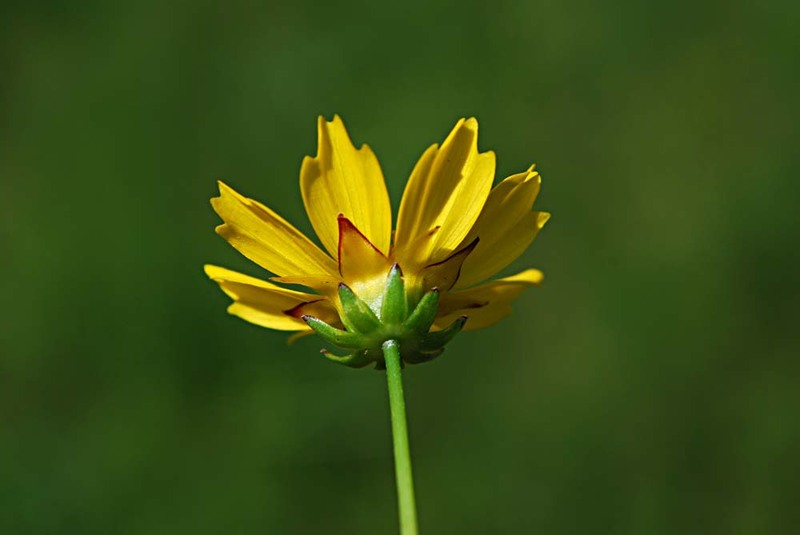 Note: Several of my identifications are tentative, based only on my photos. 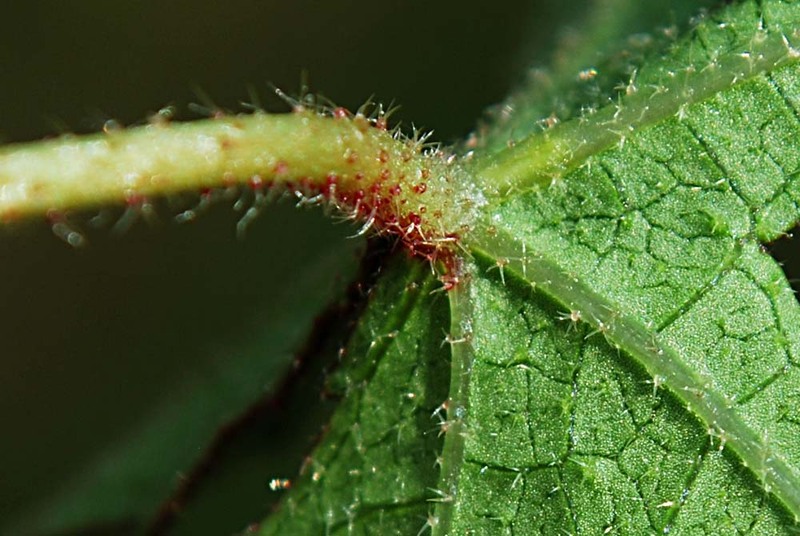 Sometimes a positive ID requires observation of plant details that I failed to capture. This trip added 24 species new to this blog. 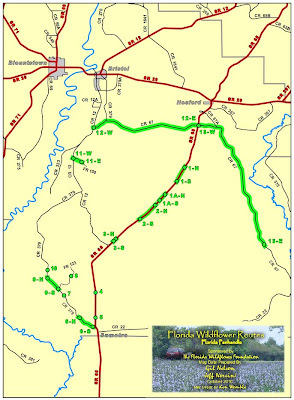 Our stops along SR 65 included PhotoSites 1, 1A, 2, and 3. 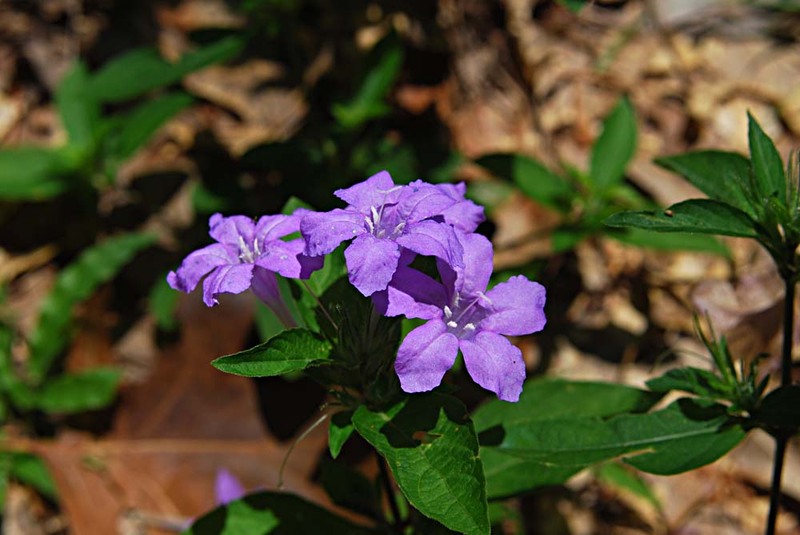 Our first stop (late Saturday) was at Dudley Farm Historic State Park, near Newberry, where these first three wildflower species were photographed. 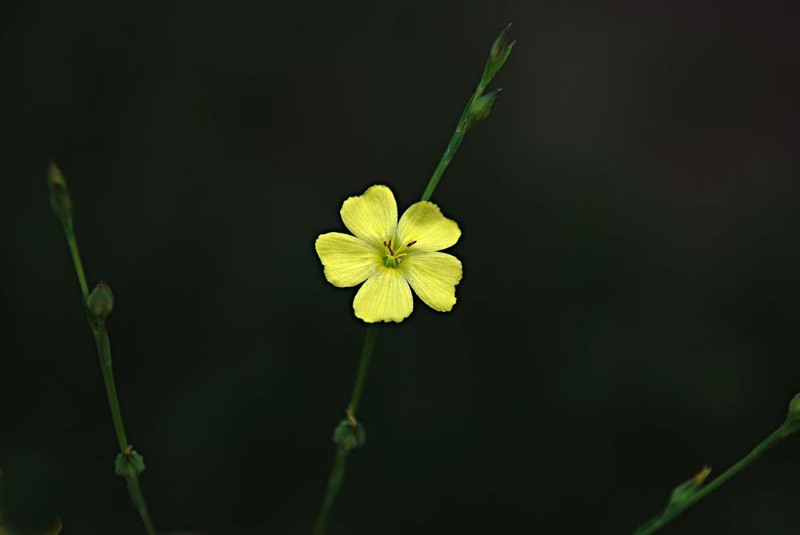 The above yellow flower was common along the roadsides and in the fields surrounding the farm. 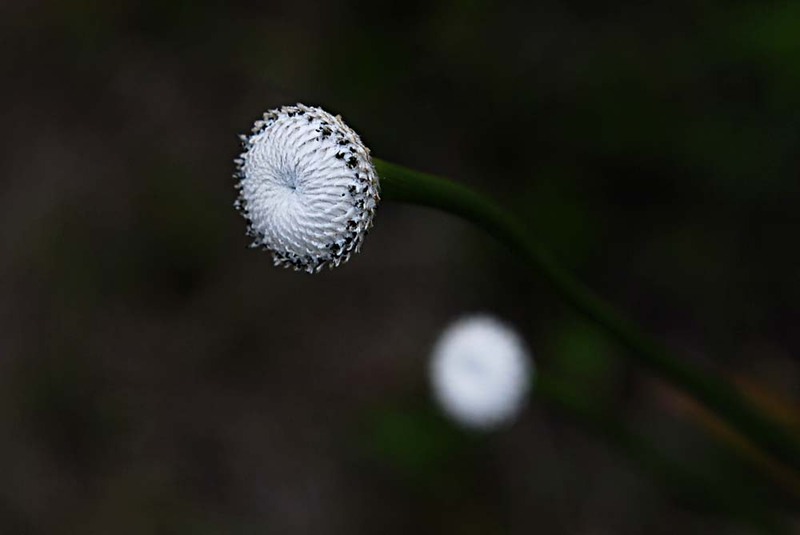 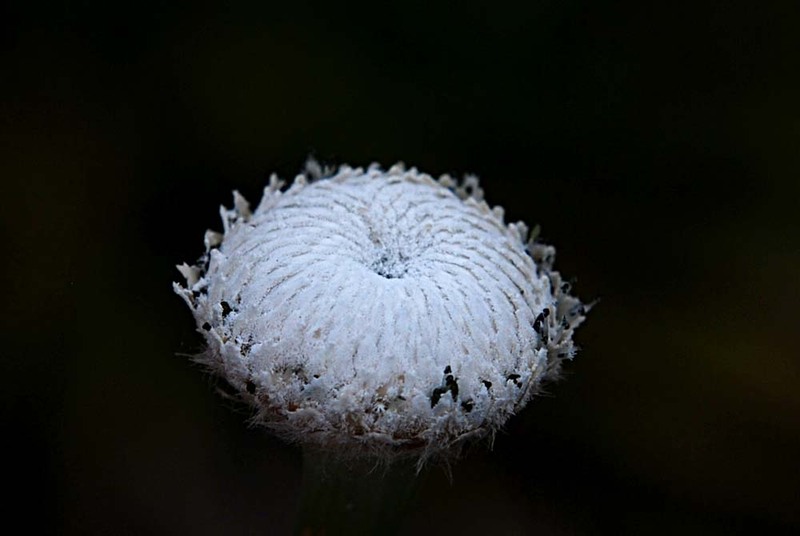 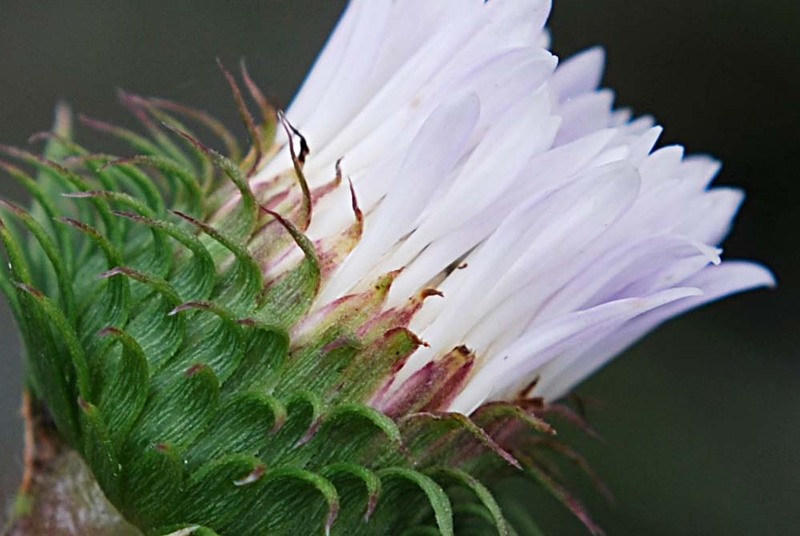 The flower resembles a dandelion and has dandelion-like puffballs. 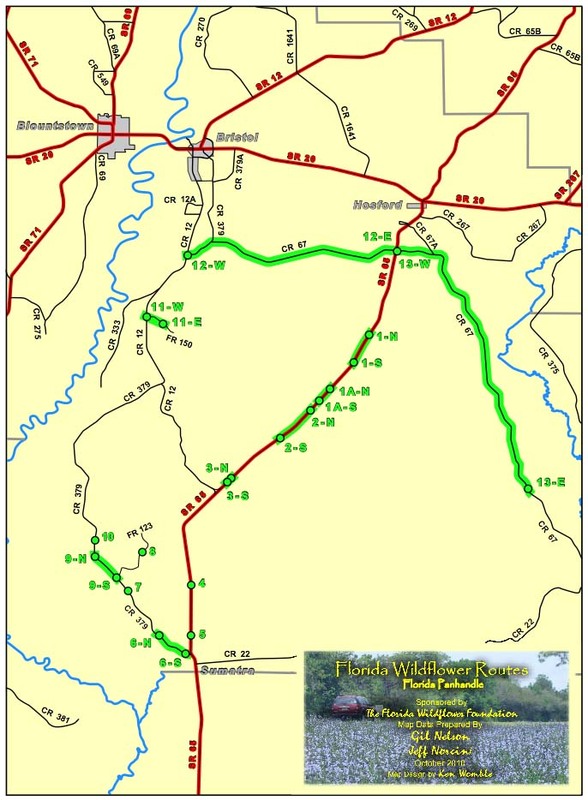 On Sunday we headed towards SR 65, our primary target. 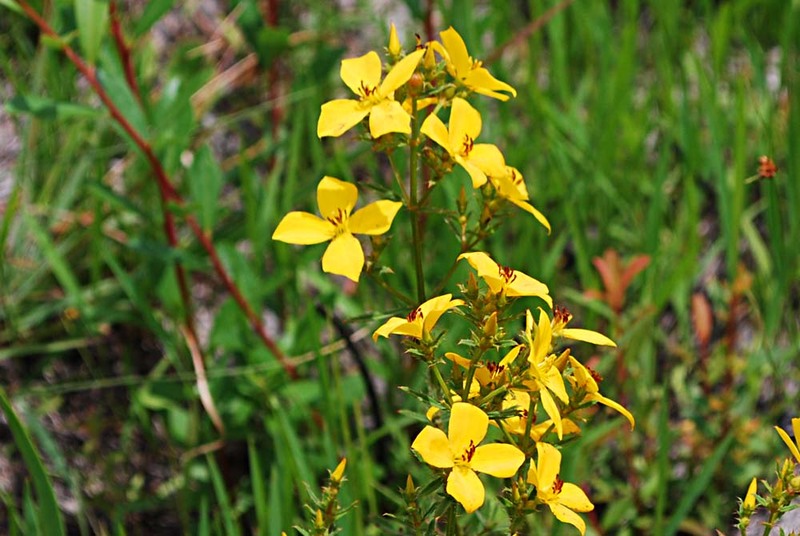 Various species of meadowbeauty were among the most common and showy roadside wildflowers. 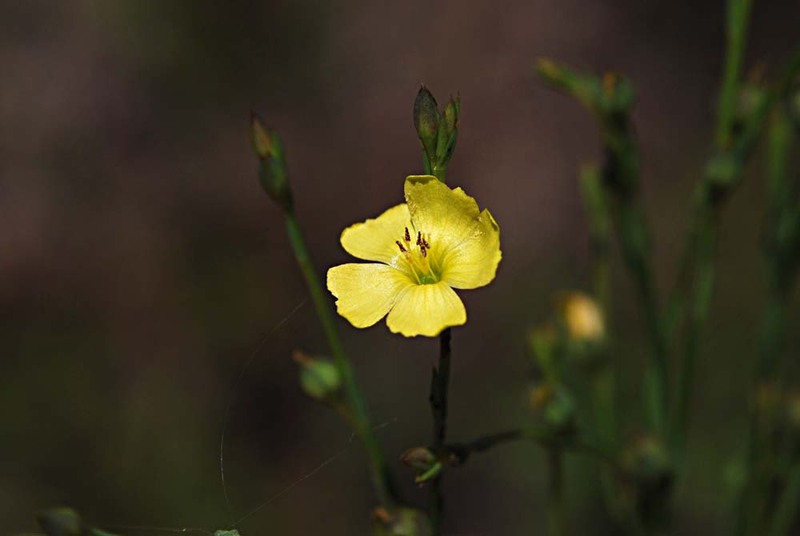 Five species of Rhexia are listed in the FWF Wildflower Survey; however, I could make a positive ID of only two of them (R. alifanus and R. lutea, both shown later). 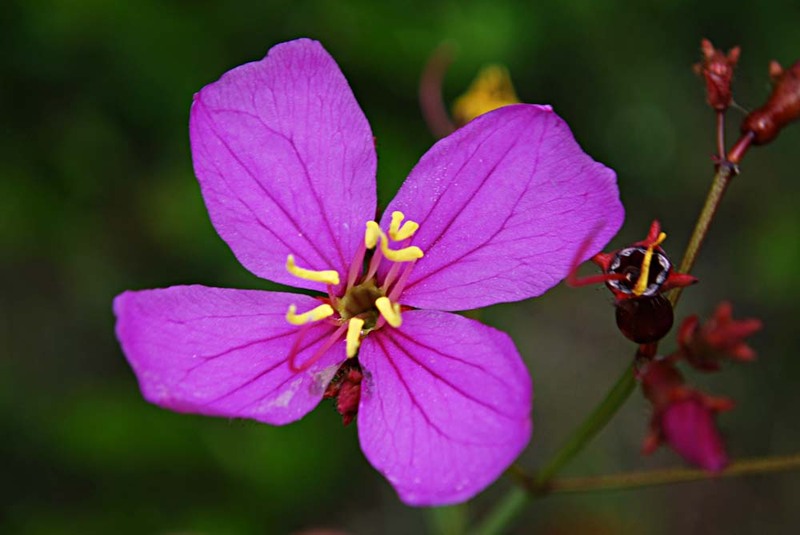 The above set of photos may include some of the following species: R. mariana, R. petiolata, and R. virginica). 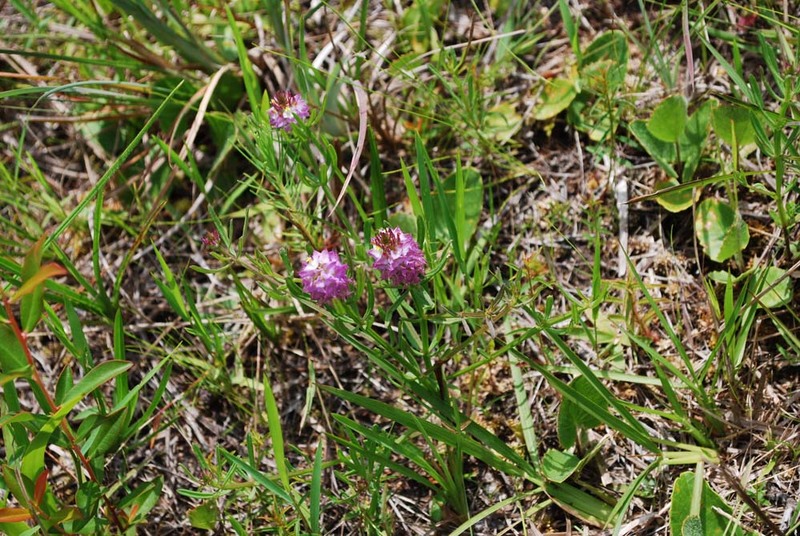 We saw a lot of white meadowbeauties, but I believe they were just a white variation of some of the species of pink meadowbeauties. 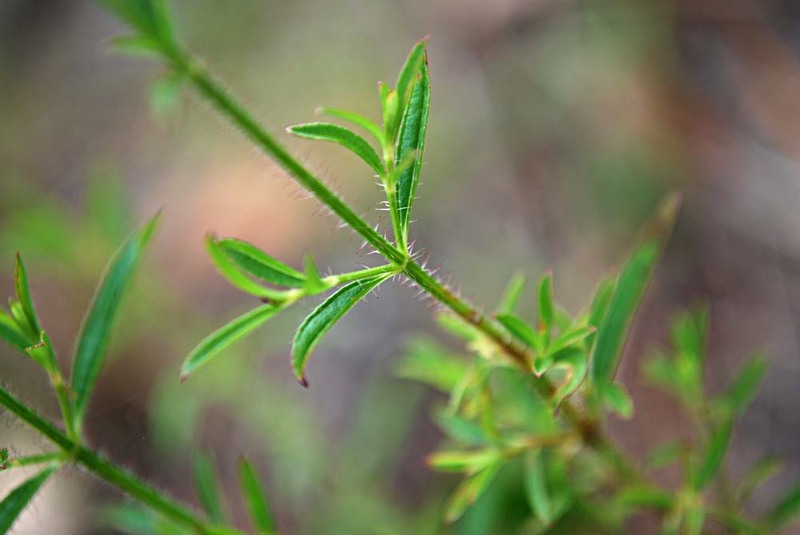 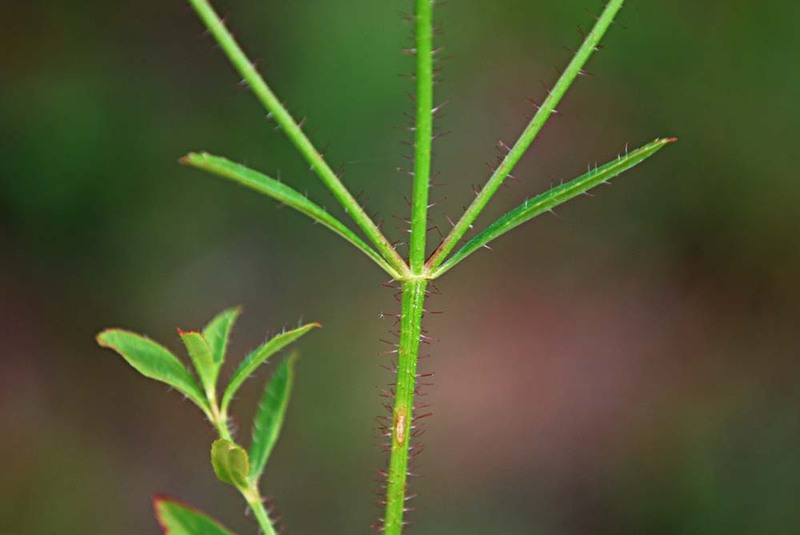 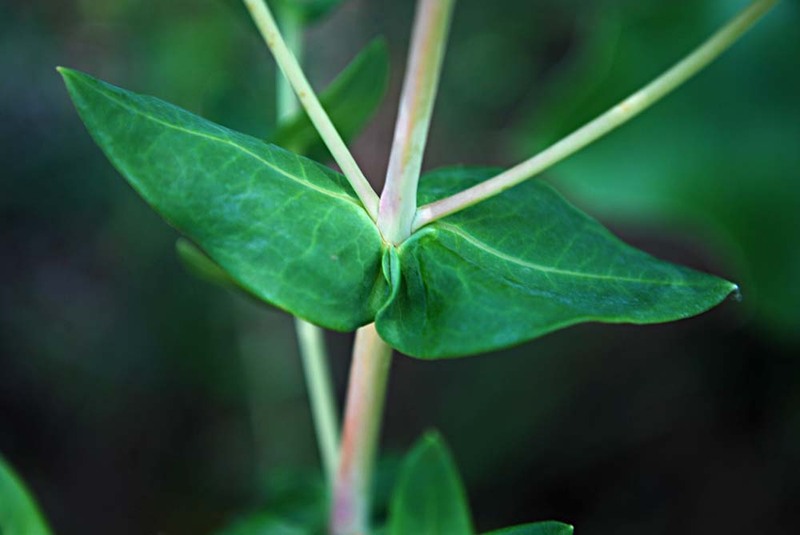 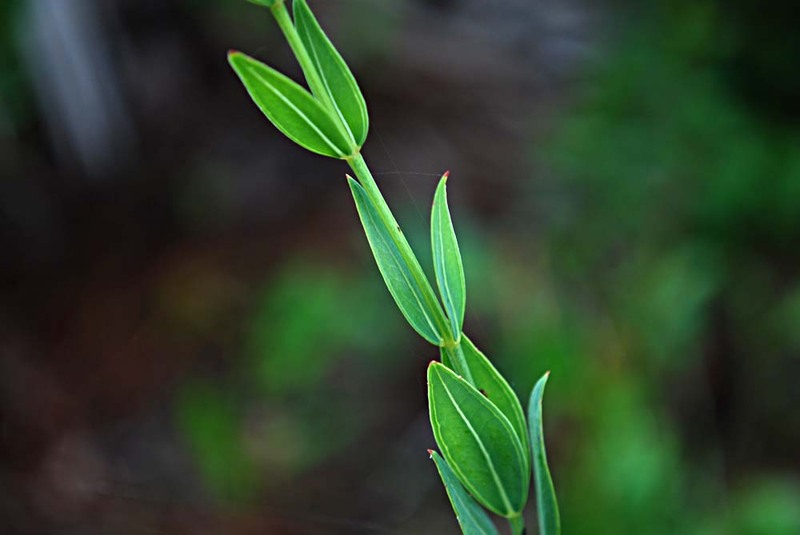 This species is identified by its leaves, which have three veins and are sharply angled upward. 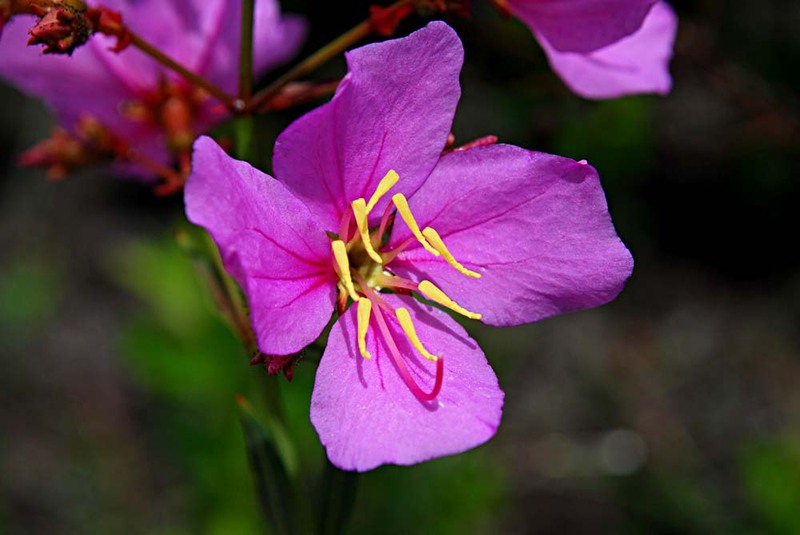 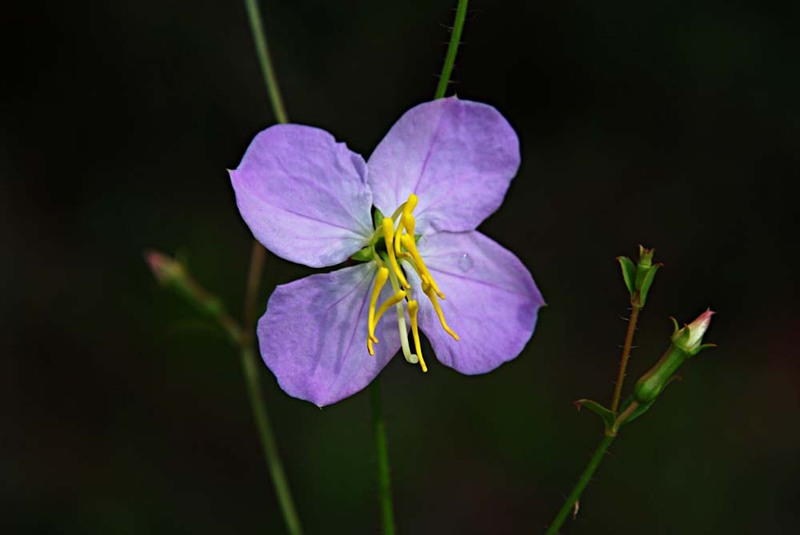 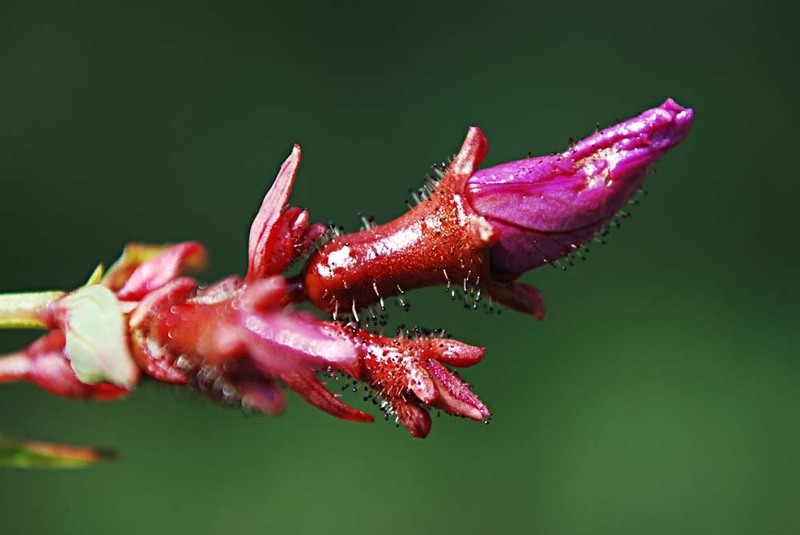 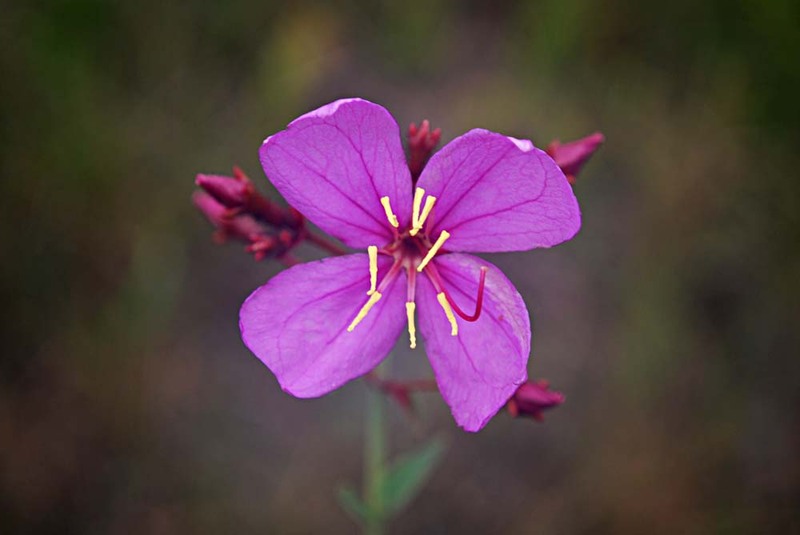 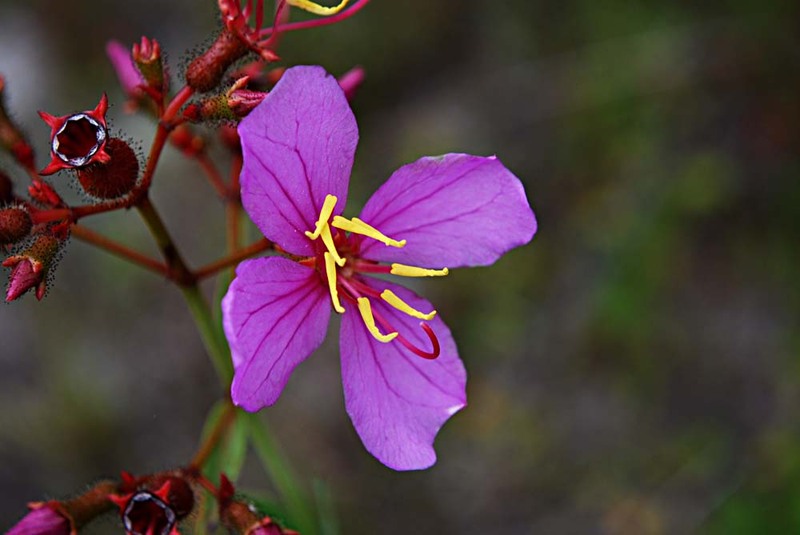 Only three species of Rhexia have anthers that are straight, or nearly so. 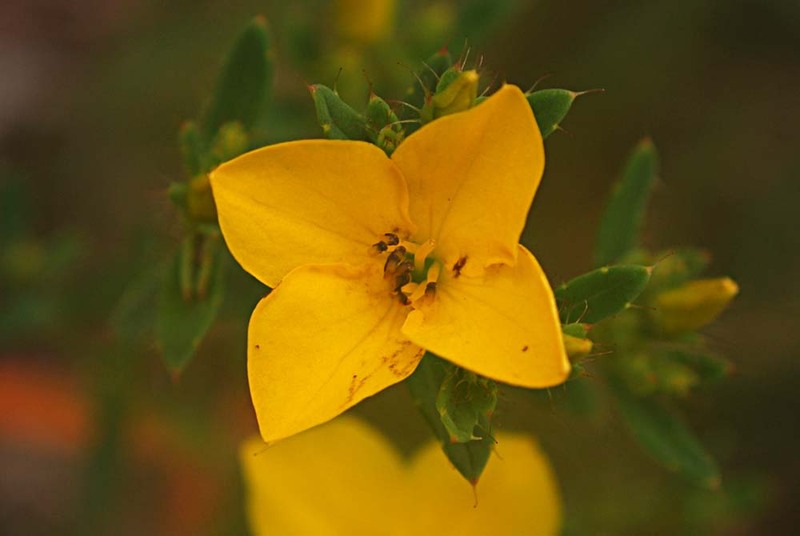 This is the only one of the three that has yellow petals; in fact, no other Rhexia has yellow petals. 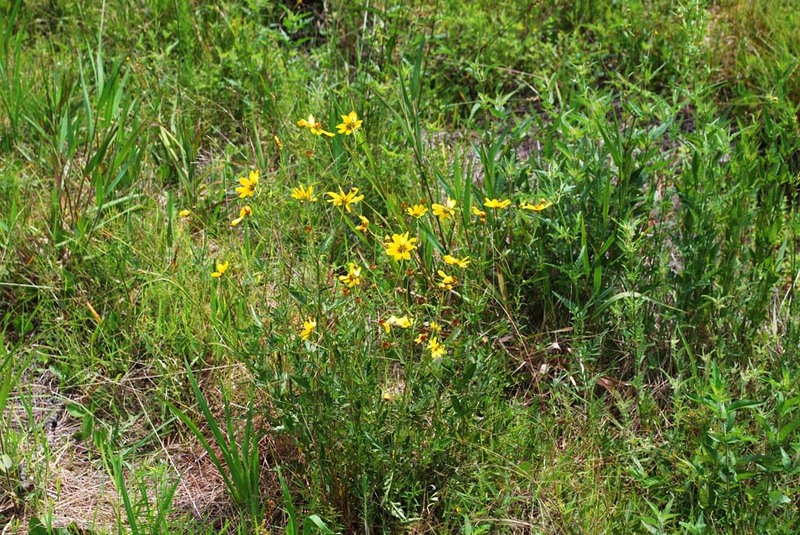 Yellow meadowbeauties were common along SR 65. 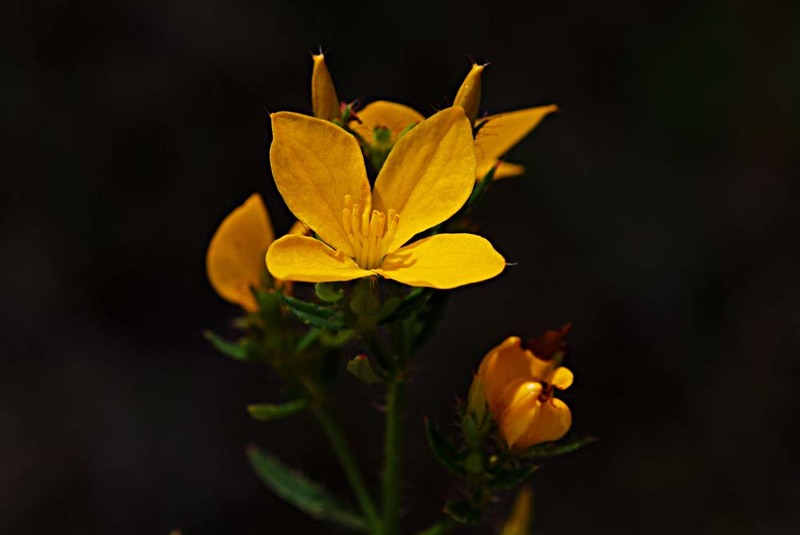 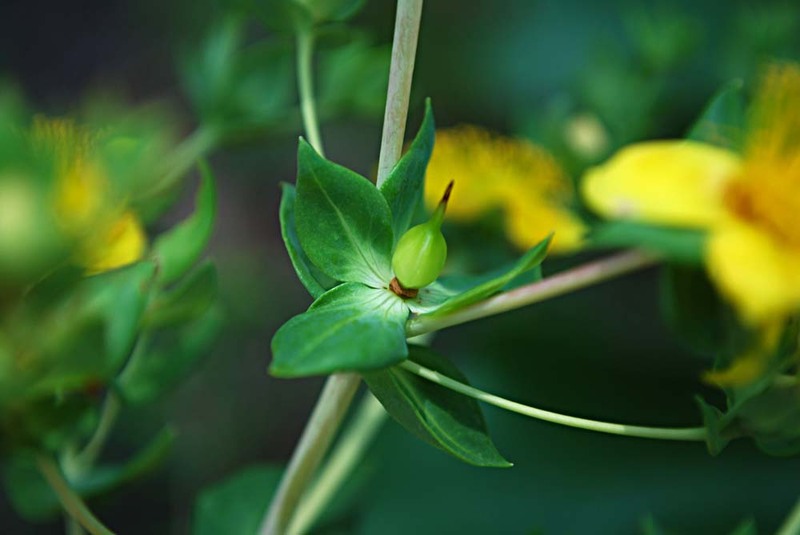 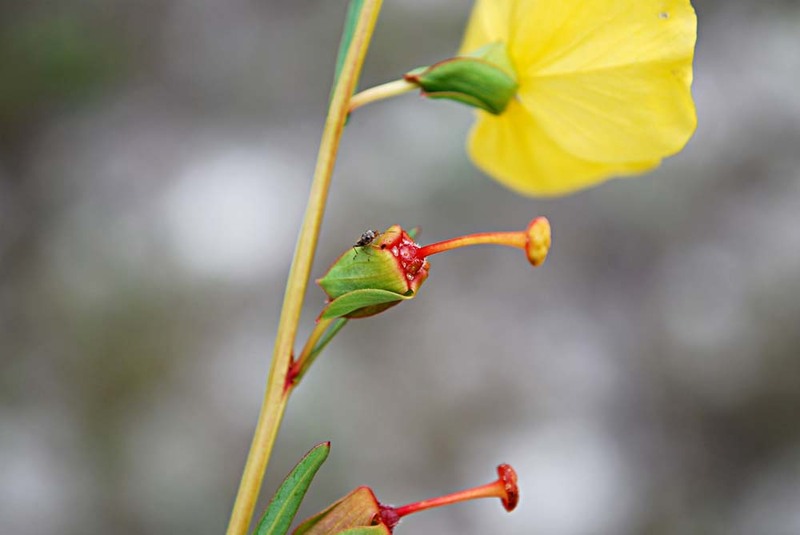 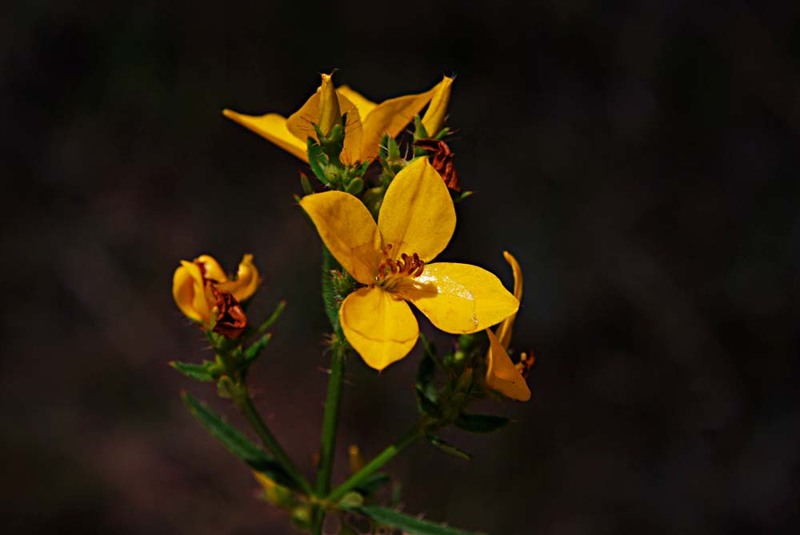 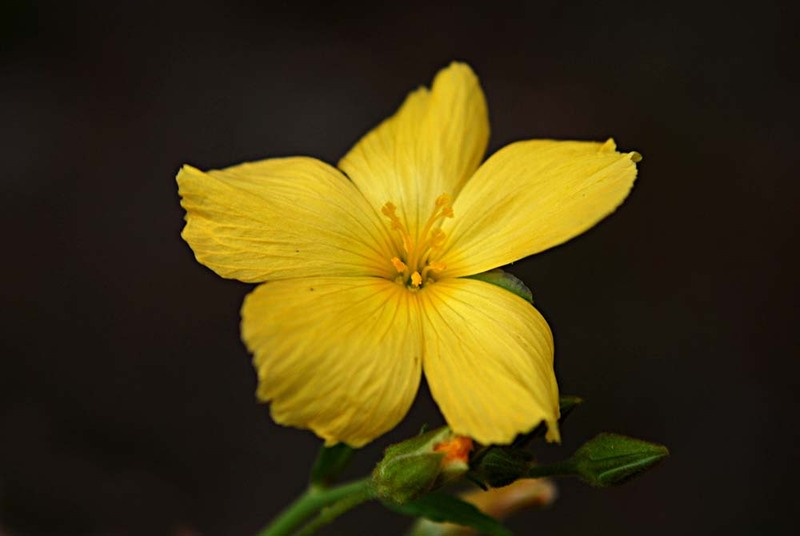 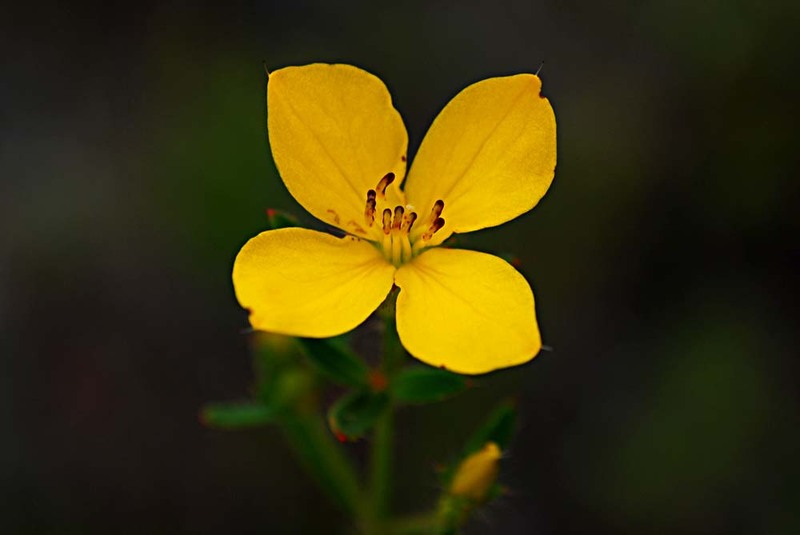 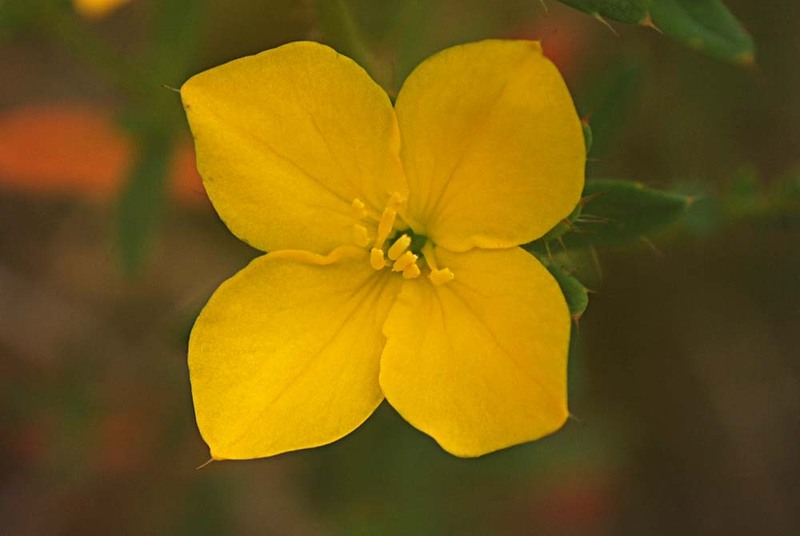 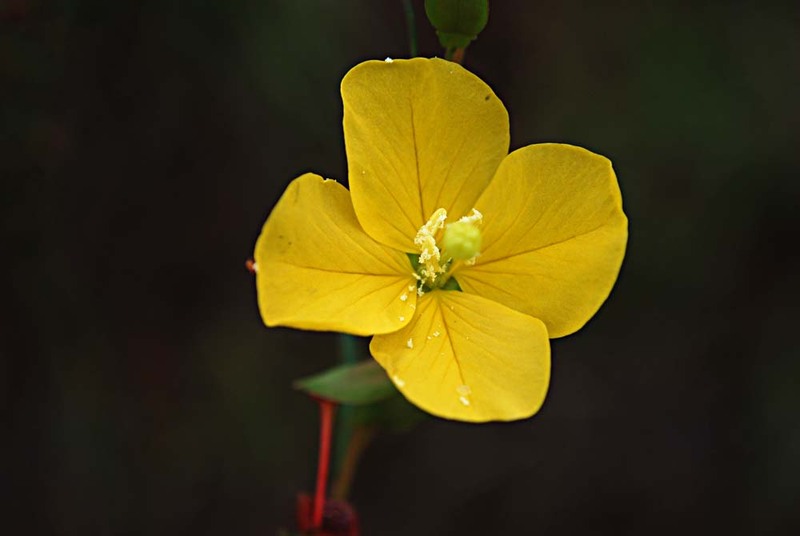 This is the only Ludwigia that the FWF Wildflower Survey lists for SR 65. 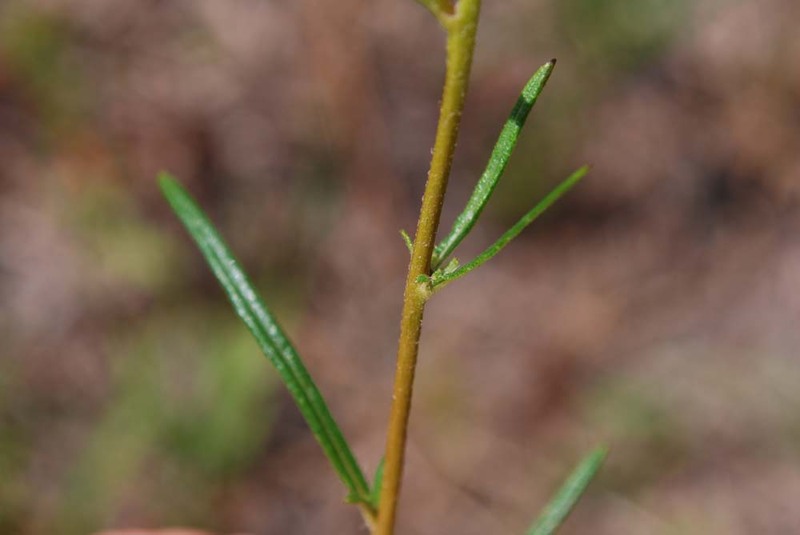 With its cube-shaped seed capsules, it appears similar to L. mariana, common in Brevard Co.
A common shrub of pine flatwoods. 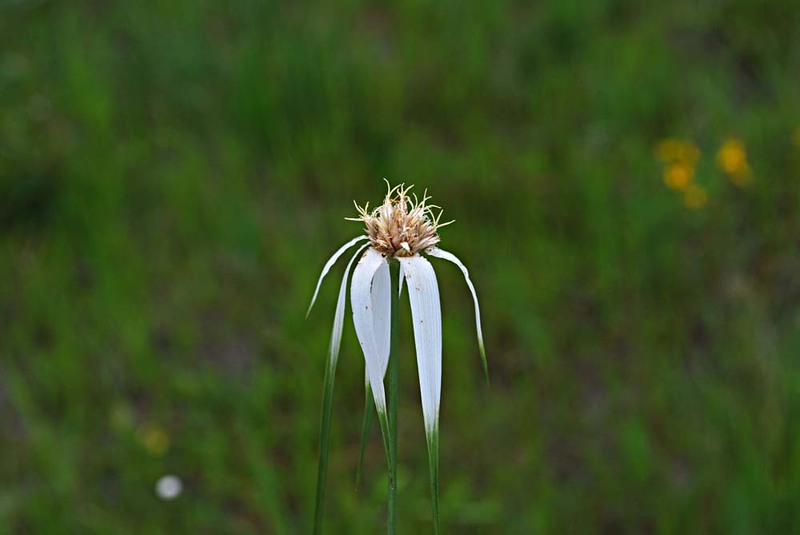 Found in margins of swampy areas. 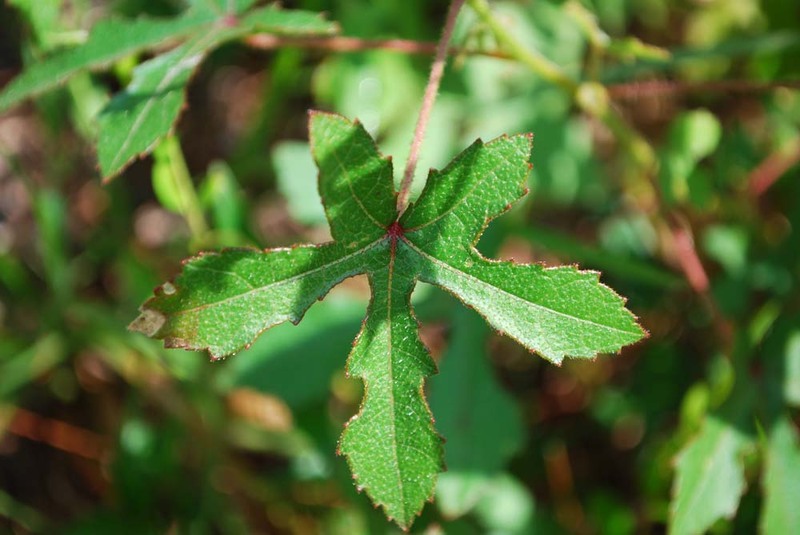 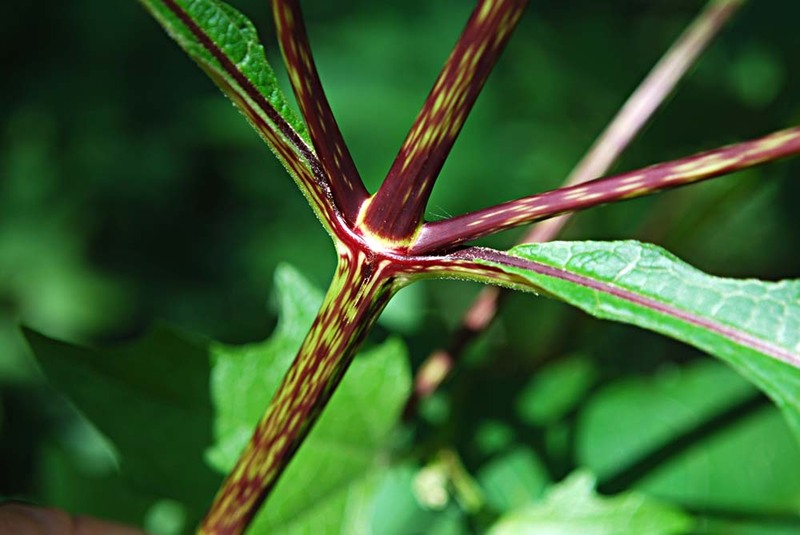 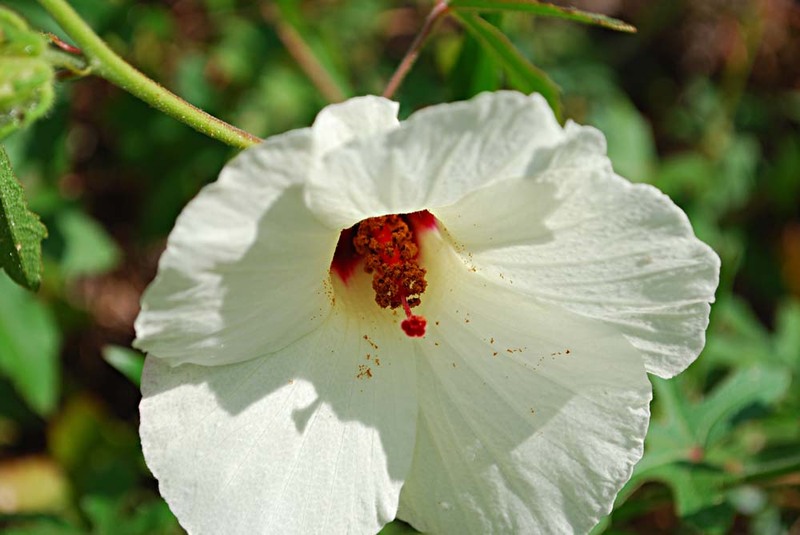 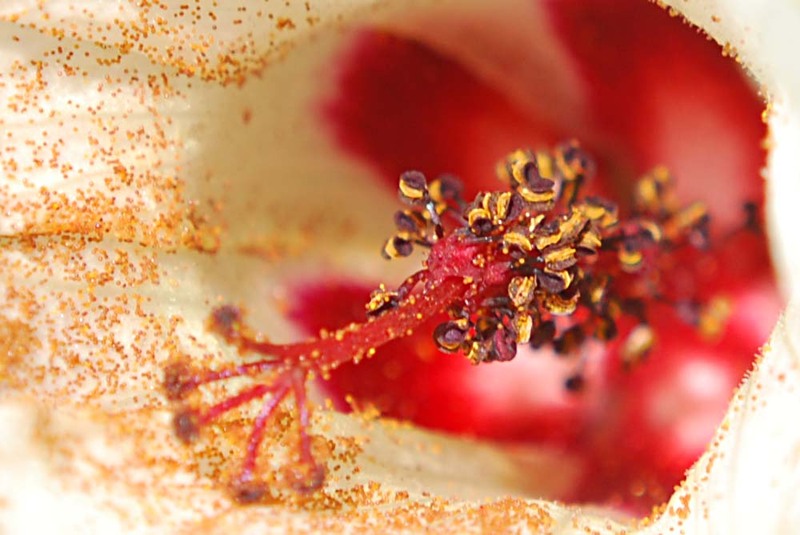 Stiff, star-shaped hairs on stems and leaves make this low-growing Hibiscus feel rough to the touch. 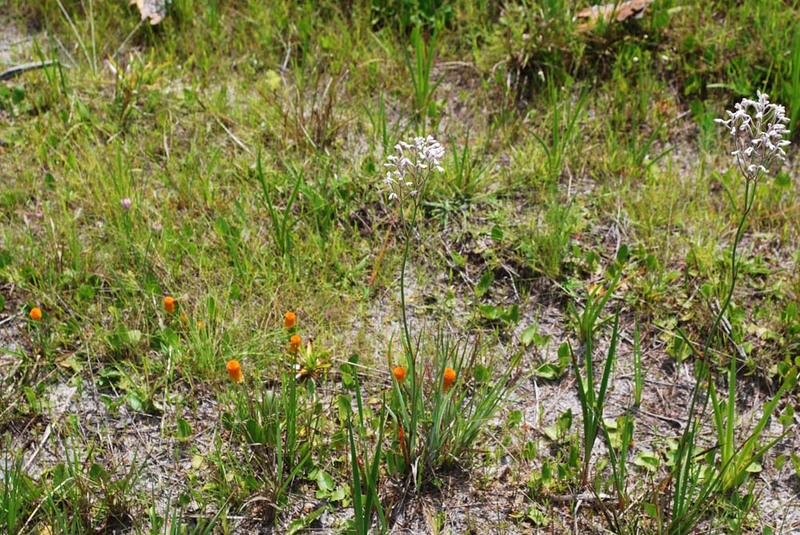 The upper-left photo shows orange milkwort near some tall golden crest (see following species). 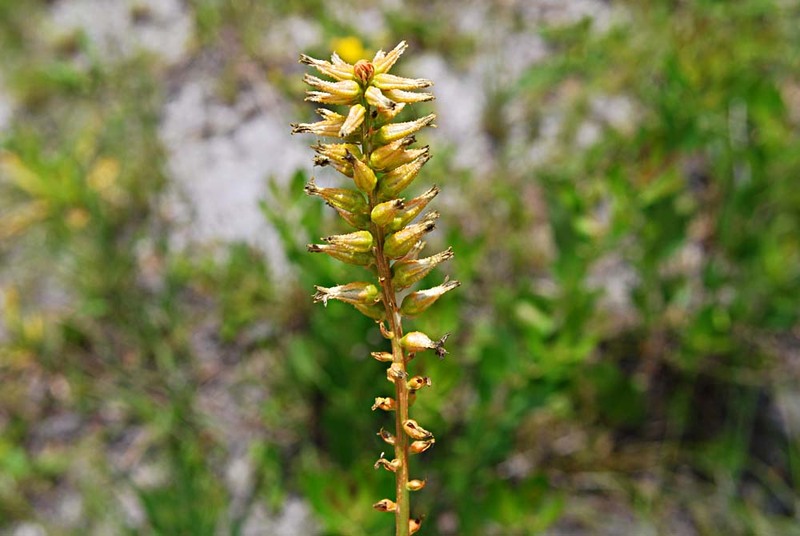 Golden crest is a tall plant, common along the SR 65 roadside. 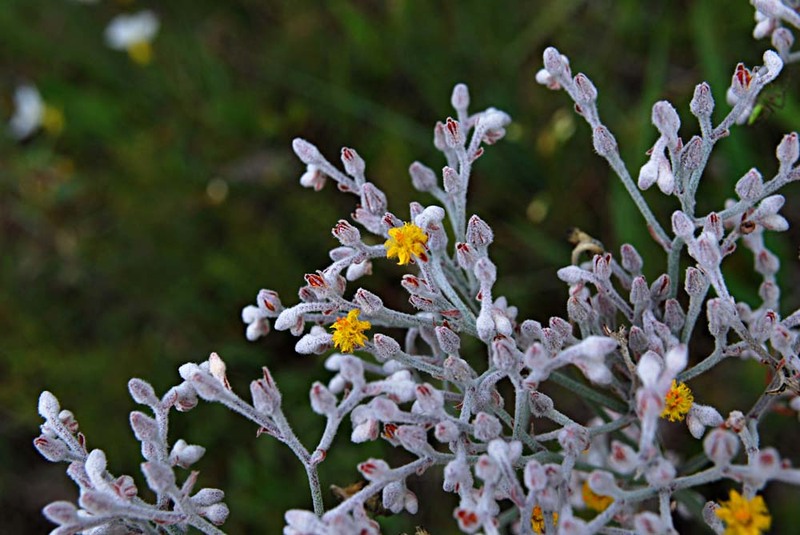 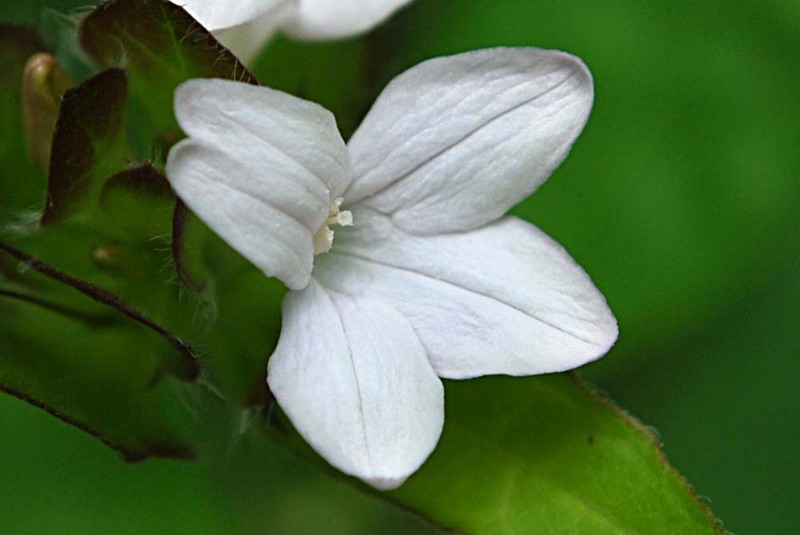 Its large, pale-gray flowering heads make it easy to spot. 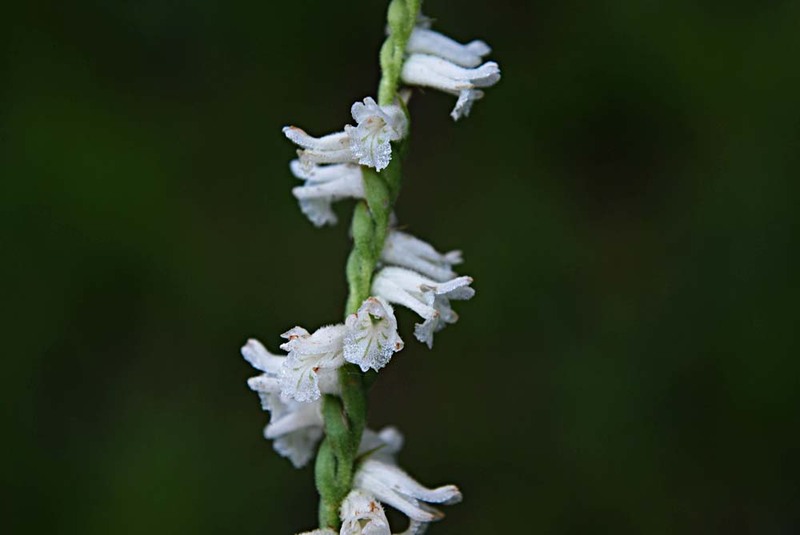 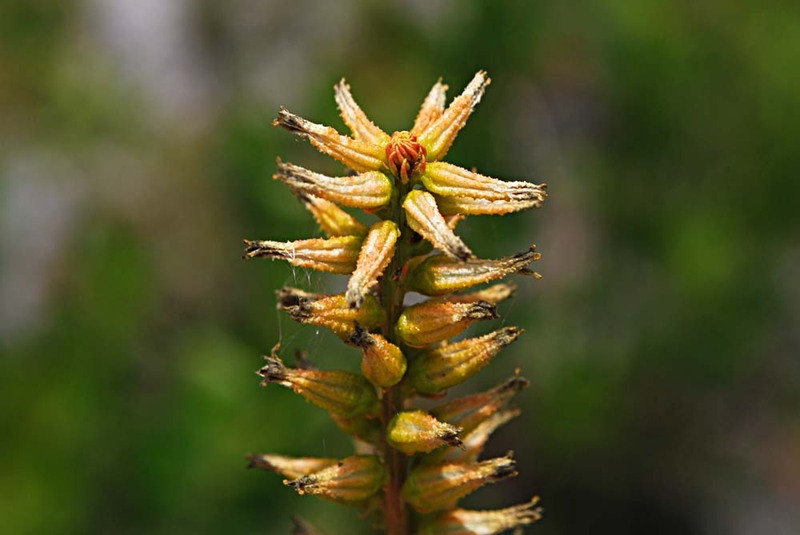 While photographing these plants, I assumed they were redroot (Lachnanthes caroliana), which is common in Brevard, although the inflorescence appeared larger and more open. 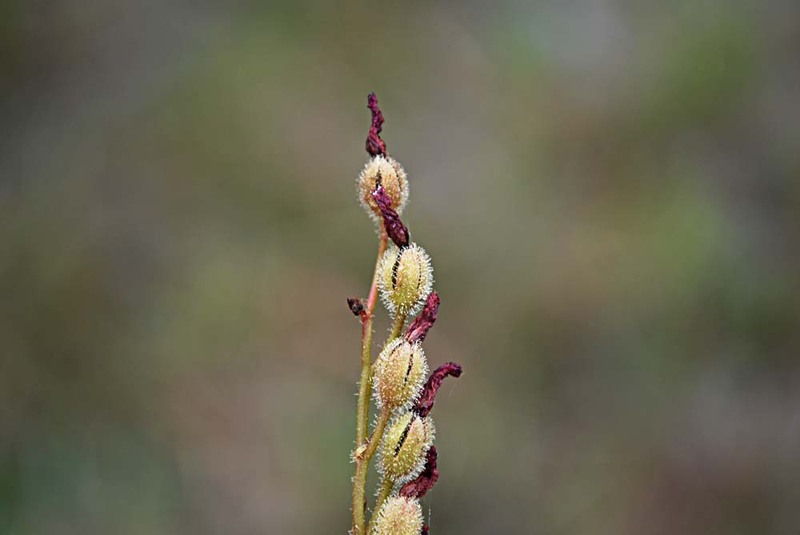 Redroot did not appear in the FWF Wildflower Survey list of species, so I checked in a few reference books and found that these were a different plant. 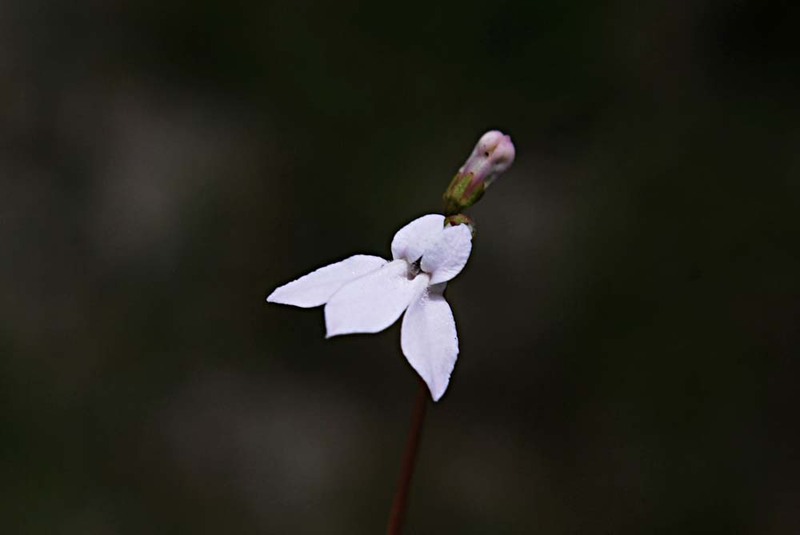 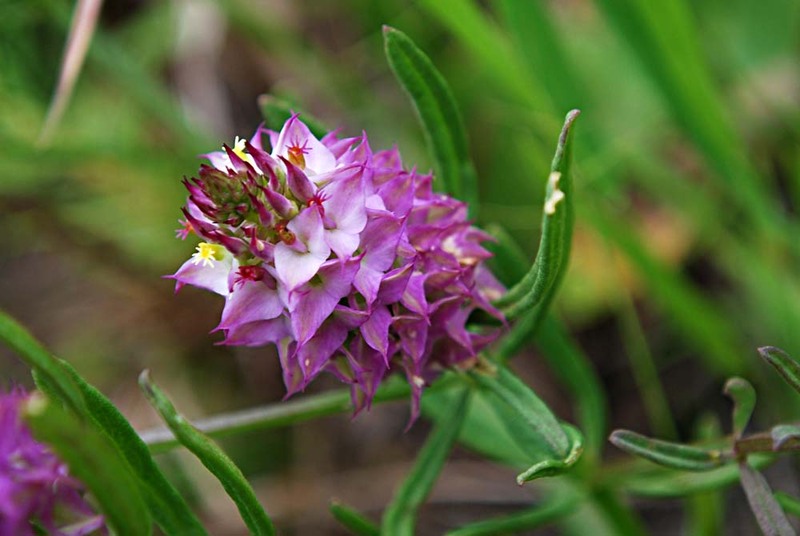 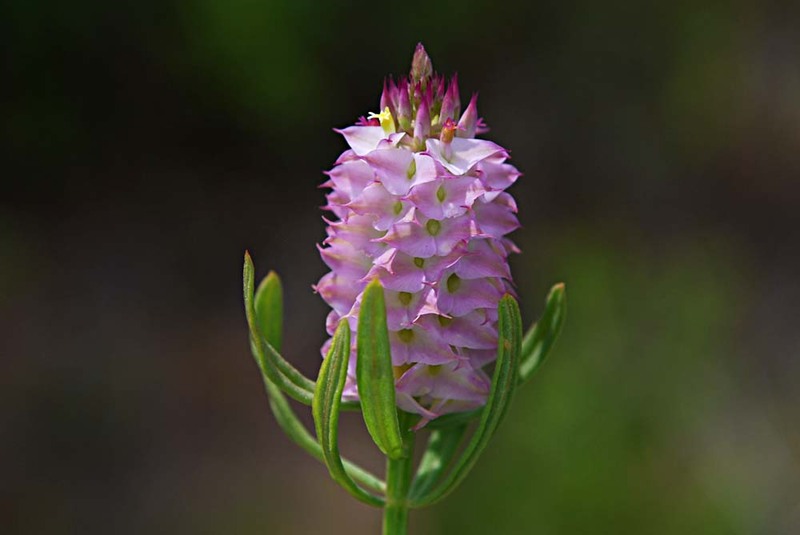 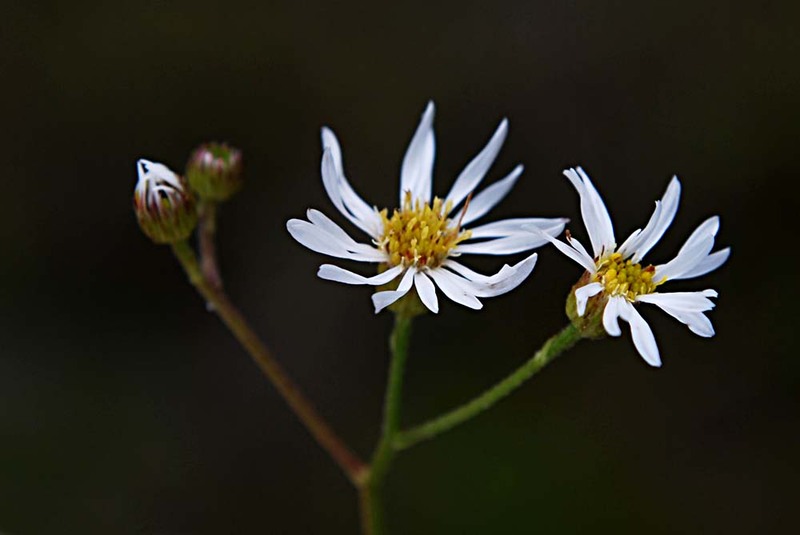 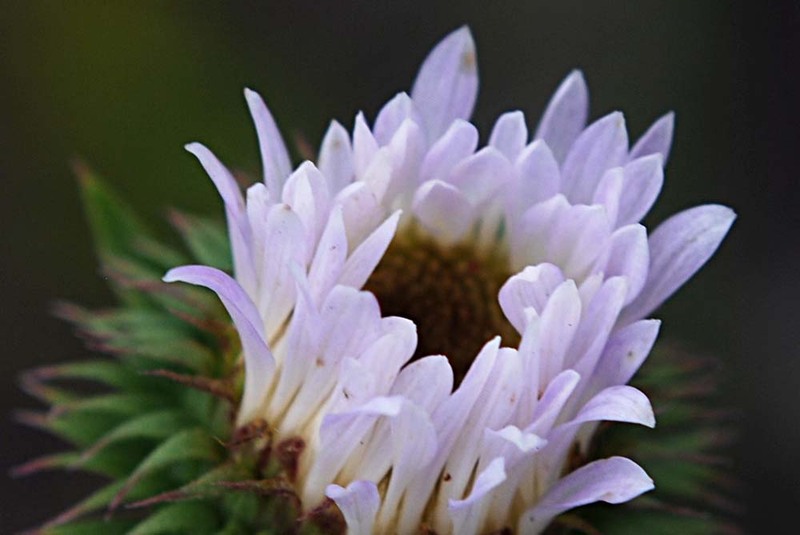 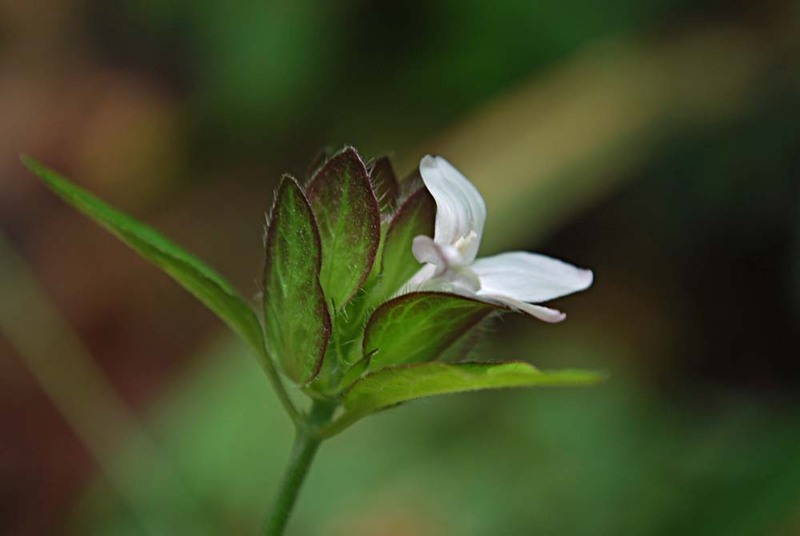 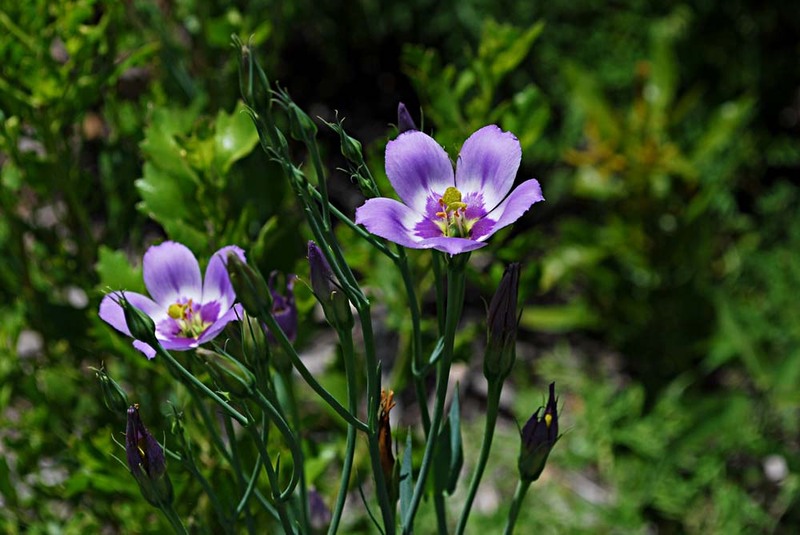 Gil Nelson states in his book, East Gulf Coastal Plain Wildflowers, that the genus Lophiola is a monotypic genus of eastern N. America, meaning that it contains only a single species. 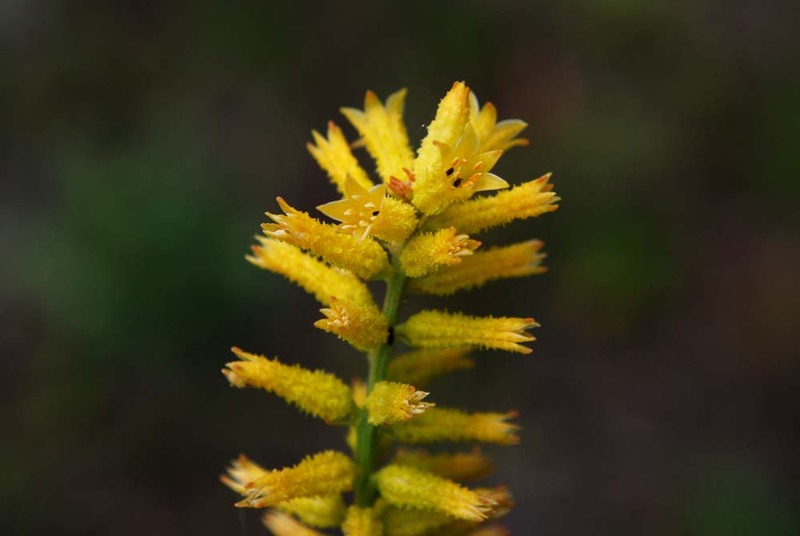 Golden crest was formerly included, along with redroot, in the Bloodroot family; however, golden crest roots are whitish or brown, not red. 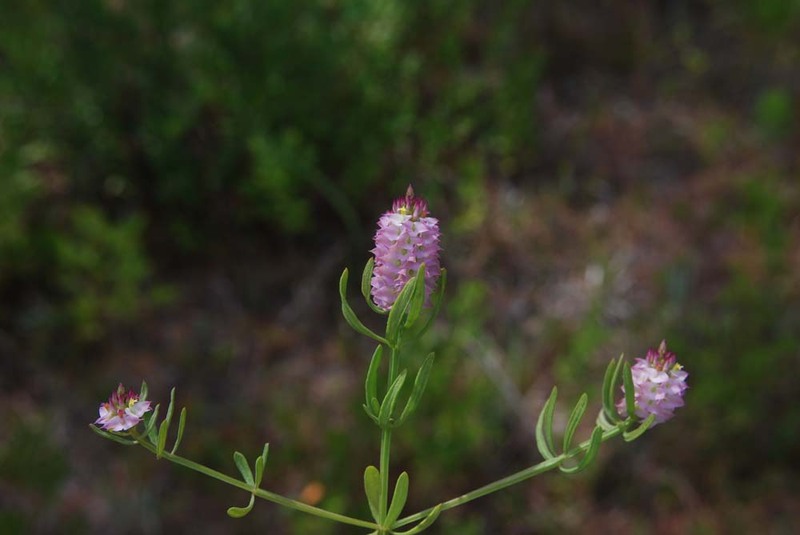 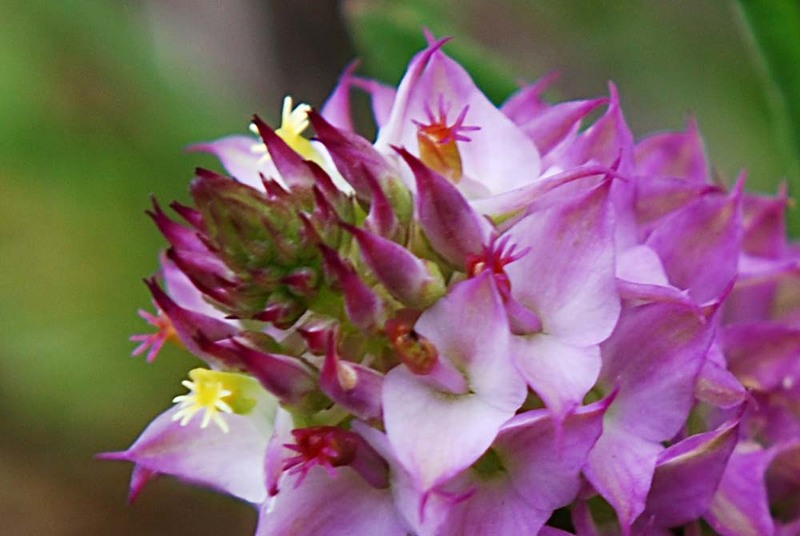 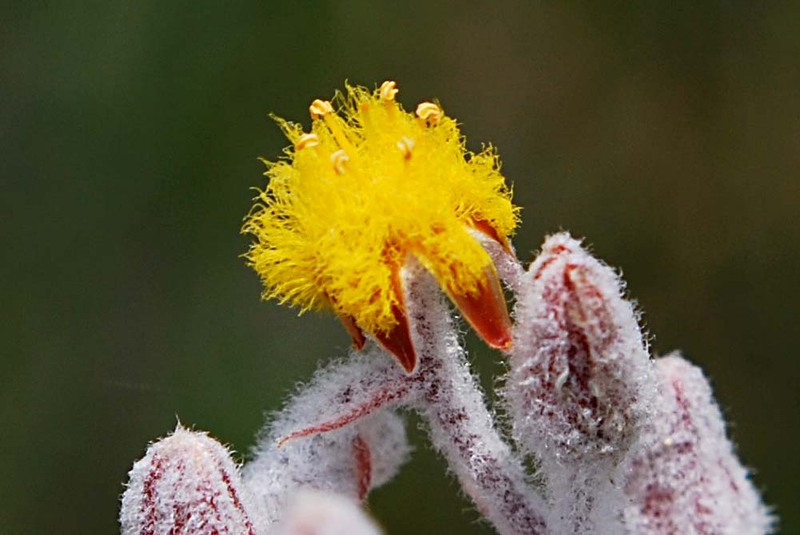 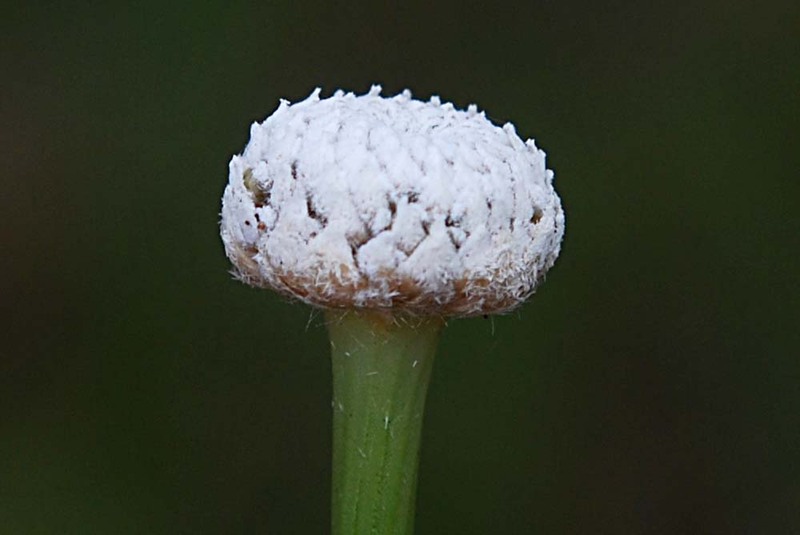 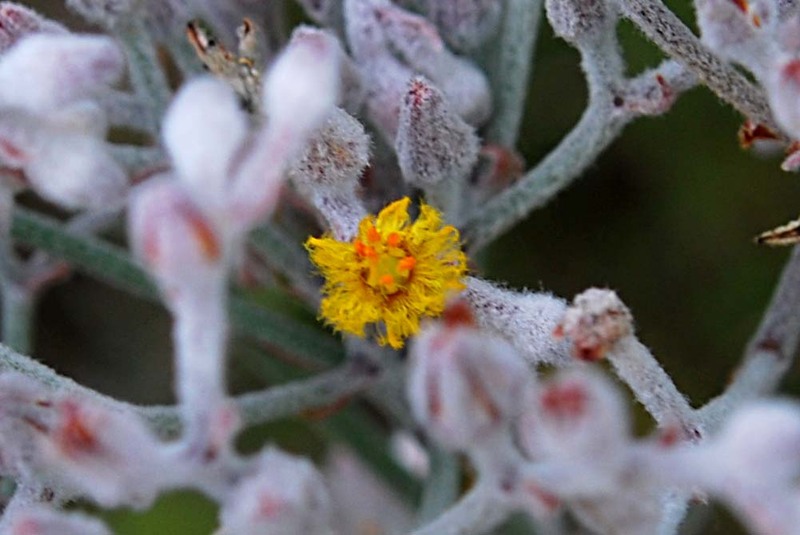 Lophiola is unlike any other genus. 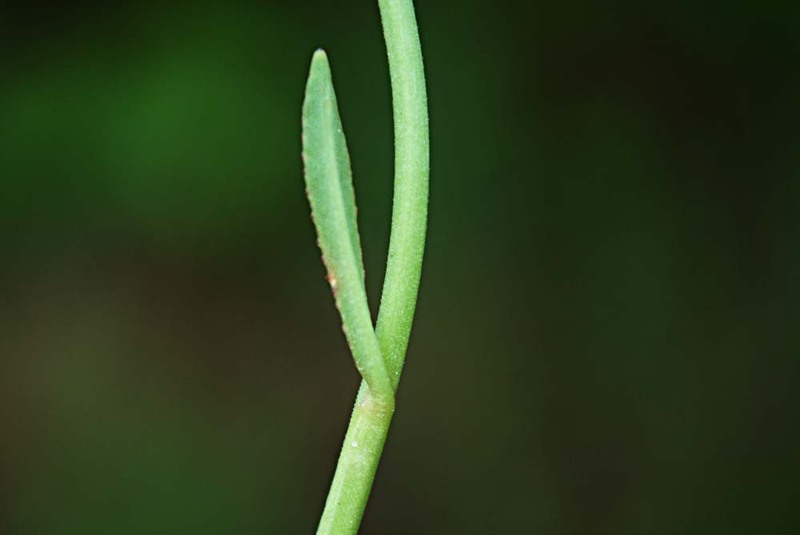 There are many species of Xyris in this area and require close inspection to identify. 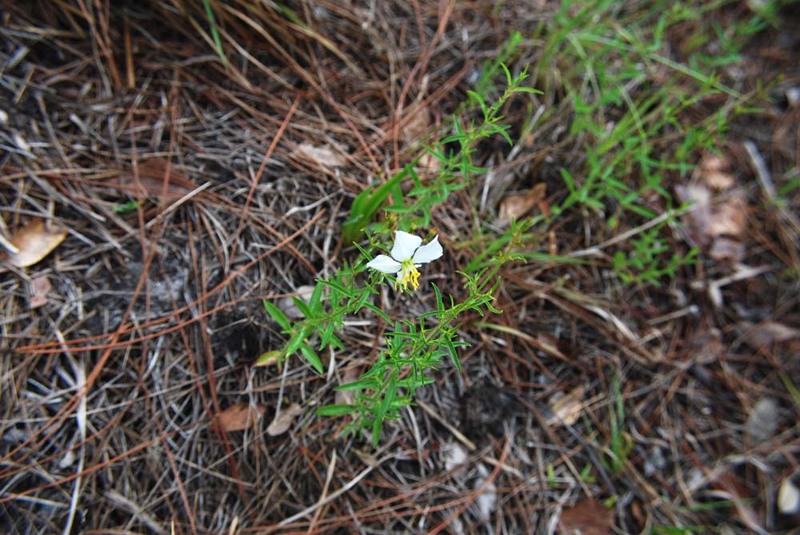 This could be X. ambigua, which is listed in the FWF Wildflower Survey. 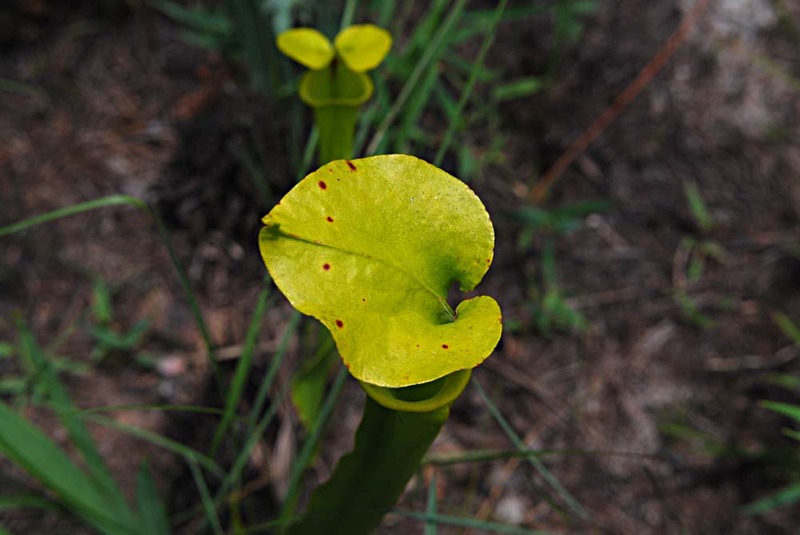 This is an unusual insectivorous plant. 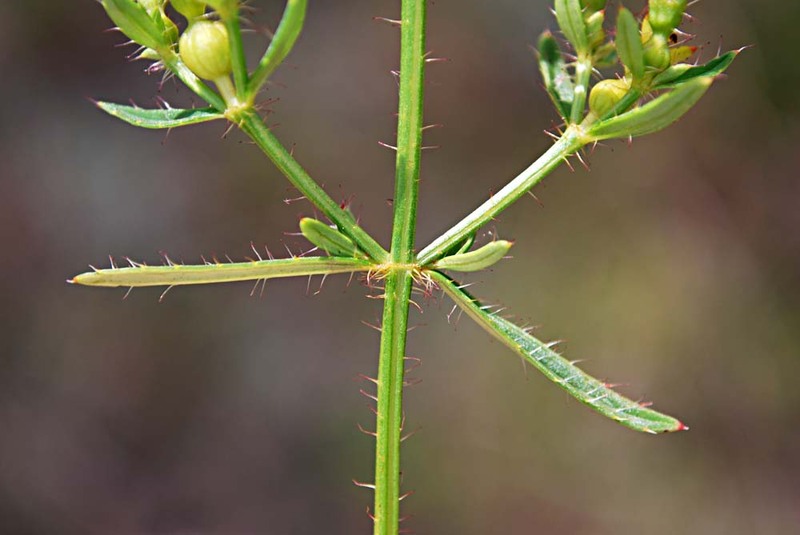 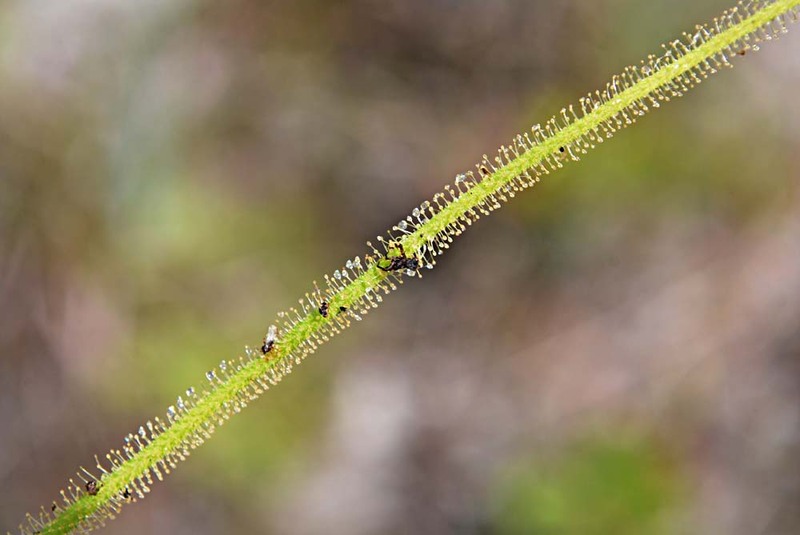 Its long, filiform leaves are covered with short, pale green, transparent hairs that exude a sticky fluid that aids in the capture and absorption of small insects. 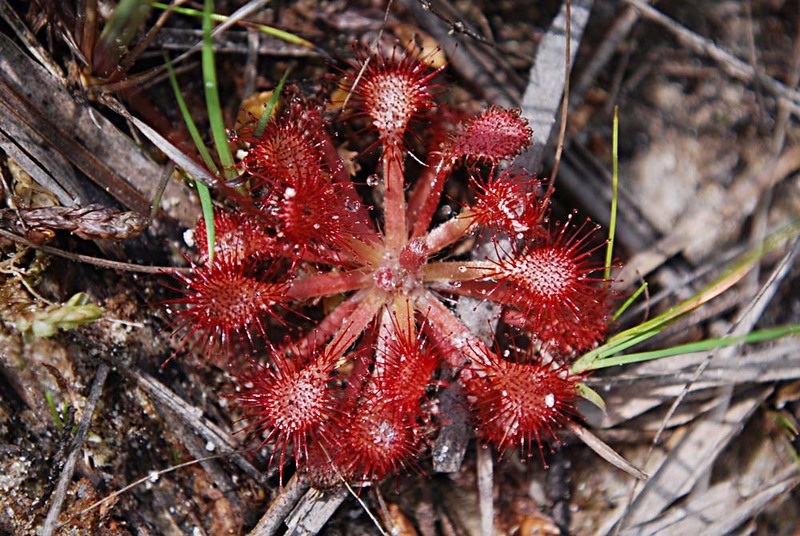 These sundews have pretty pink blossoms, but they had finished flowering. 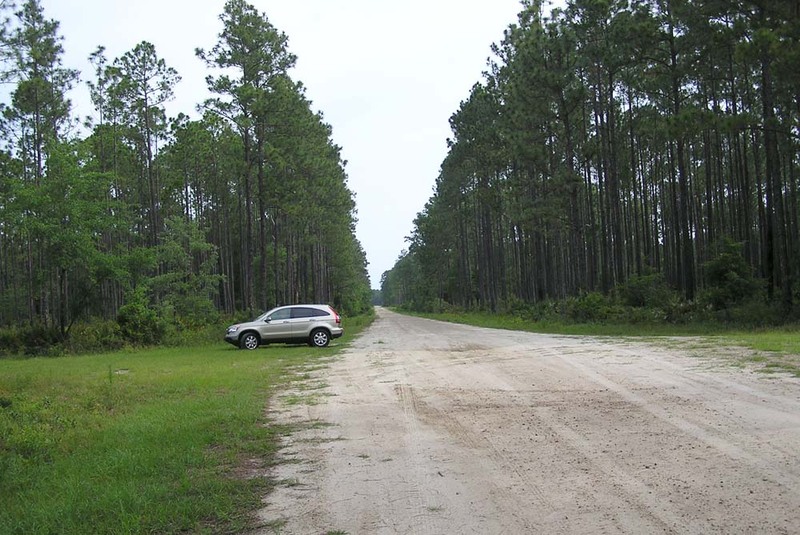 Intersection of Forest Roads 360 and 374, off SR 267, about 15 mi. 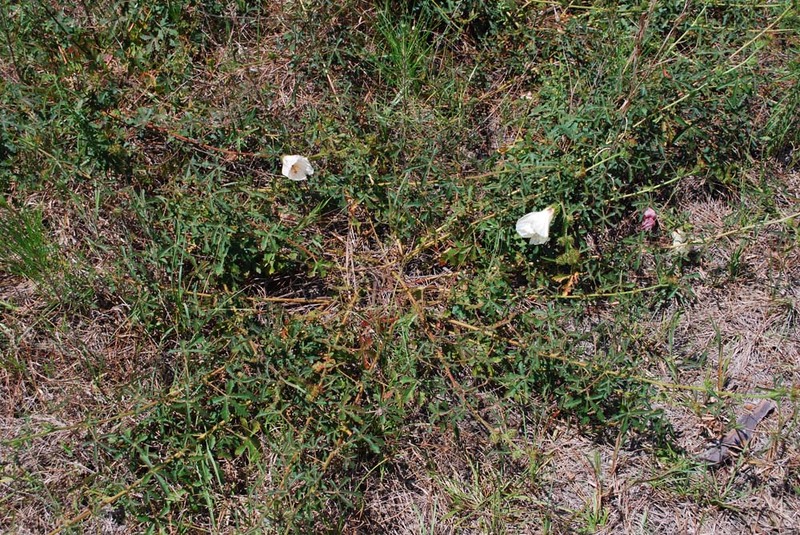 east of Hosford. 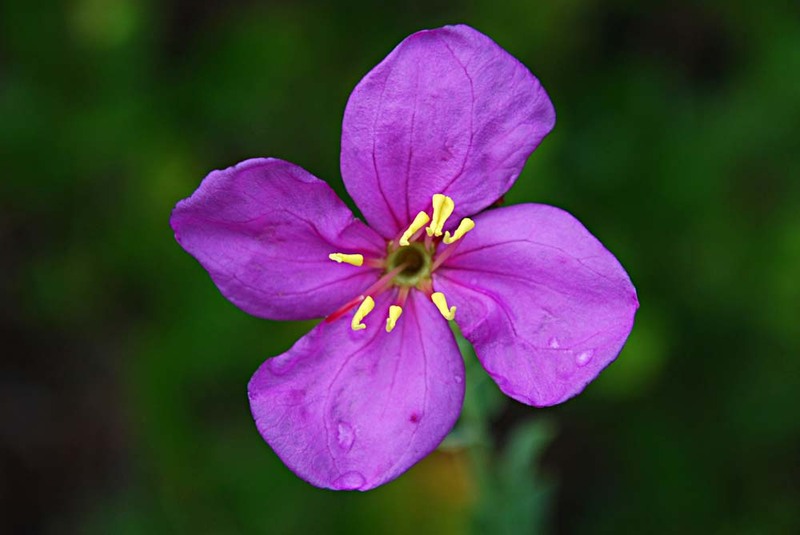 This is a low-growing plant, sending out runners with a single flower head at each node. 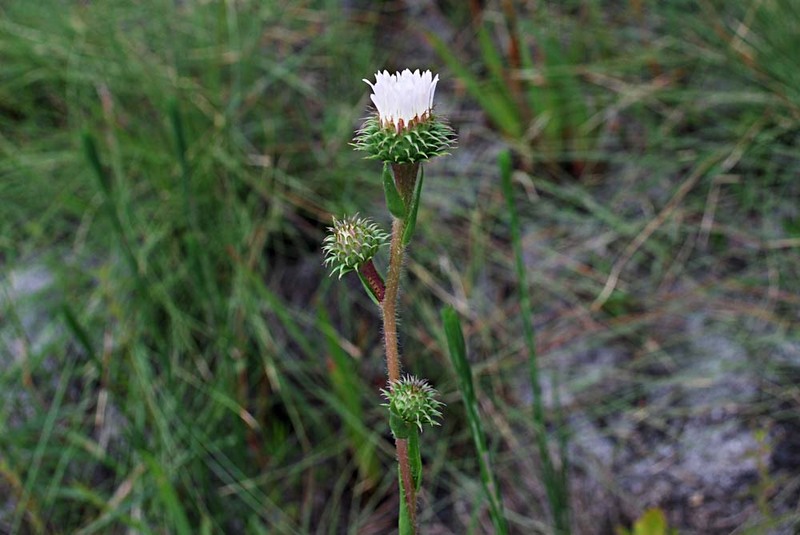 This species has a ribbed stem. 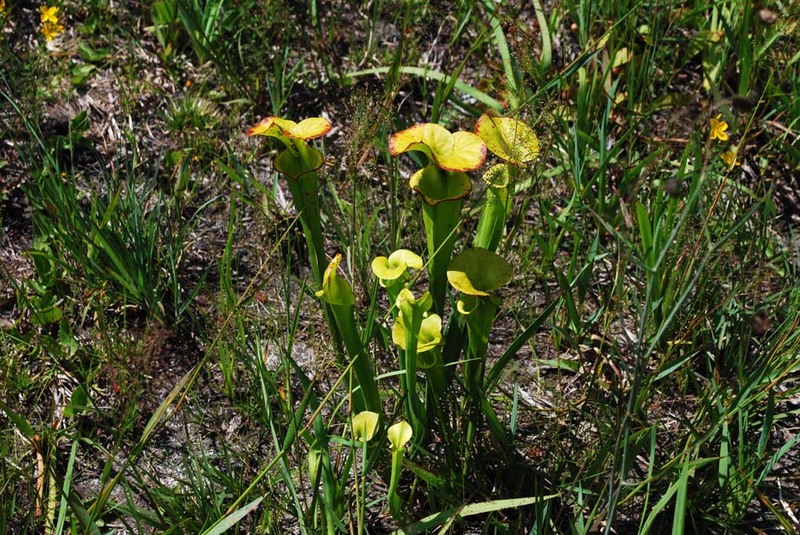 We spotted our first yellow pitcher plants a short distance north of Liberty on SR 65. 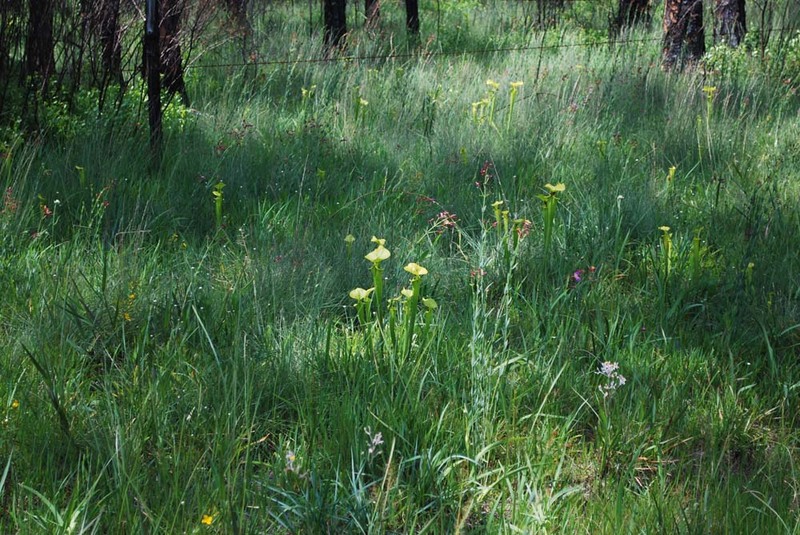 In the roadside view above, the tiny yellow spot in top center is a small group of pitcher plants. 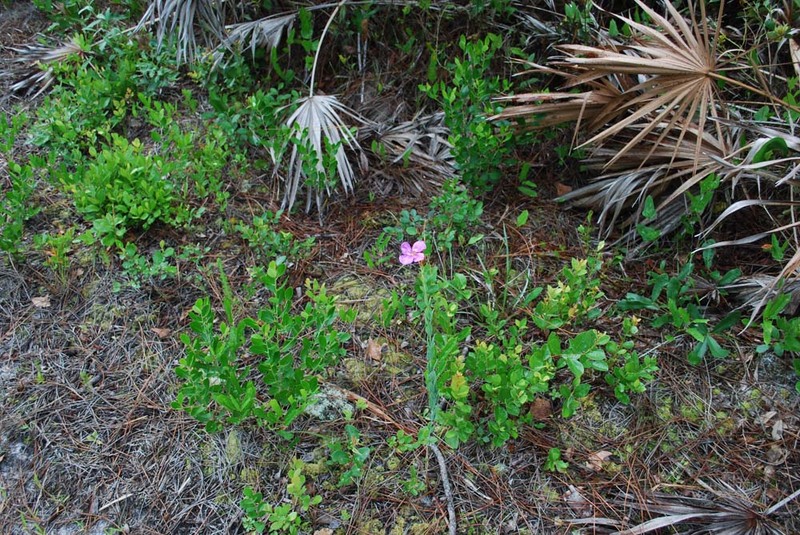 South of Liberty we saw hundreds of them. 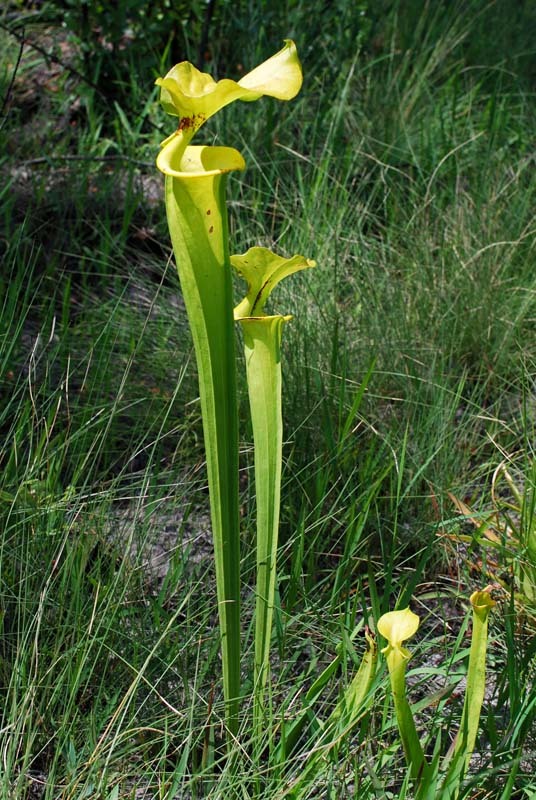 This is an insectivorous plant. 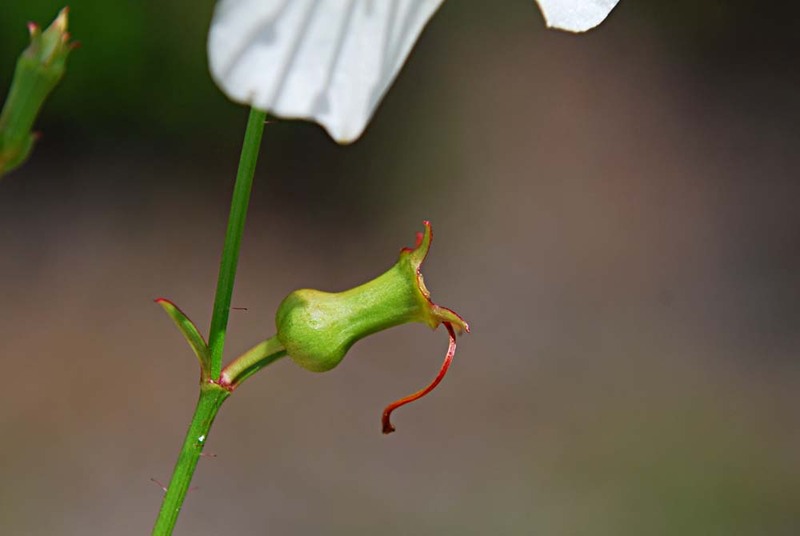 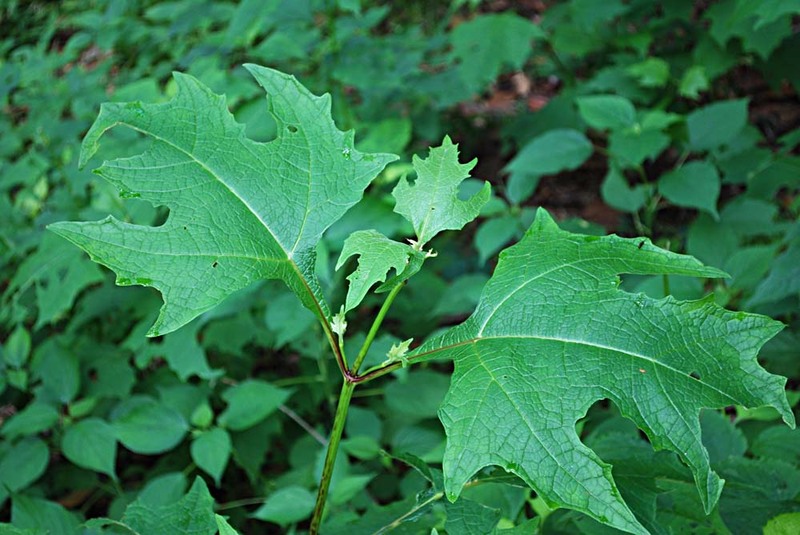 Its hollow leaves exude foul-smelling digestive enzymes that attract and consume a variety of insects. 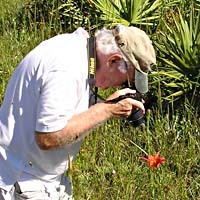 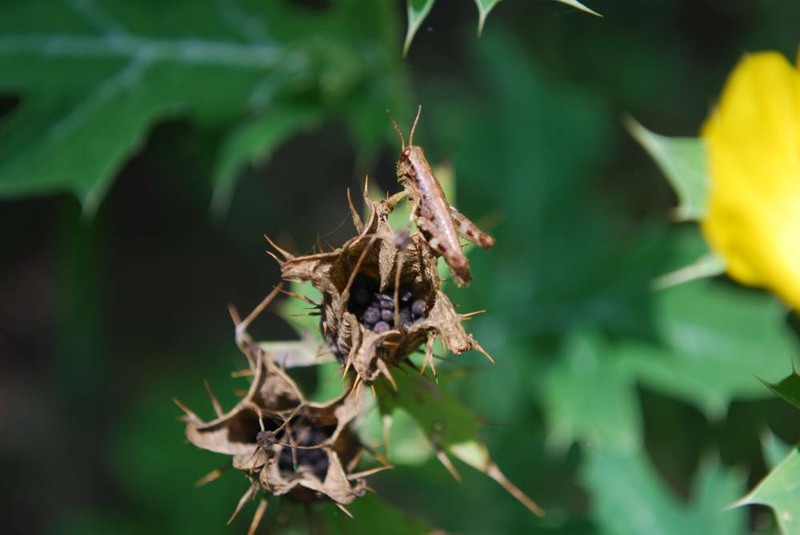 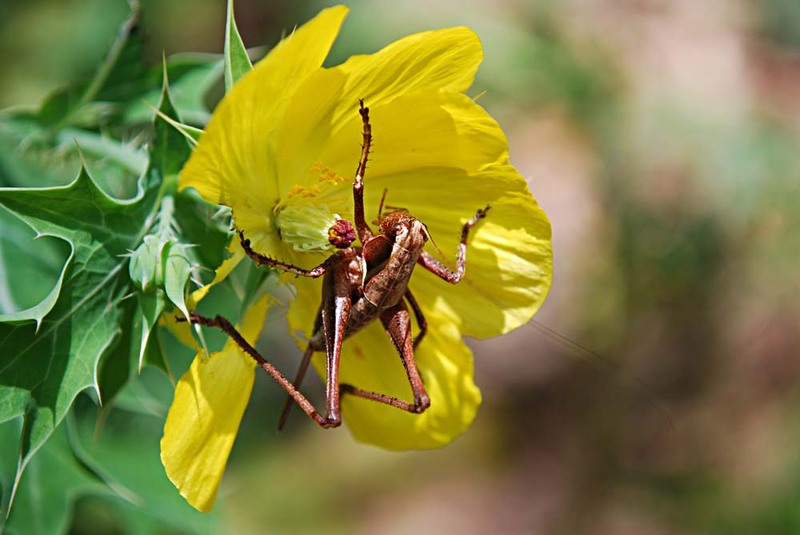 Gil Nelson states in his book, East Gulf Coastal Plain Wildflowers, that in late summer and early fall, the leaves of some individuals may be filled nearly to the top with "love bugs." 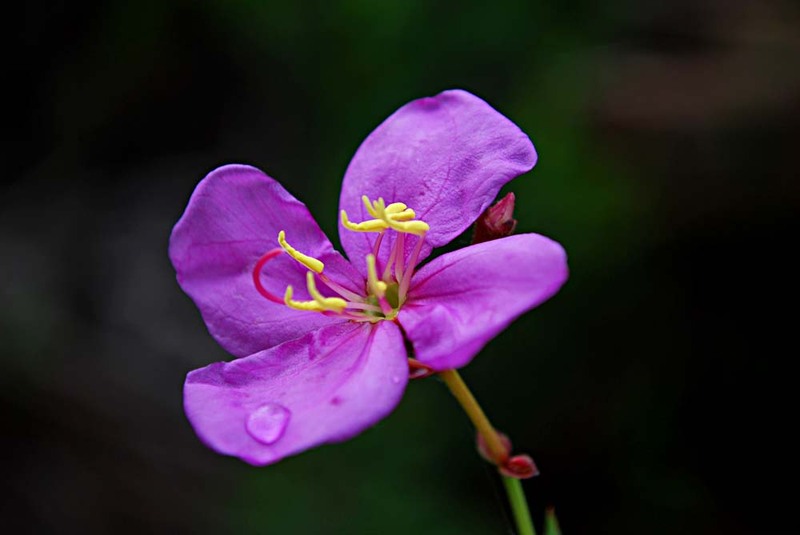 The hood appears to me to be shaped so that falling rain water is shunted off to the back. 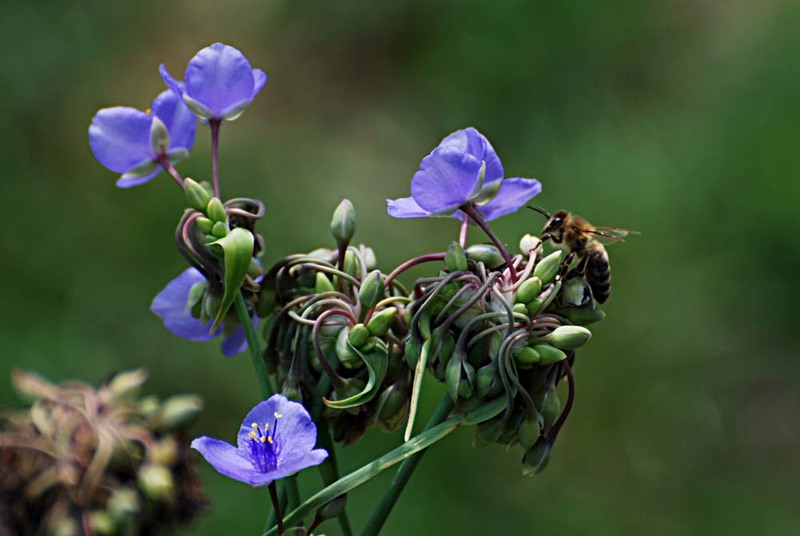 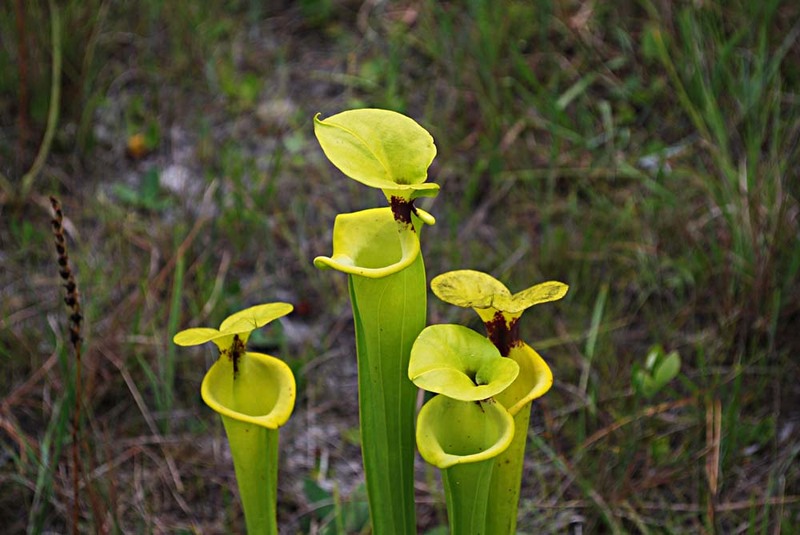 This is another insectivorous plant. 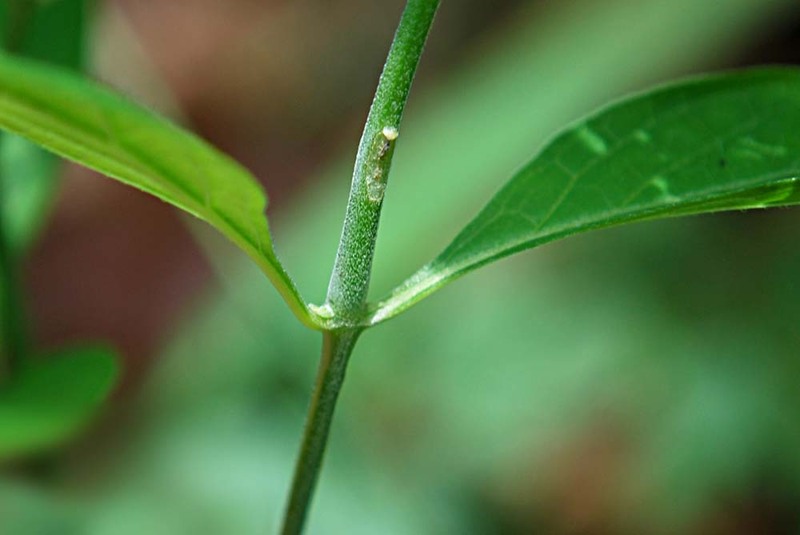 Its sticky leaves trap and digest small insects. 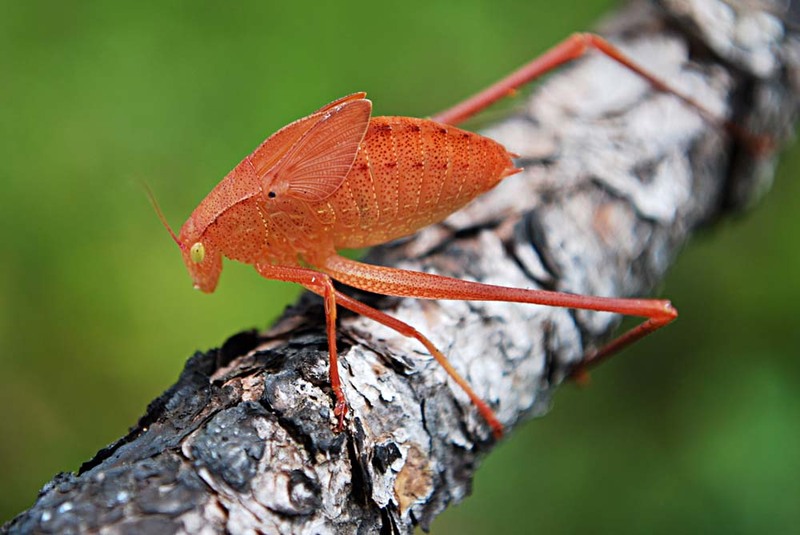 Katydids are usually green. 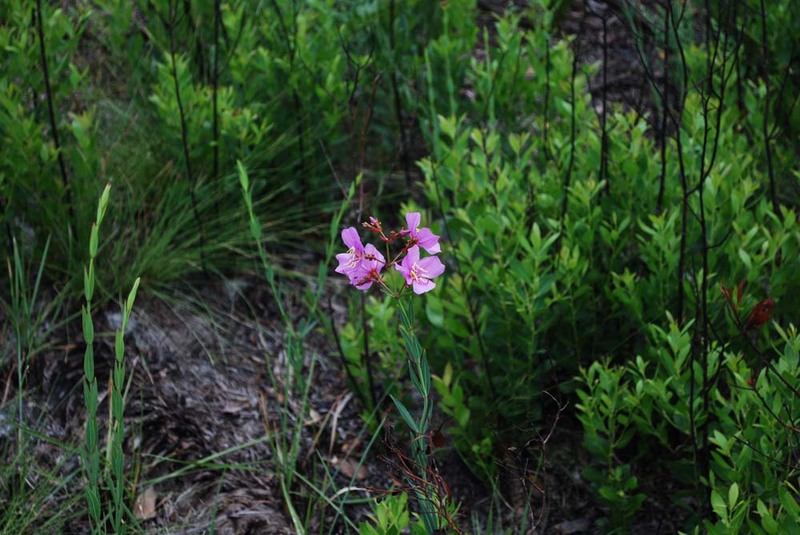 I've read online that pink forms are rare. 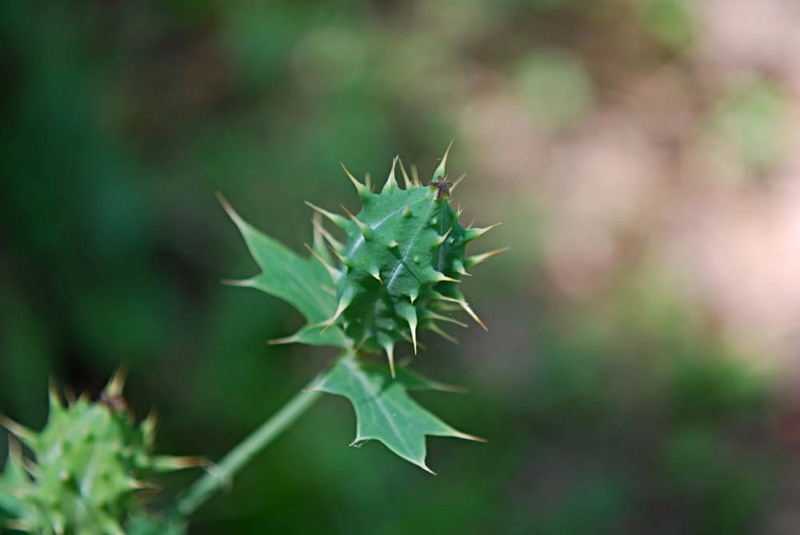 Looks devilish, doesn't it? 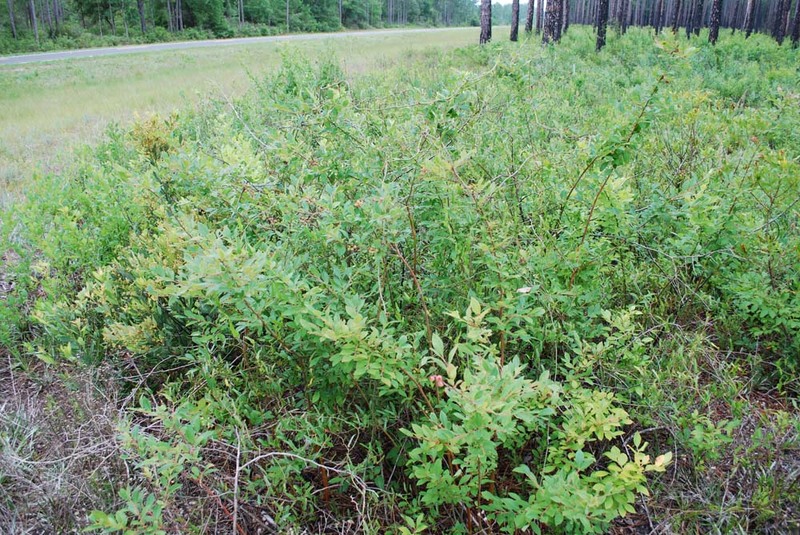 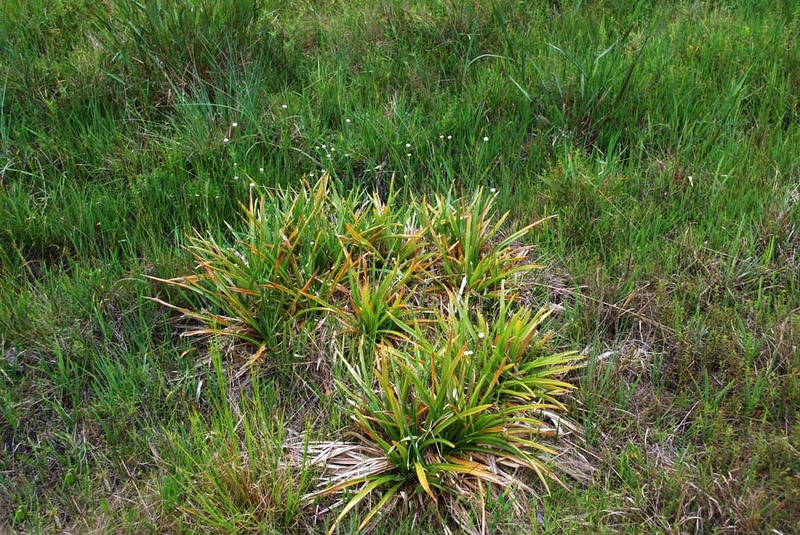 An invasive species, commonly seen along road edges. 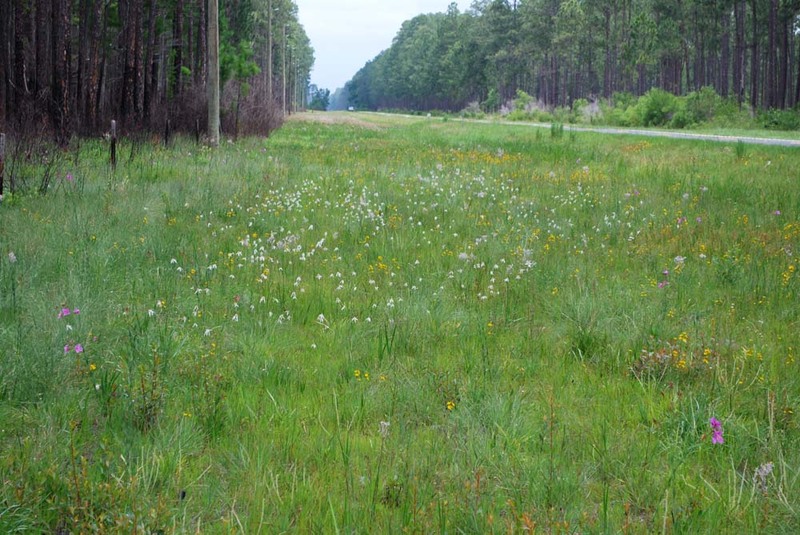 Several views from one spot along SR 65, showing a large patch of starrush whitetop and scattered savannah meadowbeauty, yellow meadowbeauty, and golden crest. 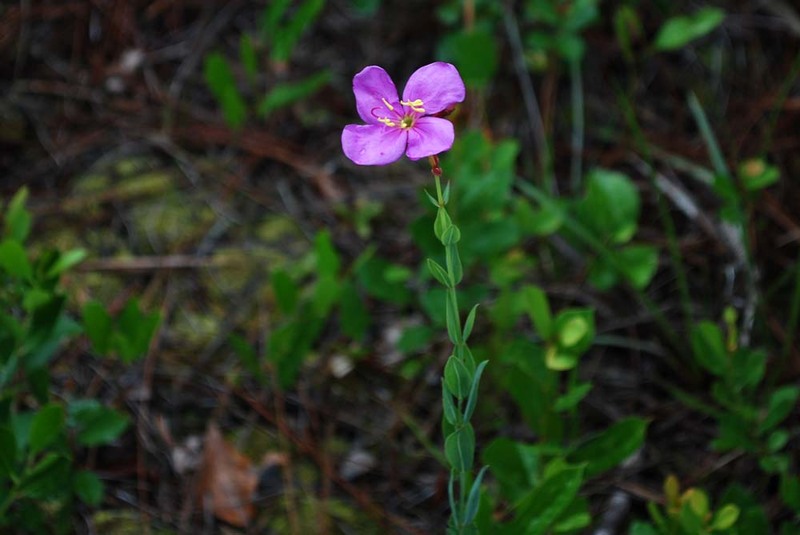 Photographed on exiting Wakulla Springs State Park. 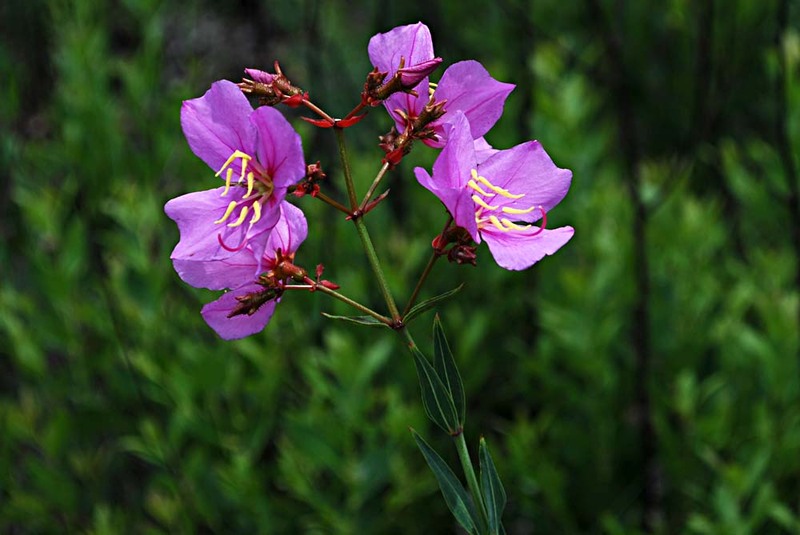 This and the following 7 species were photographed at Florida Caverns State Park. 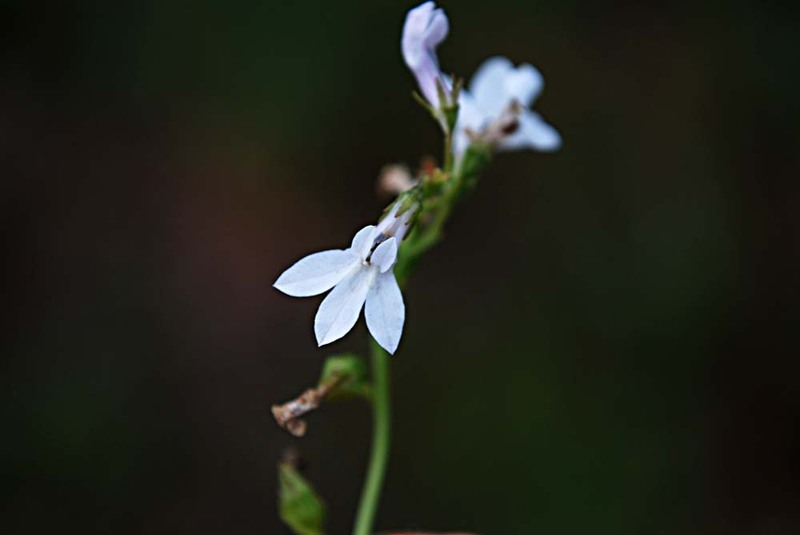 We found several of these small, white flowers along the walkway leading to the visitors center at Florida Caverns State Park. 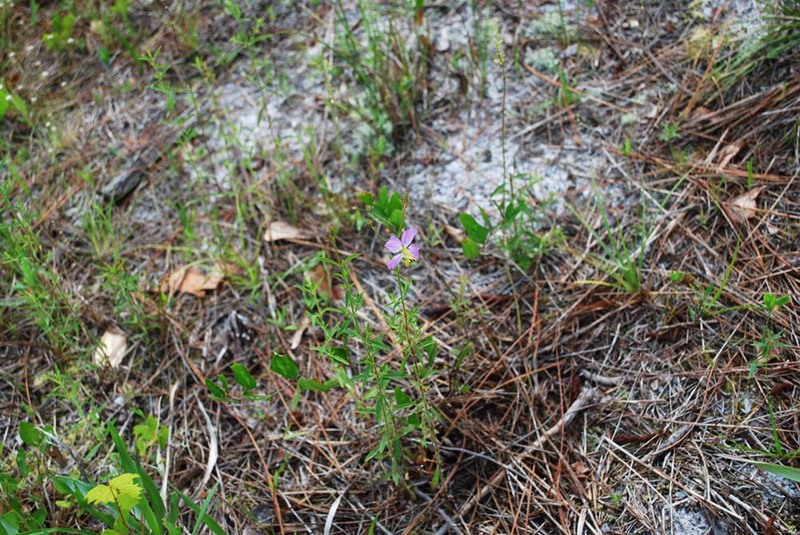 I appealed to panhandle wildflower expert Jeff Norcini for an identification. 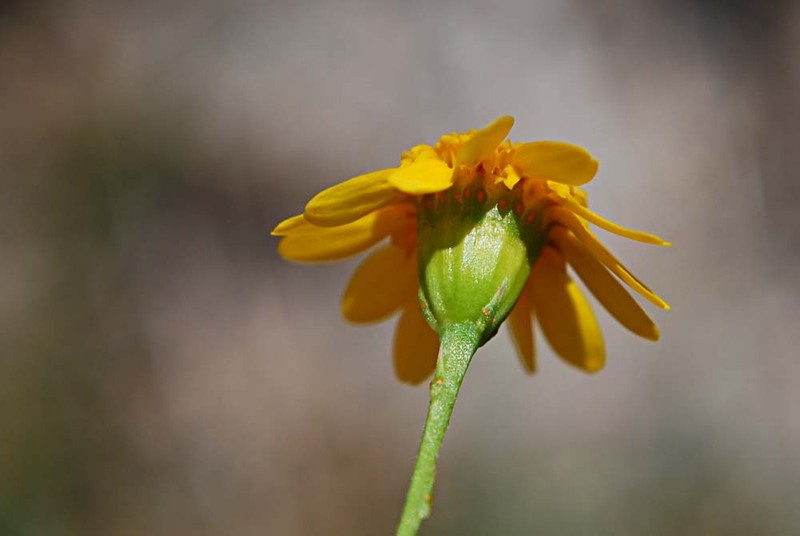 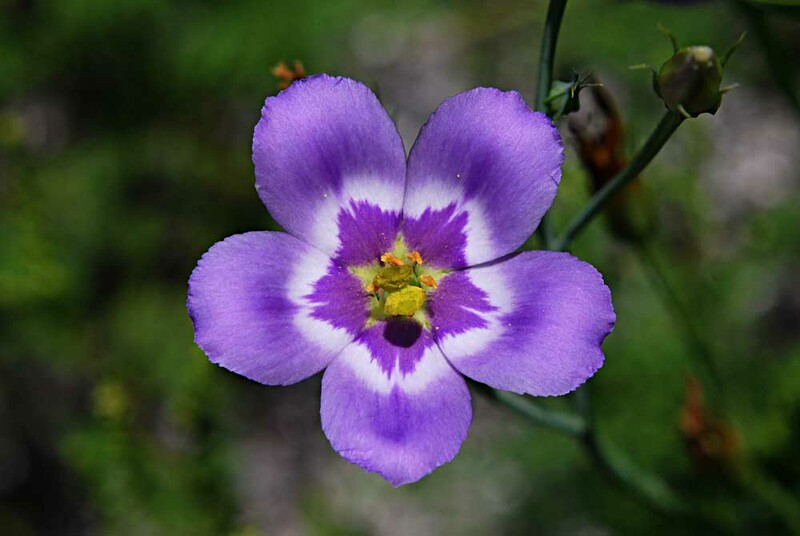 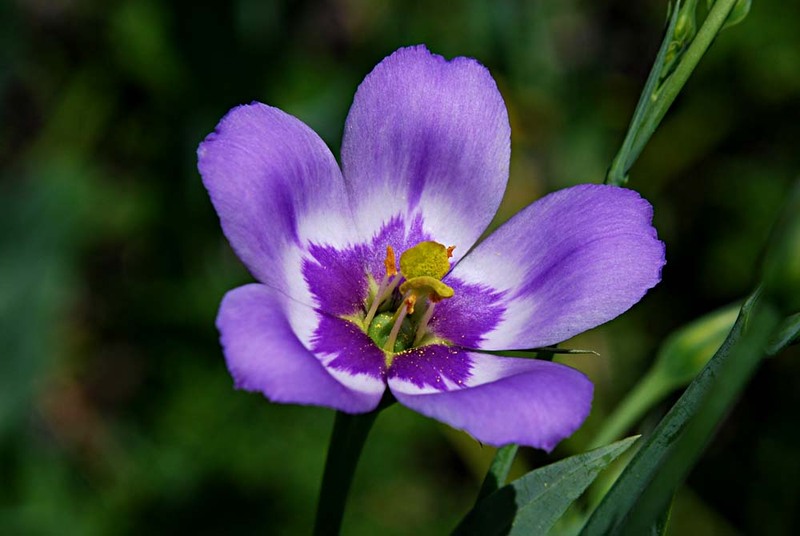 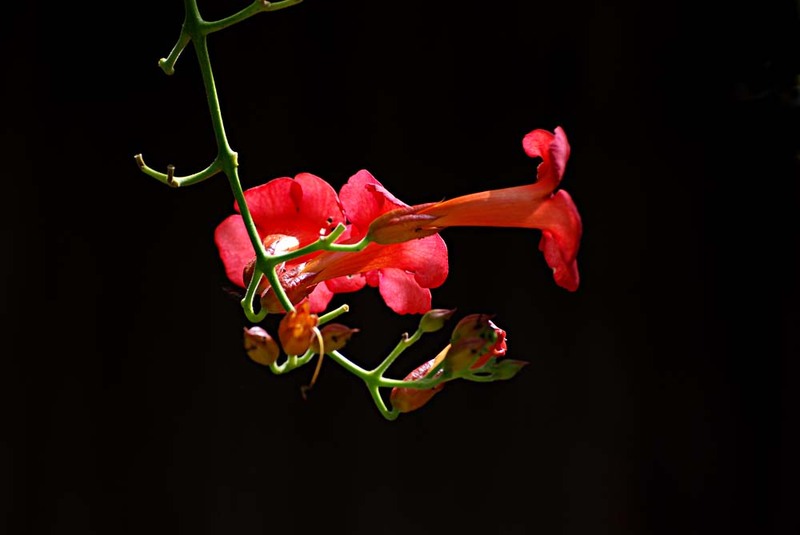 Jeff sent it to Gil Nelson, another panhandle expert, who identified it as Yeatesia viridiflora. 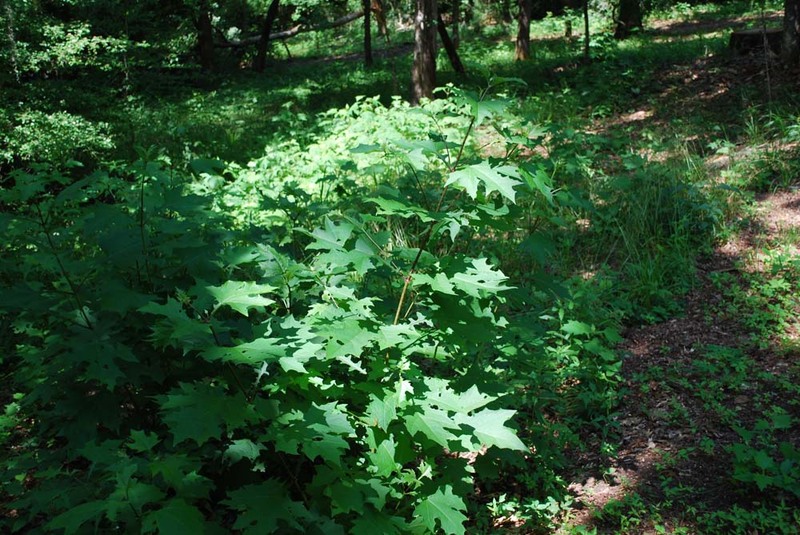 He guessed correctly that I had found the plant in "more or less rich woods with a pretty good canopy." 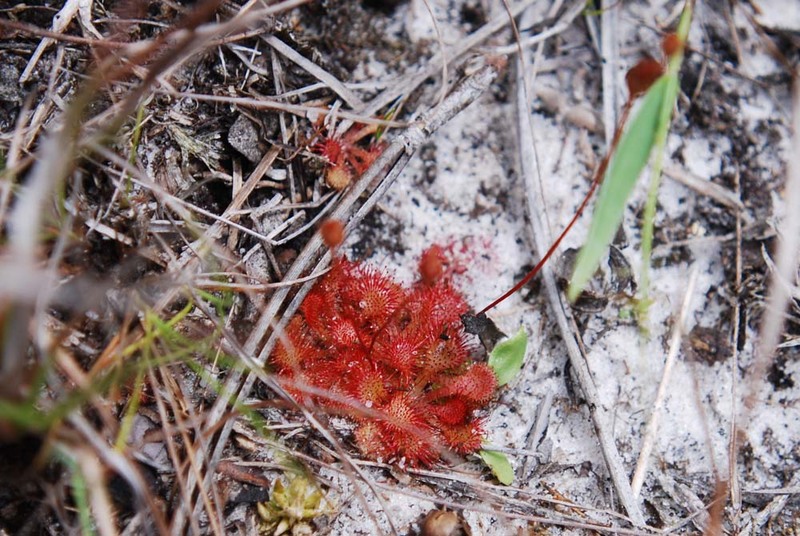 In Florida, it has been found in only 4 counties, all in the panhandle. 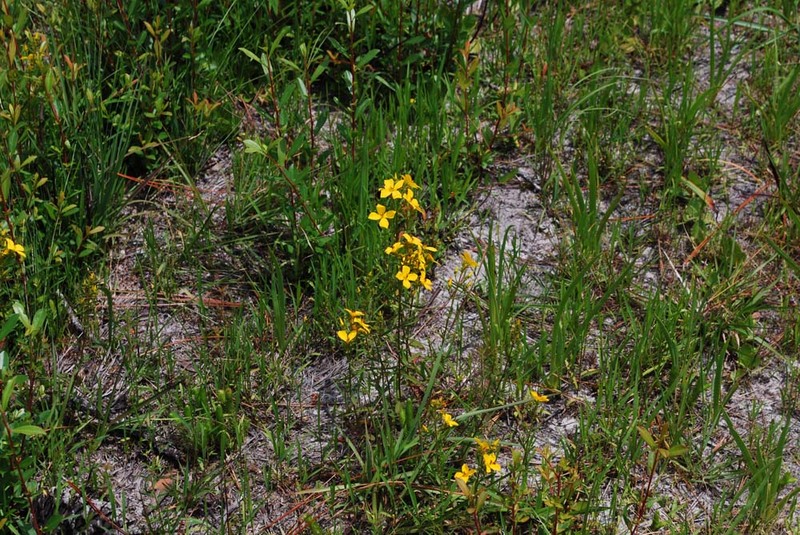 One of the counties is Jackson, which is where Florida Caverns is located. 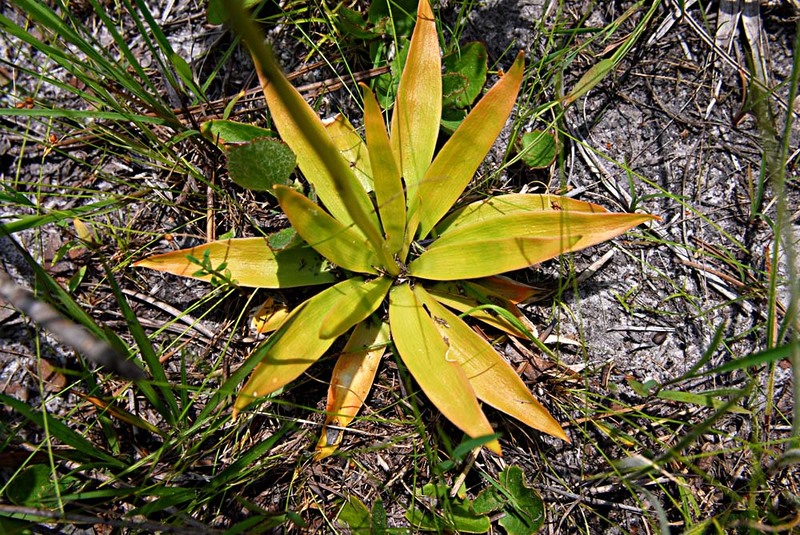 One of the park rangers called this plant "bear-paw," from the shape of the leaves. 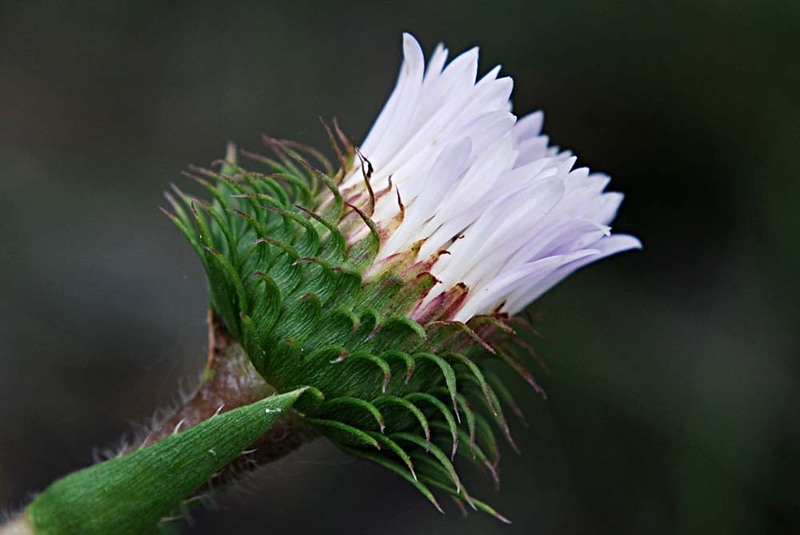 It is also known as "bear's foot." 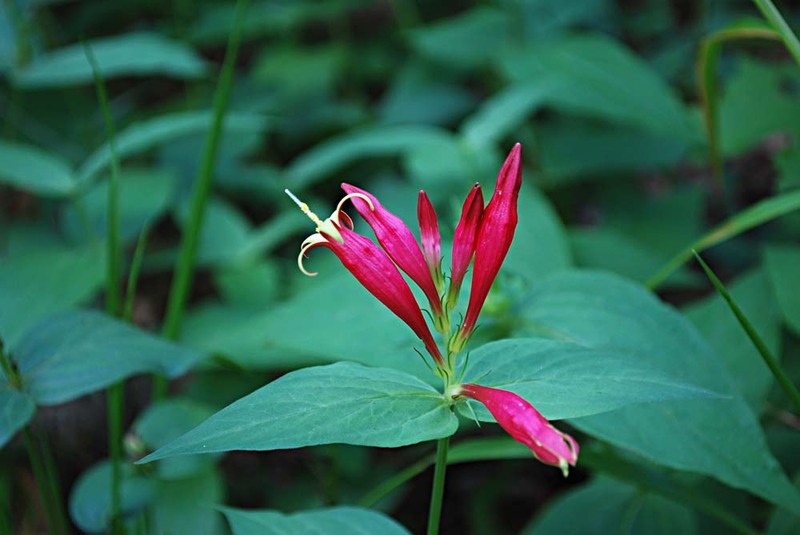 The park ranger called this "indian pink." 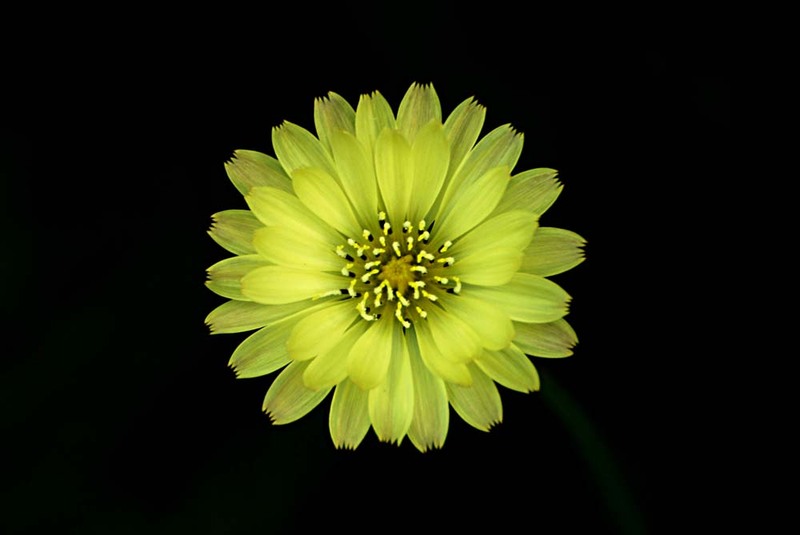 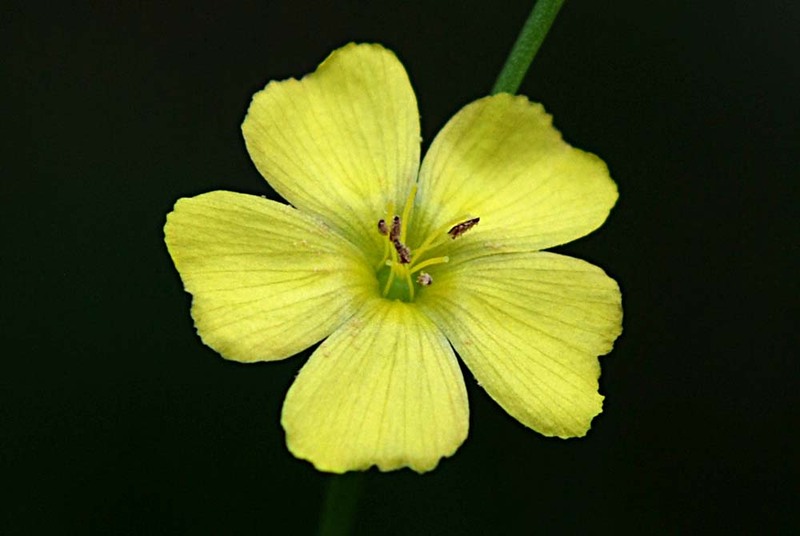 The inner surface of the floral tube is yellow. 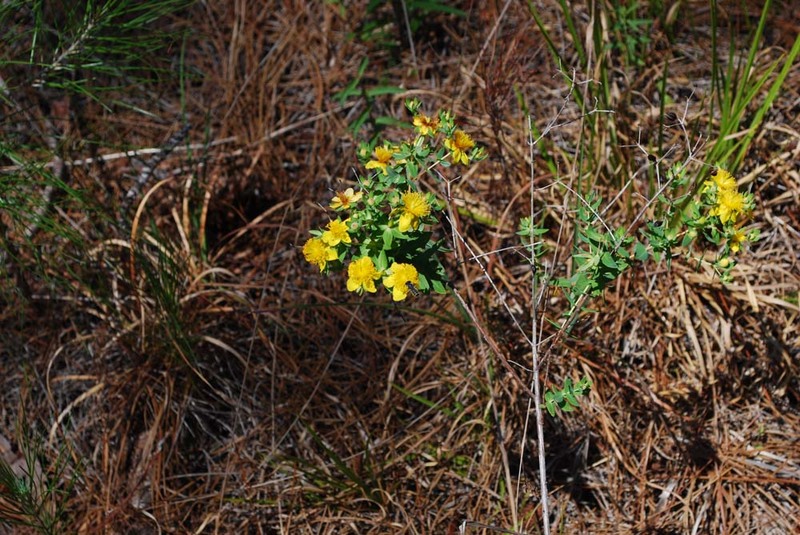 A common species of ticktrefoil. 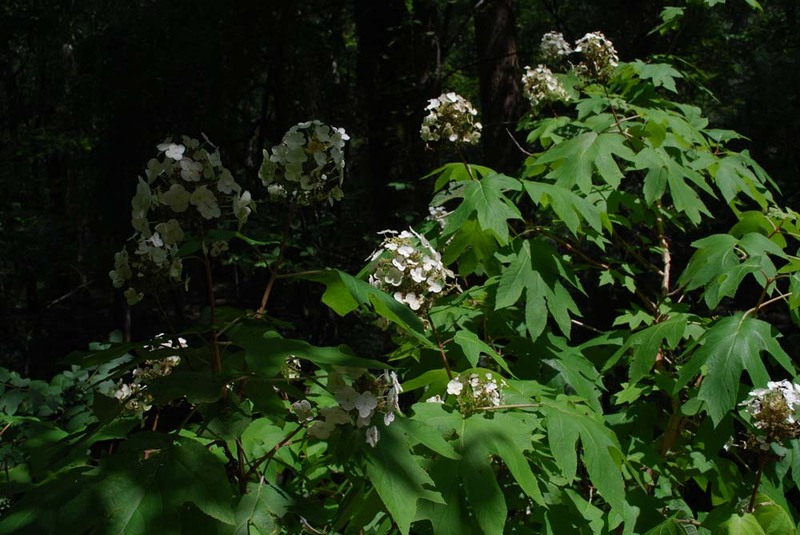 Mayapples were done blooming (as were the columbine). 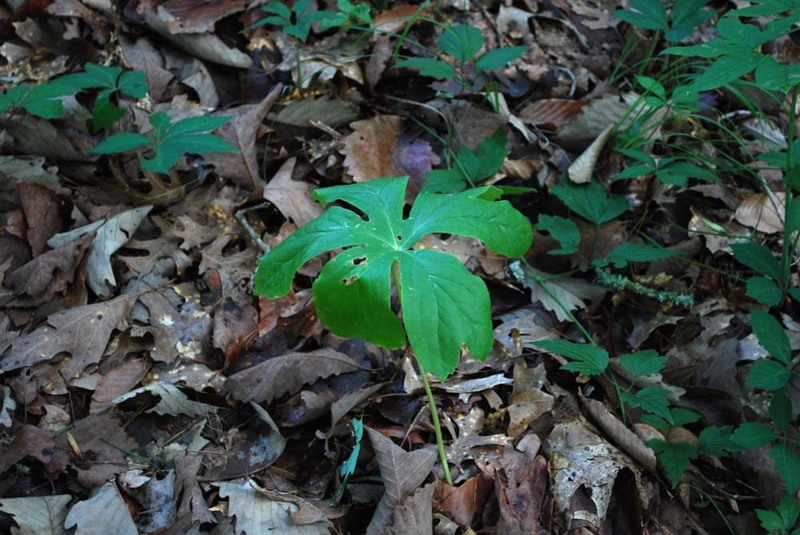 In Florida, mayapple is found only in Jackson County (where Florida Caverns SP is located). 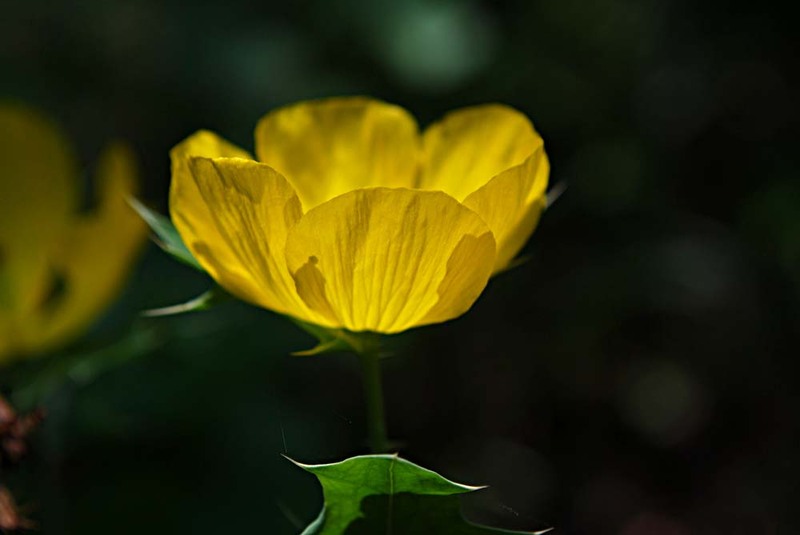 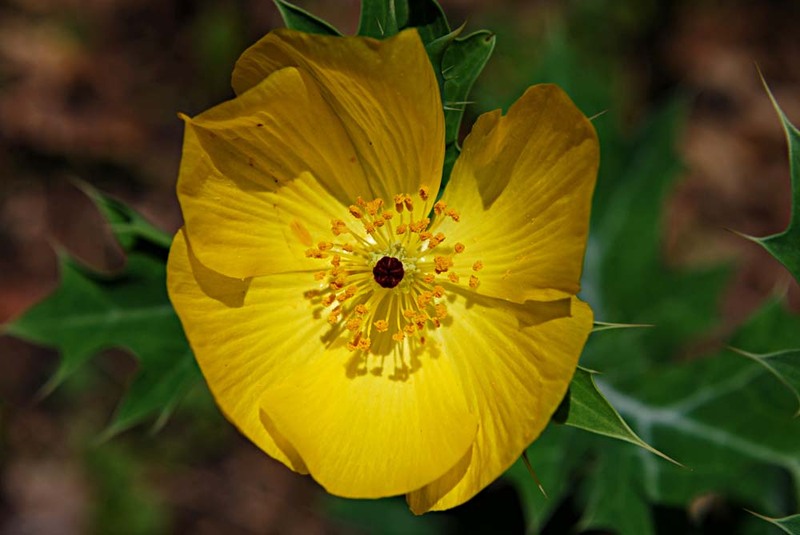 We found this native yellow poppy near the parking lot at Florida Caverns SP. 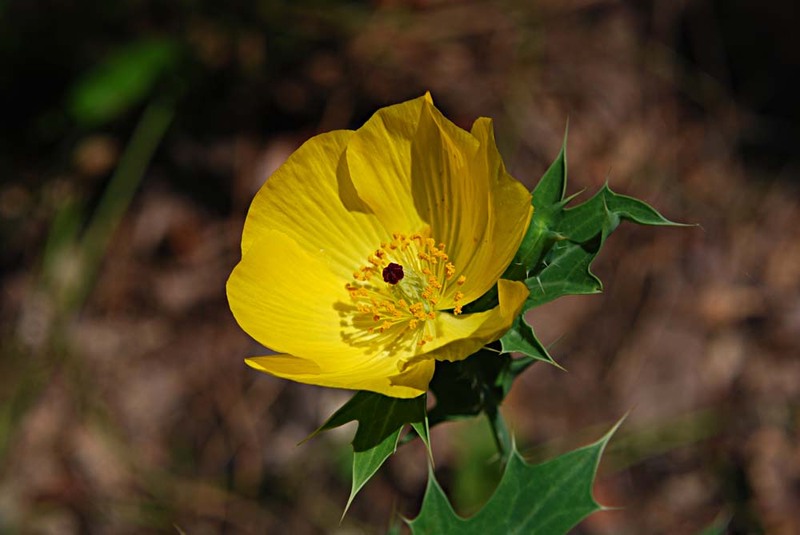 We saw lots of the more common white prickly poppy (Argemone albiflora) along the roadsides traveling to the panhandle; however, there was never a good place to pull over to photograph them. 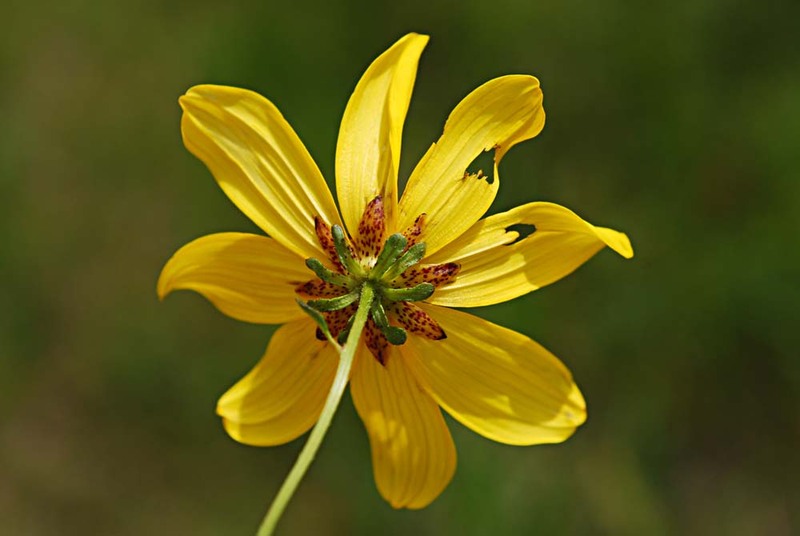 This and the following 5 species were photographed on SR 65, north of where it intersects SR 12. 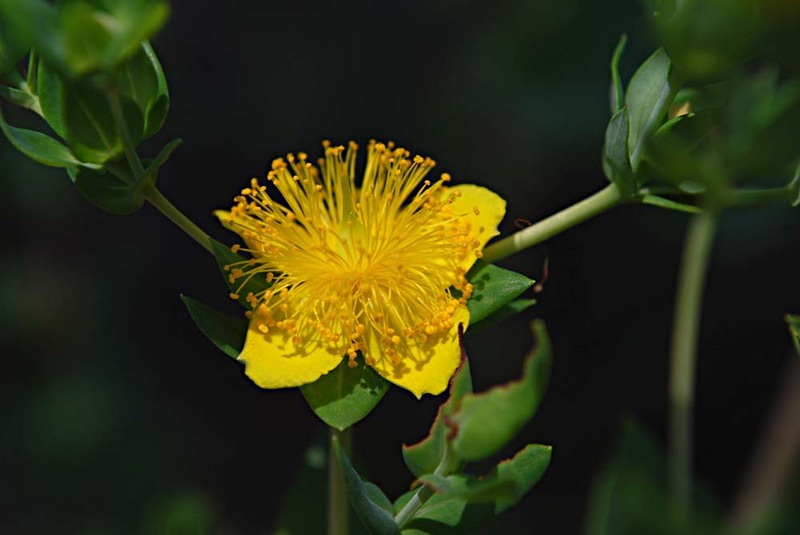 The FWF Wildflower Survey lists 7 species of Hypericum; however, none of them seemed to match the photos of this plant. 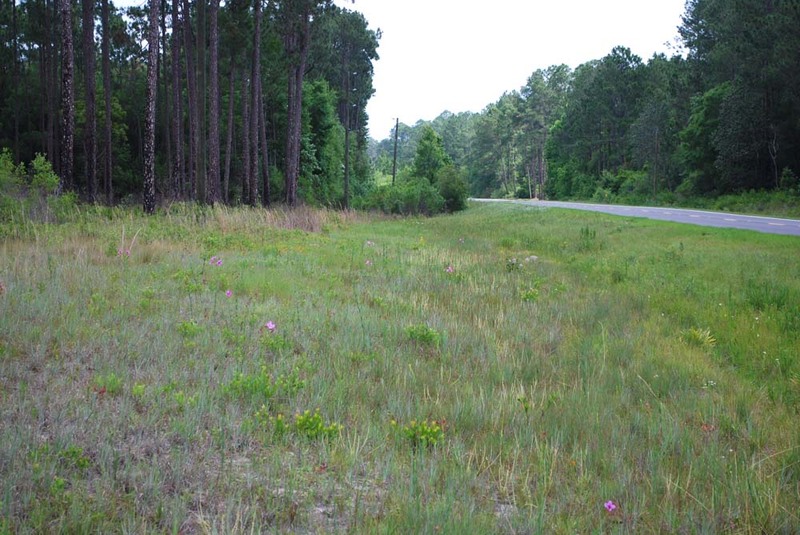 Along SR 65, north of intersection with SR 12. 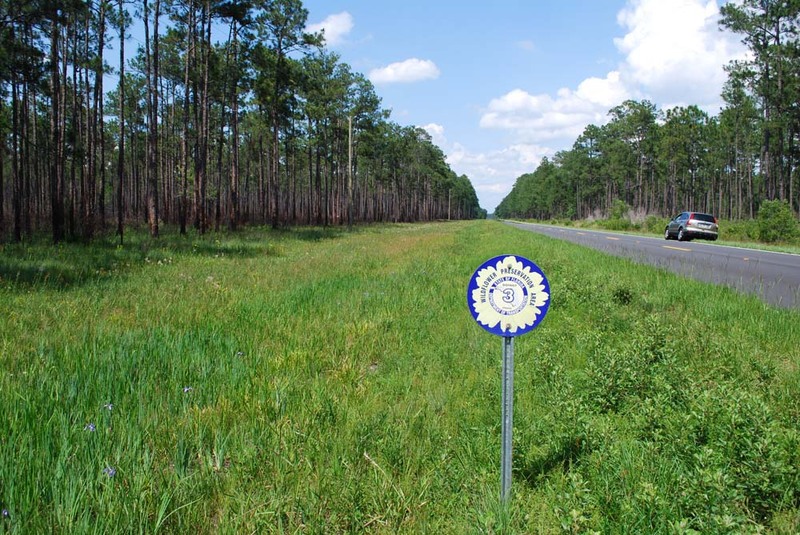 The left-hand photo shows one of the Florida DOT "Wildflower Preservation Area" signs. 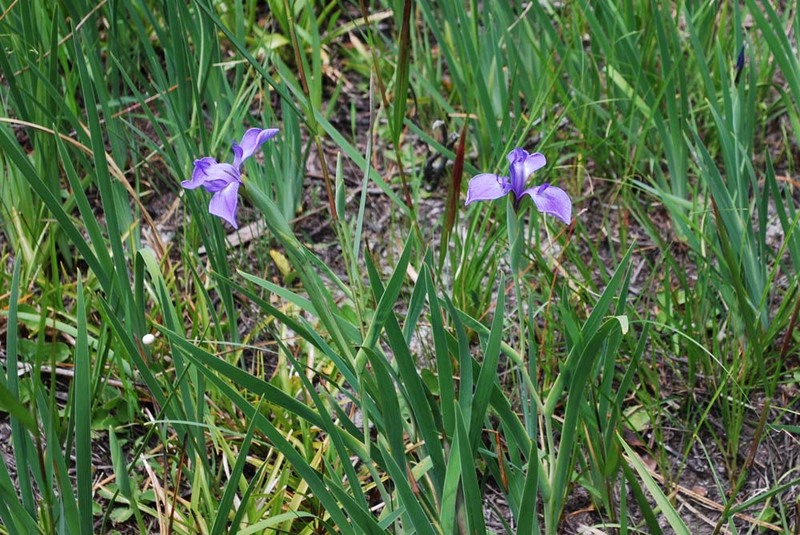 Also seen are iris and golden crest. 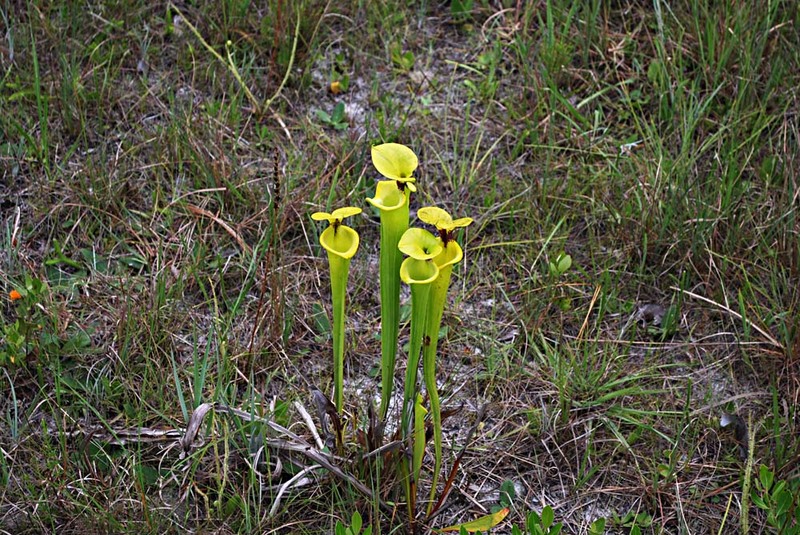 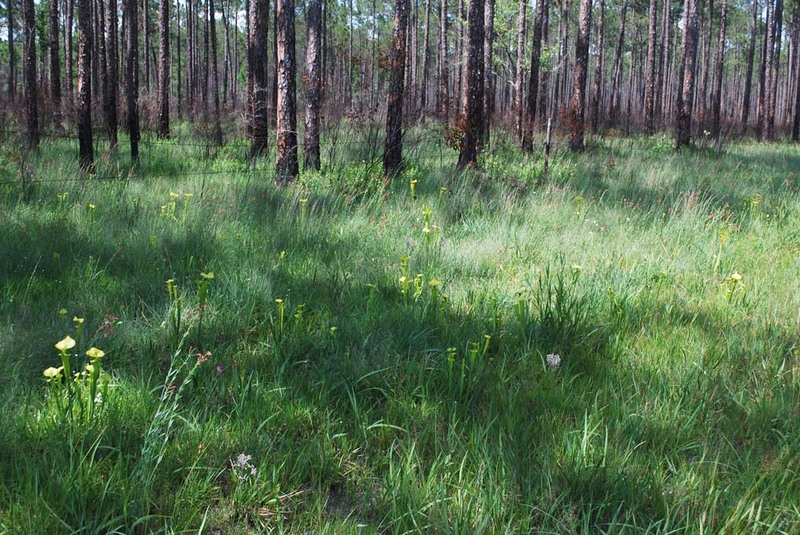 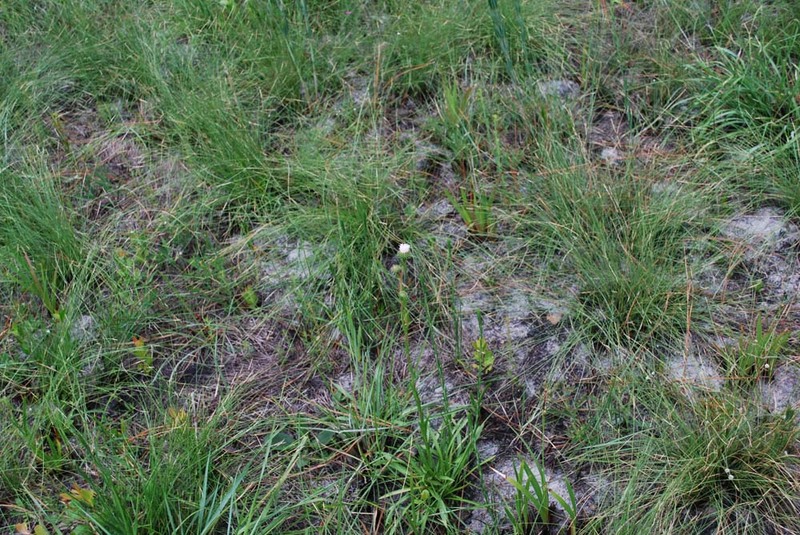 The right-hand photo shows a large number of yellow pitcher plants, and scattered savannah meadowbeauty and golden crest.